This is the fourth of five outline accounts dealing with what I consider to be the five defining areas of model-making work; main construction, fine construction, modelling/shaping, creating surfaces and painting. I’ve written these overviews in preparation for teaching sessions at RADA ( Royal Academy of Dramatic Art ) in London. 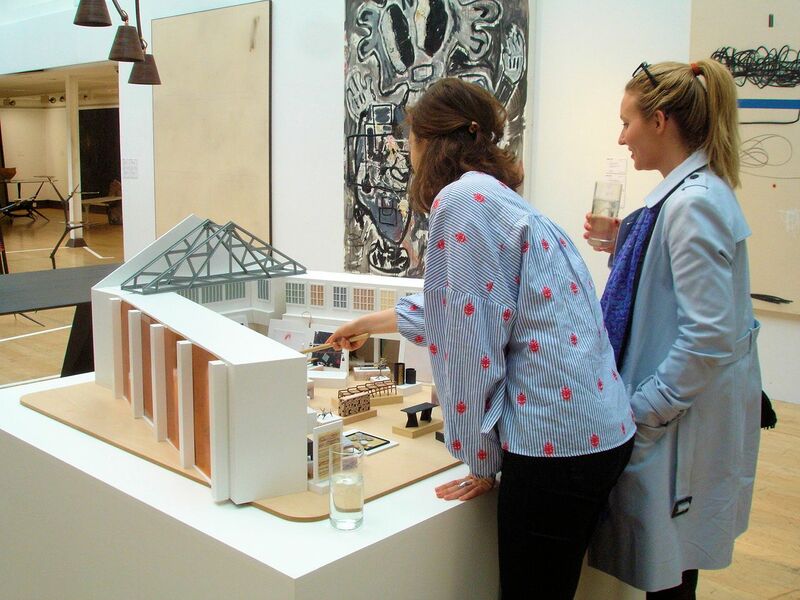 So they’re tuned towards the specialities of theatre design model work, but most of the points will be relevant in general terms to model work in other disciplines. I’ve started with the general ‘themes’ or requirements of the subject, followed by more specific and practical guidance on the materials and methods which can be used. 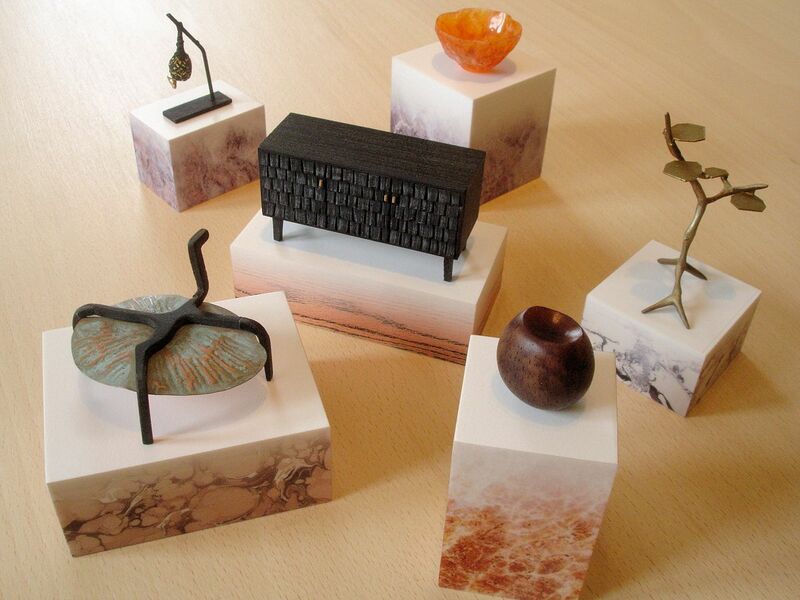 Surfaces in the model can be created by a much wider variety of means than most people realize. 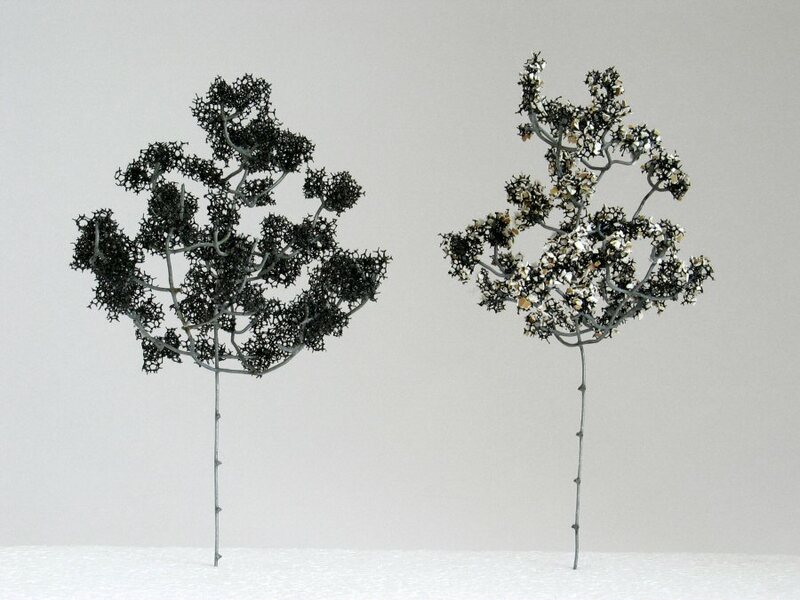 Although theatre design models are expected to survive the distance of their short run through the production process, they are not oppressed by the need to last forever, which opens up a much wider choice of materials than a sculptor would normally trust. There’s a huge choice therefore .. but people generally narrow it down by developing their own preferences. 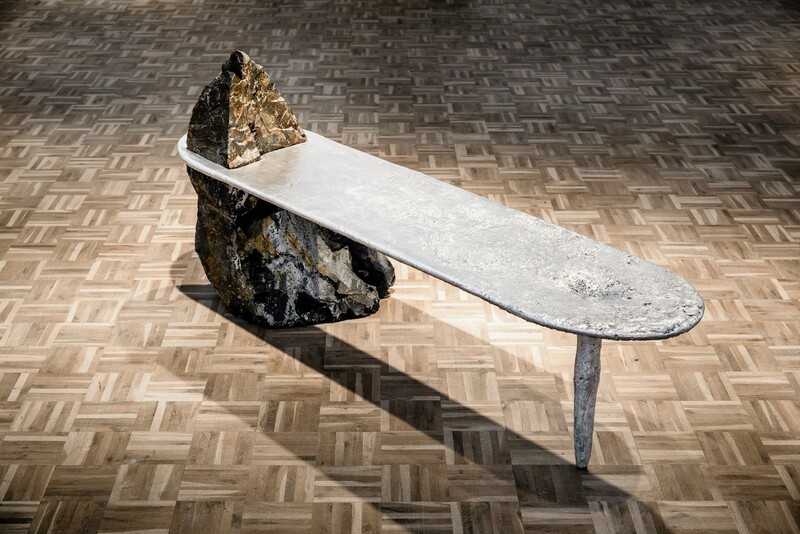 I think the choice is also quite personally directed from the beginning .. are you a ‘breaking down’ or a ‘building up’ kind of person, or do you prefer to let ready-made surfaces do most of the work? 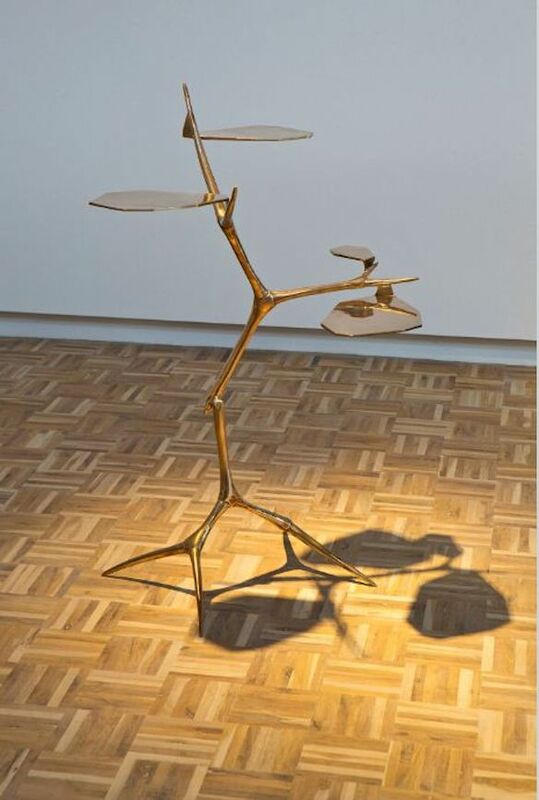 If one can speak of ‘grammatical rules’ in the language of model-making, the subject of surfacing/painting taken as a whole has some of its own ones. 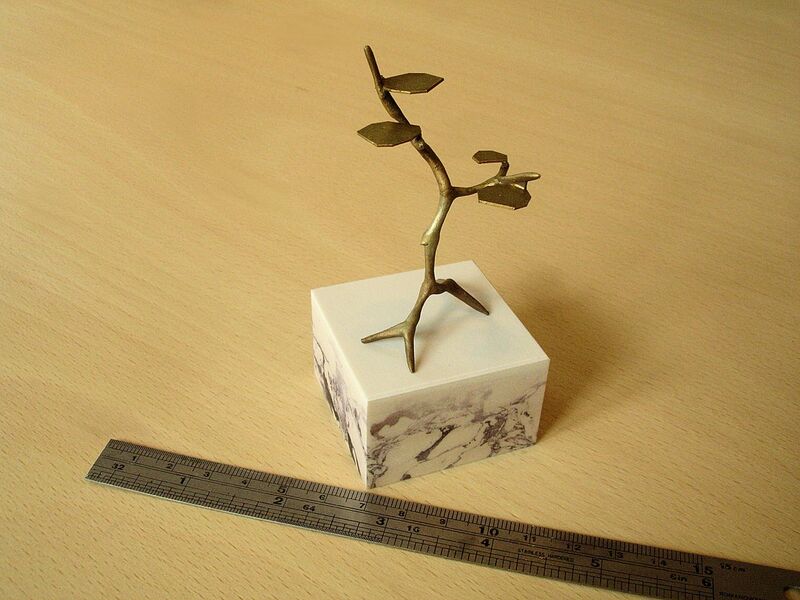 For example, whereas structures require quite a strict attention to scale, the rules can be bent when it comes to the representation of surfaces. This is for a number of reasons .. firstly it may not be possible to represent the subtle intricacies of a surface at that scale; secondly, even if one could manage it, those intricacies might not be readable anyway, and the last, probably most important reason, has to do with the artifice of theatre itself and this needs a bit of explanation. Theatre is artificial, but like most other art-forms one of its aims is to convey what’s ‘real’ to us in a different way to how we usually receive it. Theatre employs its own characteristic means of balancing what we recognise as real with what we are meant to distinguish as artificial. So for example when an actor moves to the front of the stage to deliver a soulful monologue we are not meant to assume that his character has just happened to notice the audience or that everyone else on the stage can hear him. These are his private thoughts but they have to be spoken, otherwise we wouldn’t get them. The monologue is a device, a theatrical convention that we are meant to accept but not take literally. The representation of a location on stage is equally artificial and equally a balance of real and unreal. We may be presented with a fairly detailed ‘slice of life’ on stage but we accept that we can see the cut edges of this, in the same way we accept that a living-room may be missing a wall just to give us a good view. If we take what we see too literally (and sometimes, if it is depicted too literally) it may not make sense. It may break the suspension of disbelief that it is trying to maintain. A classic example of this is when live animals are used on stage. A live goat is the real thing .. what could be a more convincing goat than that? .. but it’s also curiously out of place there, and we devote too much of our attention to wondering whether it’s going to behave! The same things apply to the representation of surfaces which are meant to signify sometime real but which we know are fake. The objective for the designer is not to fool anyone into thinking that a real wall has been transplanted onto the stage but to make such a good job of conveying the essentials that the audience can happily forget about the distinction. 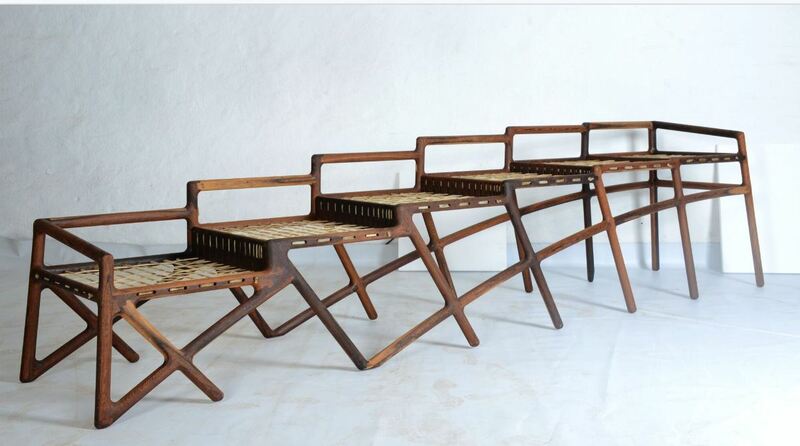 It may even help if it looks a little stylized, or obviously artificial, so that it sits comfortably with the rest of the artifice and so that we are not as distracted as we were by the live goat. In this context realism is achieved by design rather than exact copying, and relies as much on the power of suggestion as truthful depiction. If an impression of realism is intended the designer needs to understand all the ingredients that go together to make the look .. whether it’s a whole bar-room scene or a single brick wall .. and distill that recipe down to a more concentrated form. Do you see how the model can help with this? 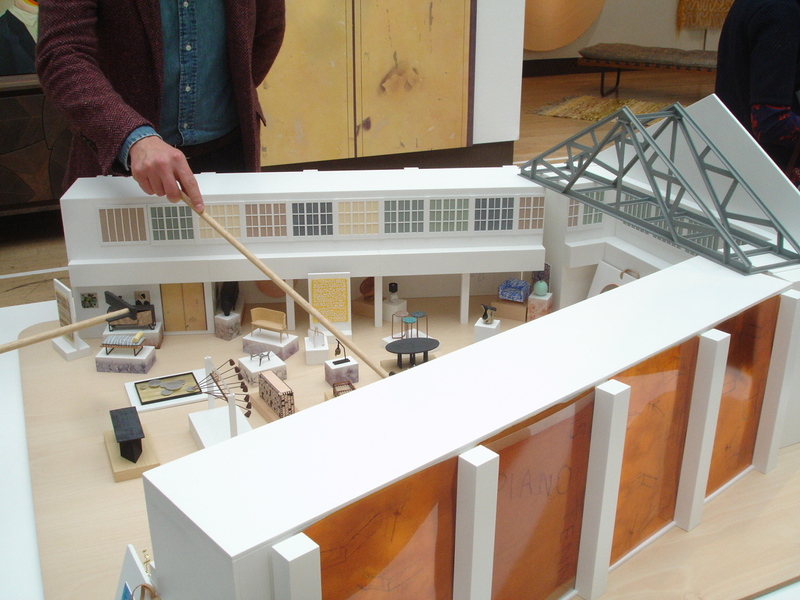 .. having to make a small-scale model is an integral part of this process of concentration. It’s not possible to include every detail .. the model becomes the filter! I’m starting with, as I said, some general ‘themes’ behind the subject of creating surfaces .. ways of thinking, rather than ways of doing .. but then I have selected specific materials or methods which represent the different ways of approaching surfaces .. breaking down, building up, covering with ‘ready-mades’, sprinkling into glue and digital prints. Many of the better photos used here are from my book Model-making: Materials and Methods and were taken by Astrid Baerndal. 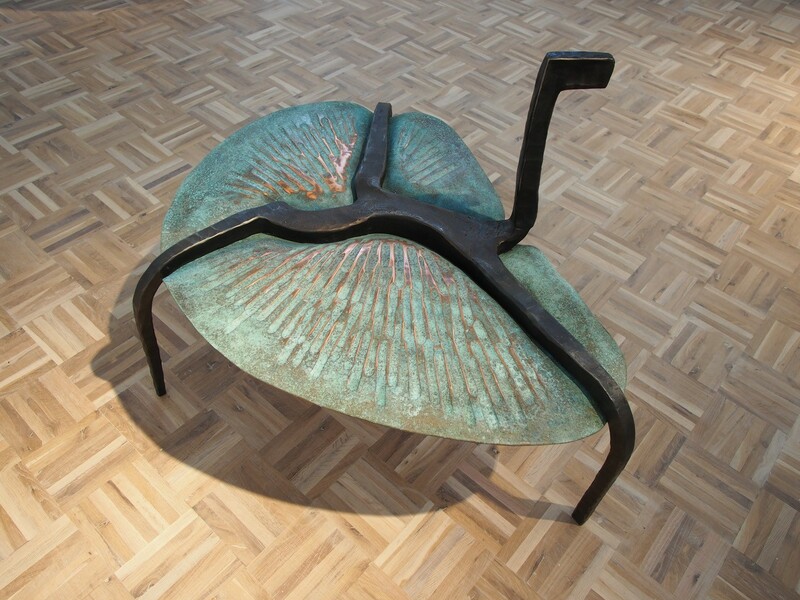 This will always be one of the foundation stones of this work, at whichever stage of the process. In one of the previous posts in this series I asked whether anyone of a right or responsible mind would try to make a believable Louis XV chair without looking at visual references. Similarly nobody would try to recreate the walls of Versailles without researching, yet we all feel a bit differently when it comes to creating a simple brick or plastered wall. The fact is that although these may not have as many specifics as the walls of Versailles, they still have some which can’t be just imagined! The way things ‘weather’, decay, or even just get a little used have specific visual characteristics according to location and these must be investigated as far as possible if one wants to keep them convincing. As I’ve already said, this doesn’t mean that ‘the look’ won’t be simplified or condensed in the end .. but only after one has a clearer idea of the true ingredients! However, whereas one can usually trust that a photo which is captioned ‘Palace of Versailles’ comes from a very specific location (if not of period), one has to be more critical when looking for information on more general surfaces. Doing a Google search using the terms ‘old plaster wall’ or ‘decayed wall’ etc. will bring up a whole variety of images, some of which might well be very helpful in refining your perception of what looks convincing, but many of which could be misleading! For example the photo above comes from the (by far largest and best) free database of texture and surface photos www.cgtextures.com and can be found under ‘Plaster’ in the sub-section ‘Leaking’. There is no other information provided, such as where the photo was taken, what sort of building it was or whether this is an interior or exterior wall. We have to take it on trust that this is actually ‘plaster’! We can all make certain reasonable guesses that it must be exterior and that it has a lot to do with the action of water, based on clues in the photo combined with what we might have seen before, but without more specifics we’re still guessing, making assumptions .. and the result is a stereotype! Are you happy to work within and reinforce that realm of assumptions and stereotypes, or would you rather get closer to the truth, at least in terms of how things really look? 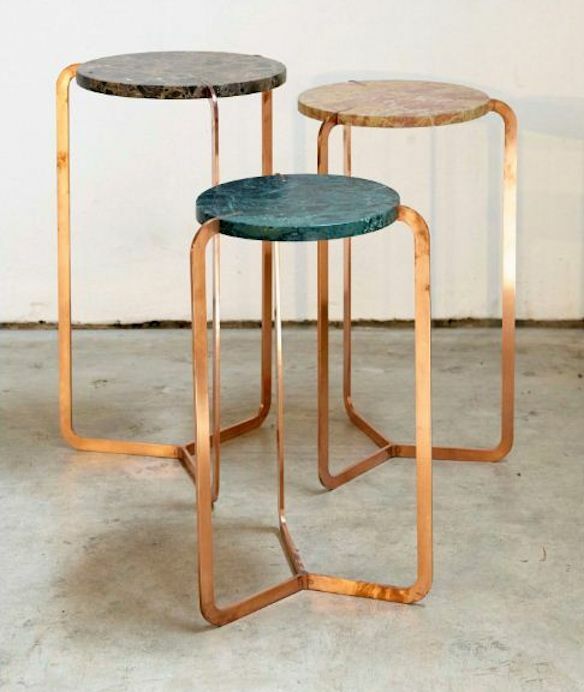 Apart from specific visual references which may be collected as-and-when needed, a theatre designer also needs to build up a certain amount of general knowledge on the subject of common surfaces. 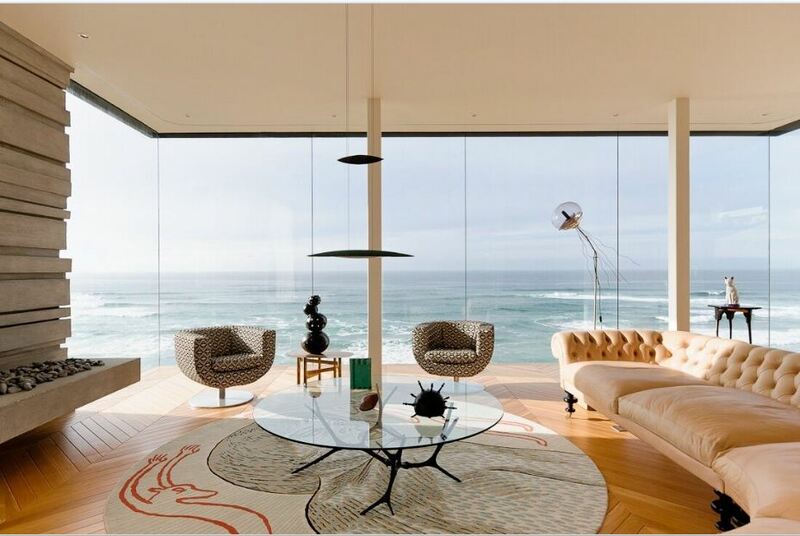 Things like the standard size of bricks and their common patterns or bonds, usual widths for floorboards or how wood panelling is usually arranged. For example mistakes are often made when representing brickwork not only in getting the size wrong but also by not knowing the basics of the different brick patterns and the reasons for them. I explain these and provide template guides for marking out in my article brickwork patterns in the Methods section. It’s not easy to predict what a surface texture will look like until it’s sampled, and it’s harder to predict how paint will behave on it! 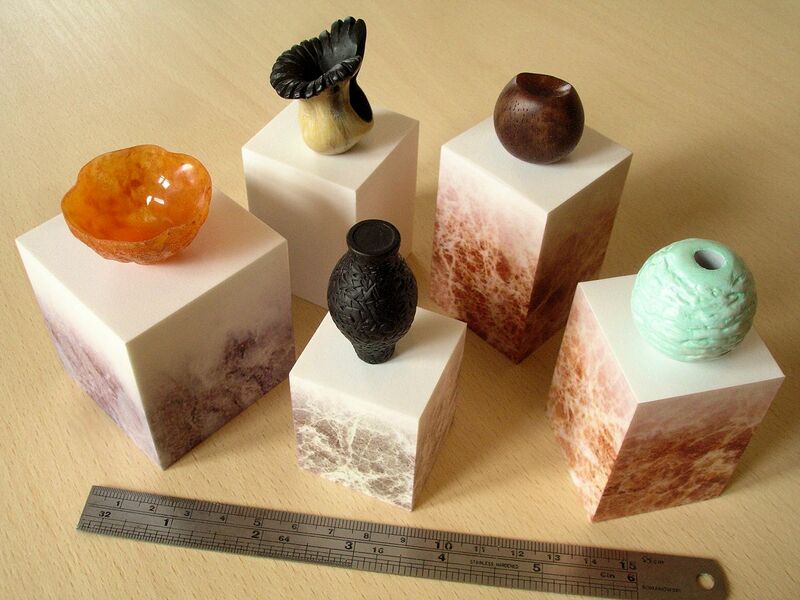 Even using just one material to create a surface may involve a number of operations or stages, each of which could be done in a number of different ways. So it’s important to experiment .. to rehearse how to achieve the look you want and explore the variables, before you commit to doing something irrevocable to a piece of model you’ve just made. Because painting is even more unpredictable you should also paint at least a part of your surface sample before going further .. it’s best not to cover all of it so that you have the comparison of painted and unpainted for future reference. Although I try to separate ‘creating surfaces’ and painting up time-wise, as subjects for teaching, and because they involve their own materials and methods to an extent, in practice they are inseparable! Some materials chosen as surfaces need no ‘painting’ as such, just a little changing; some textures dictate how they should be painted and do most of the work for the brush i.e. when dry-brushing; sometimes it’s worth mixing colour into a texturing medium to texture and paint at the same time .. all this brings the painting stage forward in time, at least in terms of testing, which I recommend in the next post as a very good move! 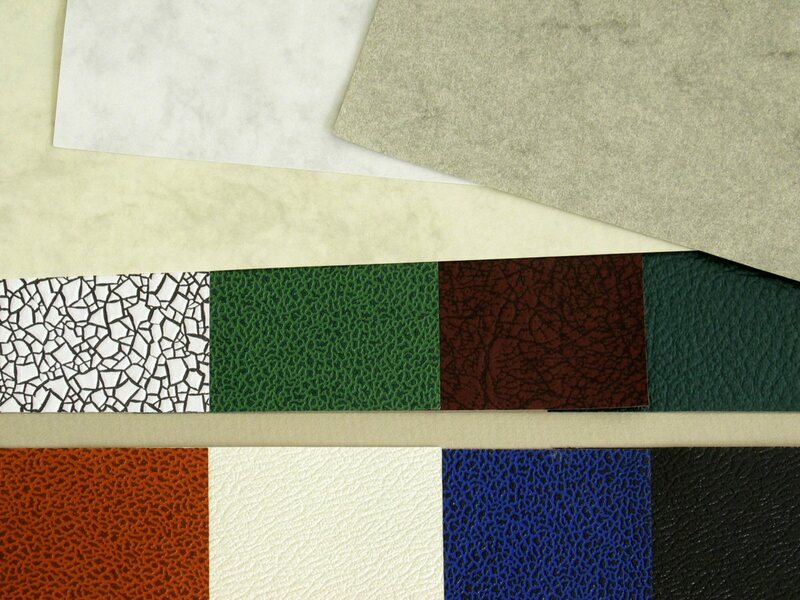 Since you are spending some time on these test swatches it would be silly not to capitalise on that by collecting them in a purposed sample book. Personally, even if your memory is better than mine, I would recommend labelling each sample with basic info outlining the process i.e. which type and brand of material used, which tools used etc. You may have noticed from previous posts that I rarely use the word ‘problem’ preferring words like ‘challenge’ instead. This is teacher training! But I draw the line before ever looking at warping in a positive light! It is always annoying, but sometimes it can be rather devastating! So quickly .. the ways of dealing with it! First one has to understand that all absorbent surfaces (such as paper, cardboard, wood, even foam) will warp when exposed to water, even if it’s in the minimal form of moisture, as they dry out. 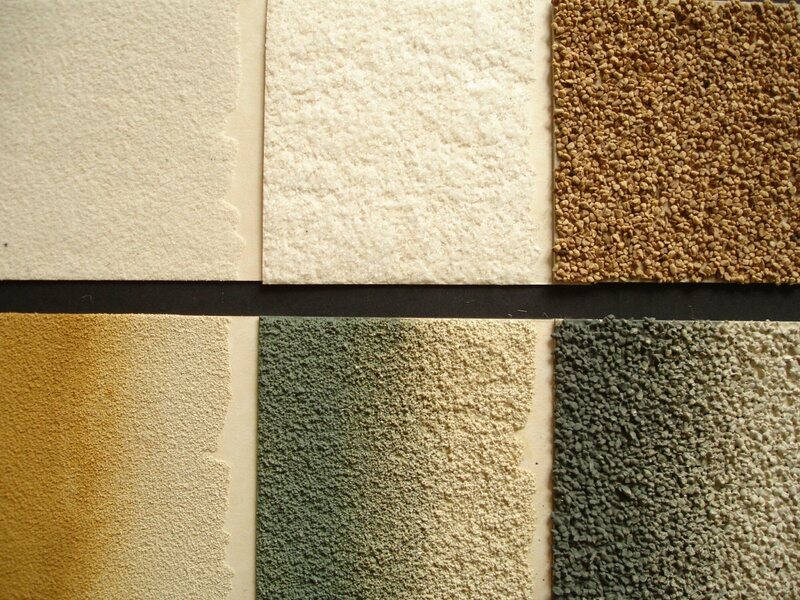 Surfaces which are largely non-absorbent in comparison (such as plastic or metal) will not. The second thing is that those absorbent surfaces will not warp when exposed in the same ways to a solvent other than water, such as white spirit or acetone. Why this is exactly I really don’t know, but there must be reasons. Armed with this knowledge, there are a number of things you can do. 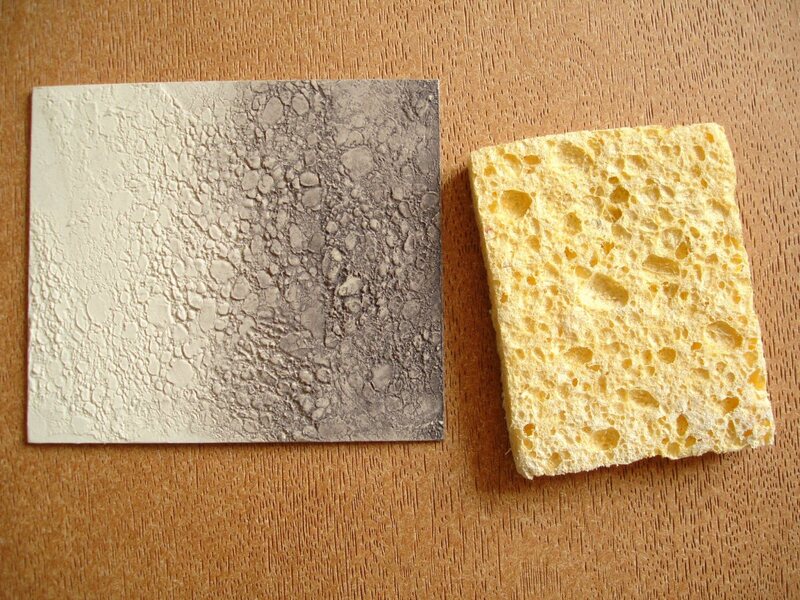 You can make your absorbent surfaces more non-absorbent by sealing them .. by spraying them with a thin coat of spray primer such as Simoniz acrylic primer, for example, or trying anything such as fixative or even hair-spray to seal the surface, as long as it dries properly, accepts texture medium or paint over it and doesn’t contain water as a solvent. I would recommend the Simoniz brand of spray primer above. .. it’s the best I’ve tried. A light spray will be enough to seal the surface and although it touch-dries very quickly it’s best to leave it a few hours before painting. I’ve found that if it is properly dry it will take even thin washes of acrylic without resisting them (unlike the Plasti-kote brand next to it which, true to its name, behaves more like a coating of plastic). 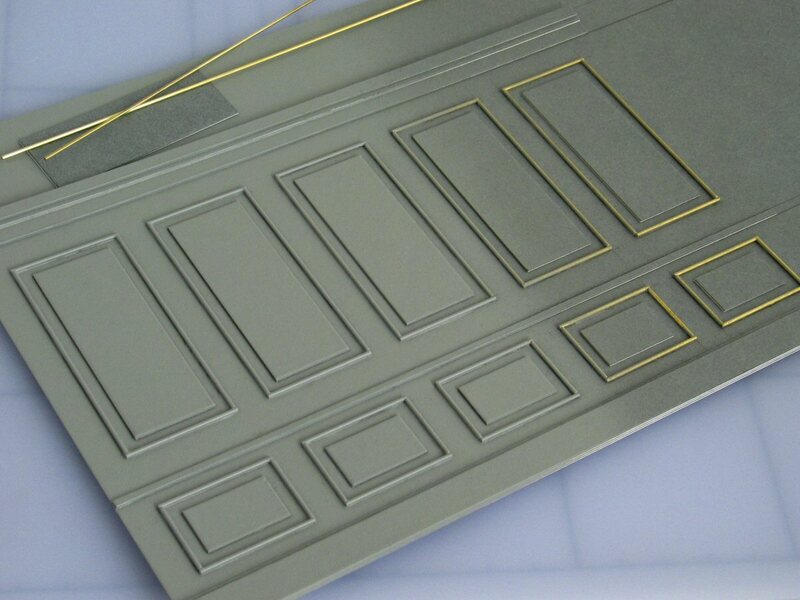 Another way is to spraymount surfaces onto card instead of applying polyfilla or paint to it directly. 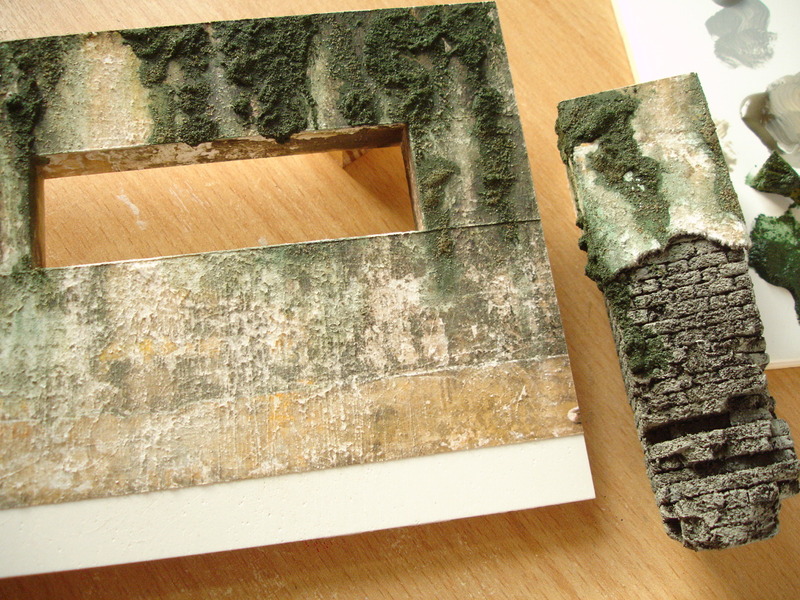 We’ll be looking at some of the options for ready-made surfaces later, but what I really mean here is that you could paint or apply texture medium on thin paper first, letting it warp freely as it dries out, then spraymount it flat onto your constructed pieces. 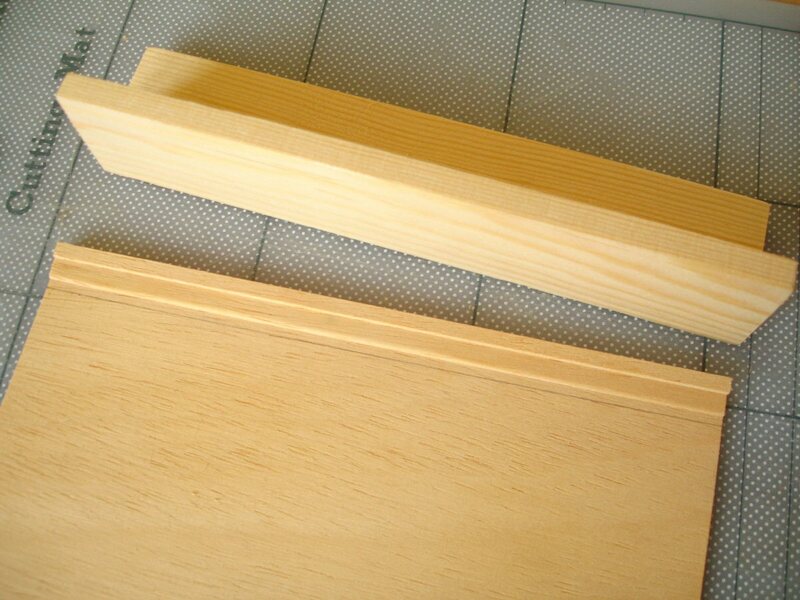 The principle type of ‘impressionable’ foam sheet I use is the foam from the inside of Kapa-line foamboard, but there are other types almost as suitable such as the foam in various types of black foamboard, Depron sheet and Styrofoam. But Kapa-line foam is the best for this in my opinion .. softer, more yielding; takes any form of paint well, and is not affected by the solvents in spraypaints or glues. Most of the points made here and some more can be found in my article Creating surfaces with Kapa-line foamboard in the Materials /- surfacing section. 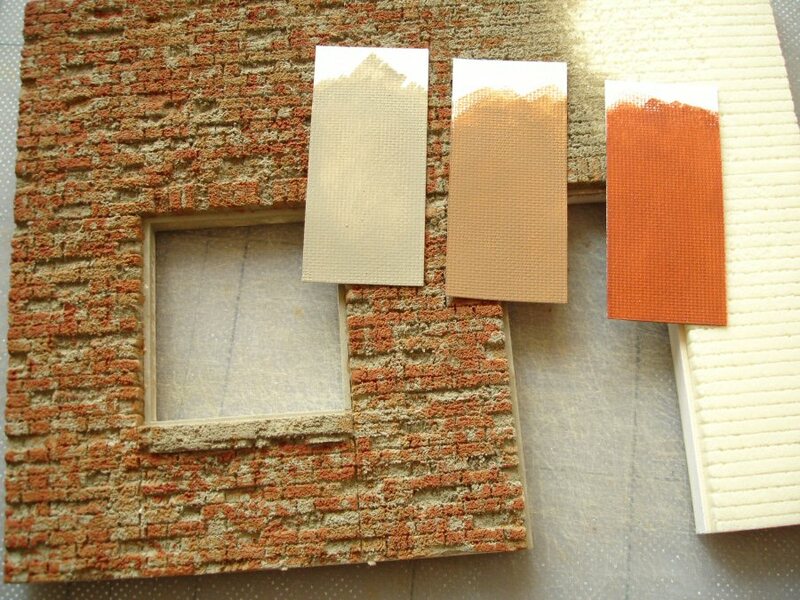 The foam from Kapa-line foamboard is particularly suitable for brickwork at this scale. A pencil point (mechanical type) stroked along it will give a clean, fine impression .. a light, even stroke for newer, modern brickwork or pressing harder to create a more jagged line suitable for older, damaged brick. 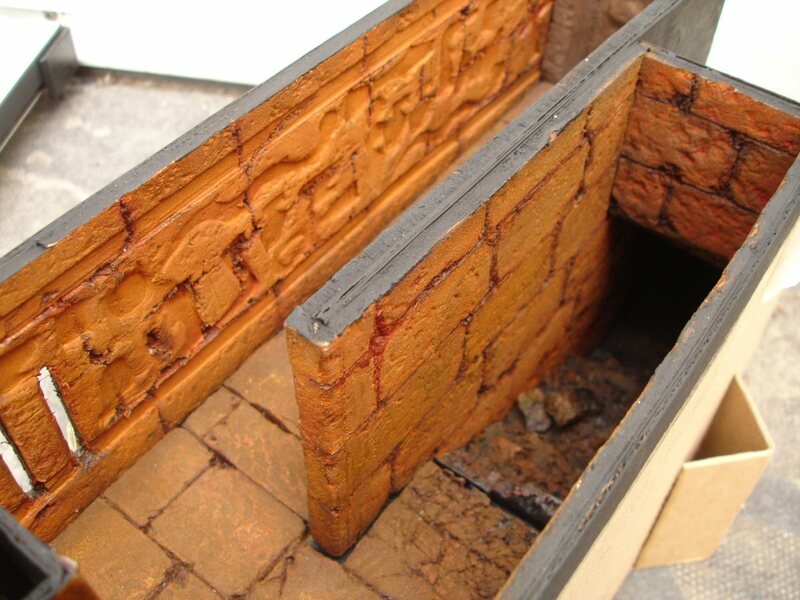 This older, more crumbled look can be further emphasized by breaking the foam surface up with a wire brush or pushing whole bricks in with a piece of wood. 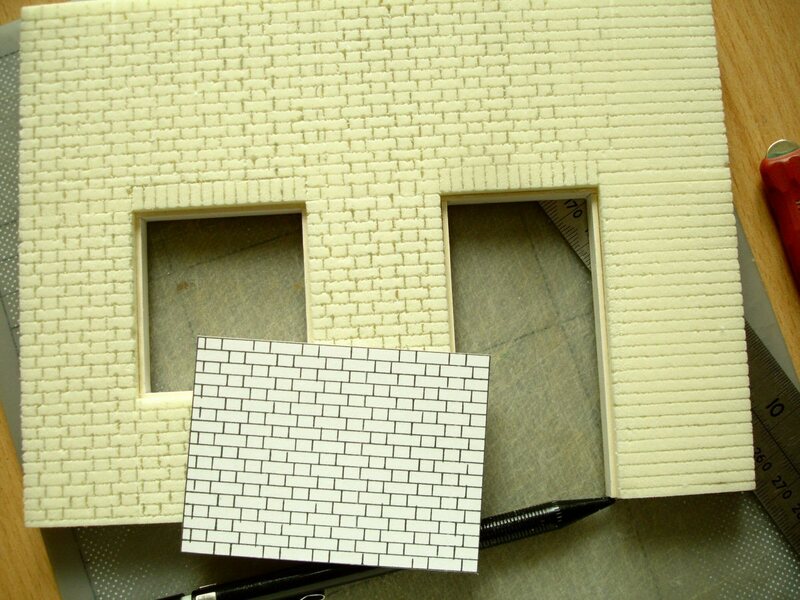 It’s important to get the scale just right and bricks look smaller at this 1:25 scale than one imagines, so I always use a brickwork template I’ve drawn up to transfer measurements and spacings to the foam surface. 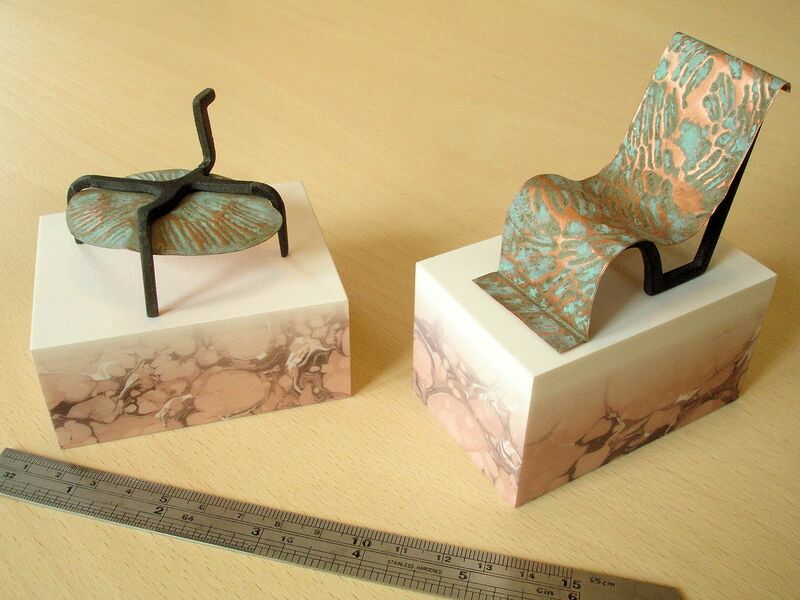 But foam can be used for so much more than just brickwork. Anything can be used to create an interesting pattern suggesting architectural decoration, including oddly shaped dental tools or items of jewellery as shown below. As another example .. I was given a box of hard plastic cake decoration moulds and I think they’re meant to be used for moulding soft icing. 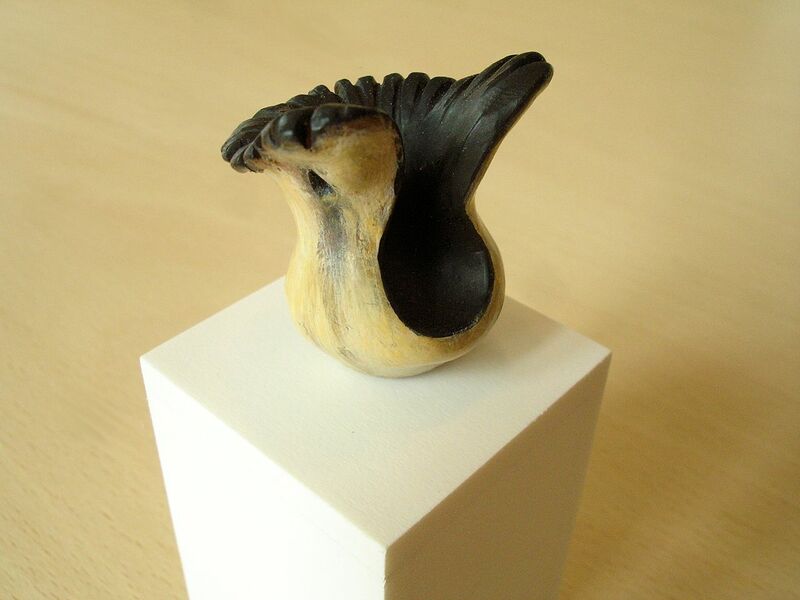 I didn’t fancy using them as they were but when sawn up into small parts they make interesting impression tools. 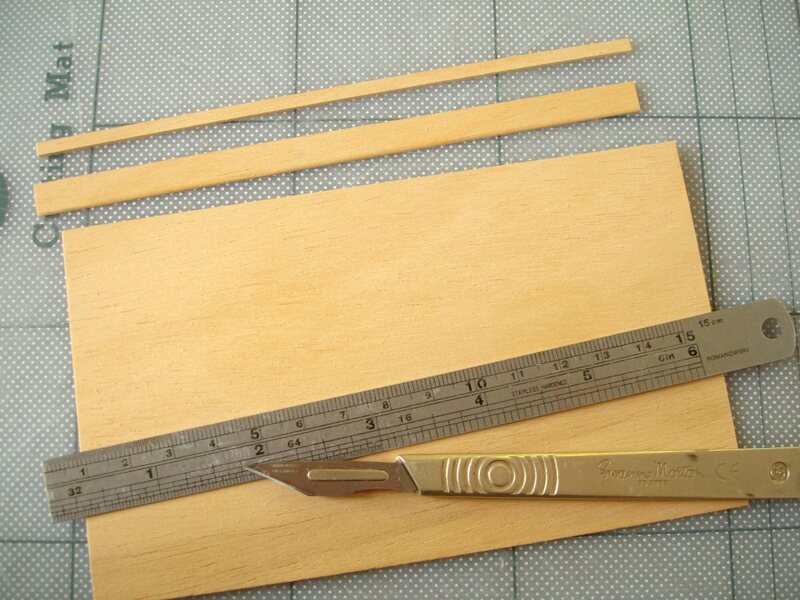 I had to hot-glue these portions onto sticks so that they could be used properly for pressing. 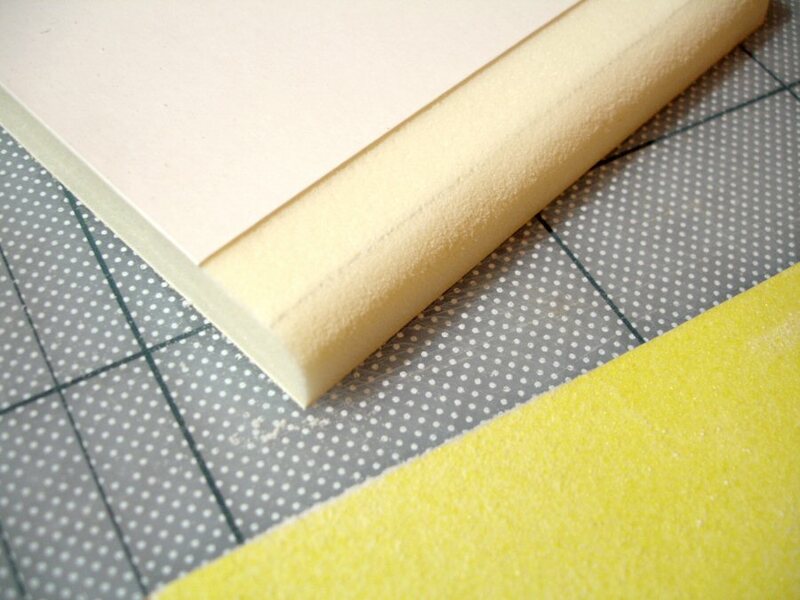 The foam in Kapa-line foamboard (and this goes for any of these ‘soft but rigid’ foams) can only be pressed in so far before it will start to tear. 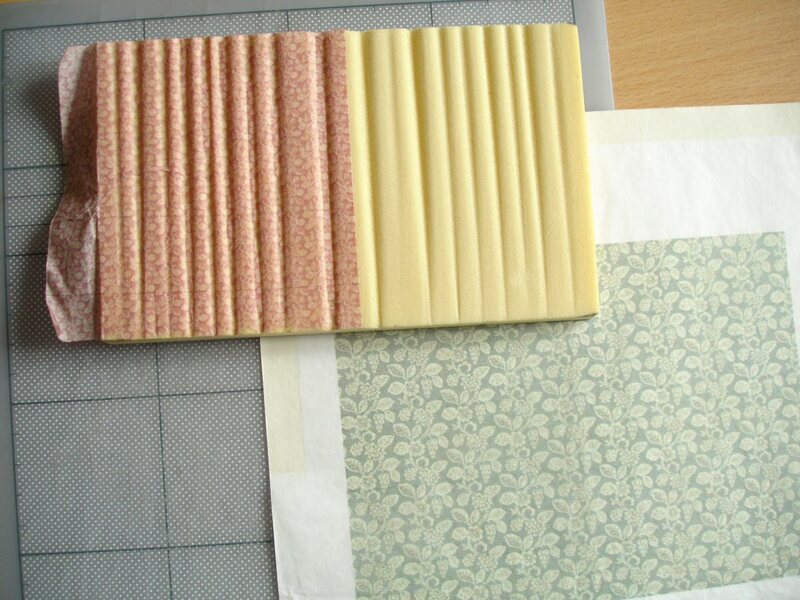 I found that I could get a much better and deeper impression using these wider tools if I pressed into separate strips, allowing the foam more opportunity to move. This wall becomes more of a three-dimensional structure than just a surface and one could argue that it belongs more to the previous post on Modelling and shaping but I wanted to deal with these methods within the context of ‘elaborating on a plane’ and surfaces which are ‘collaged’ together. Kapa-line foam is one of the easiest materials to use for creating curved-profile strips, to build up wall cornices or similarly heavy wall mouldings for example. I mean, if those shapes have to be more than a few millimetres in size, because ready-made strips of styrene plastic (half or even quarter-circle in section) can be bought for the finer ones. The best way to make these is to prepare an edge of the foamboard i.e. 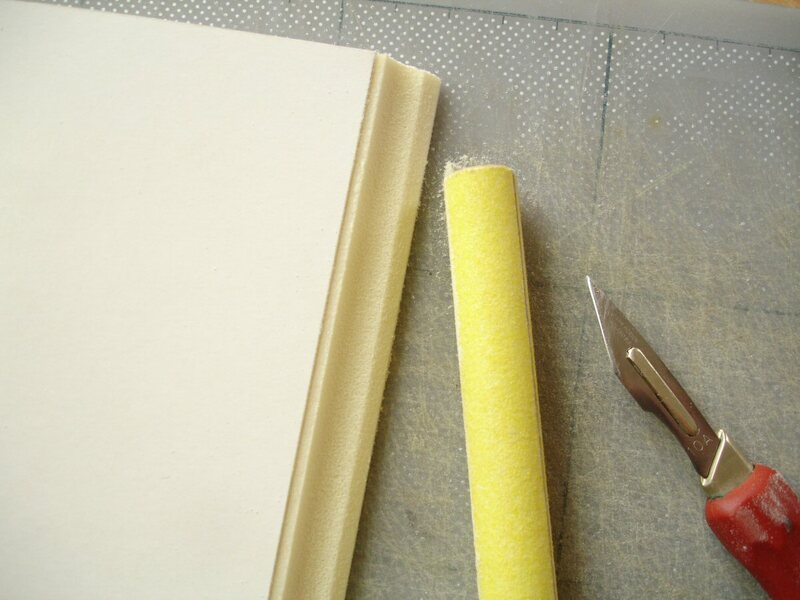 making sure that it is clean, straight and perpendicular, and carefully cut through the top paper (trying not to cut too deeply for the moment into the foam underneath) in order to peel away a strip which is the width you want your shaped strip to be. It stands to reason that it’s going to be a lot easier to shape your strip while it’s still supported, still part of the board. 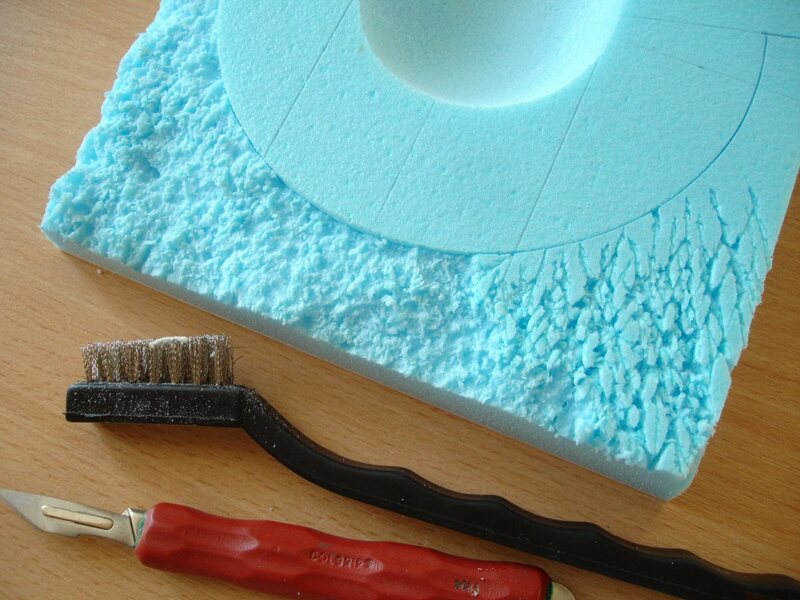 I’ve found that the best sandpaper to use for easy and smooth shaping of the Kapa-line foam is a medium grit i.e. 120 and this must be backed i.e. stuck down on a small board in order to control it. It’s easy to sand the foam and it’s easy to do it smoothly and evenly with a bit of practise .. the main danger is the tendency to apply a little more pressure at either end of the piece making these more flattened. 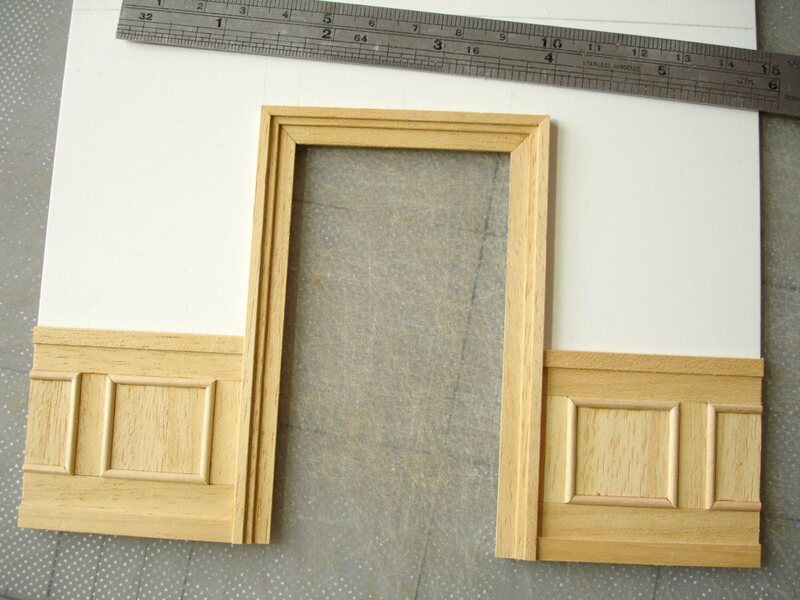 It’s just as easy to make a strip with a concave shape, such as the curve of a cornice wall moulding between wall and ceiling, by fixing sandpaper tightly against a piece of wooden dowel and running this along the foam edge. I prepared this edge as before by first removing a strip of the paper, but then I took a long slice off the corner first to give the sander something to start on. Returning to the use of tools to break up or make impressions in the surface, two of my favourites are the small wire brush and the ‘fixative pipe’ shown below. 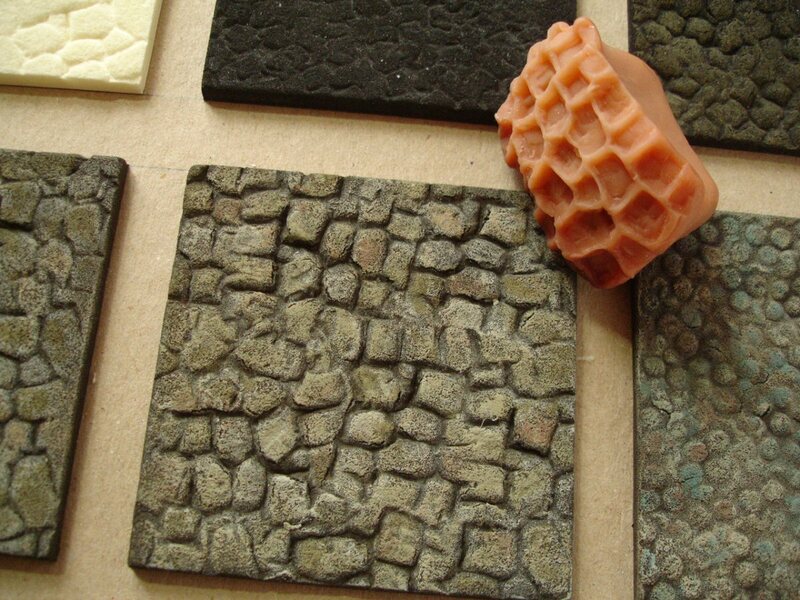 Just pressing the wire brush into the foam will create a pitted surface ideal for weathered concrete, paving stones or tarmac, and the hollow tubes of the fixative pipe make a perfect cobblestone pattern. 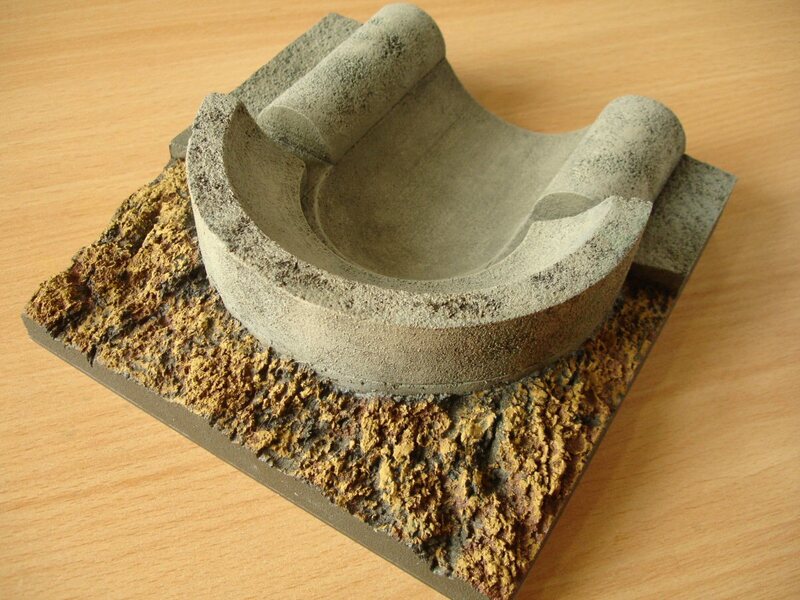 Below is a convincing simulation of weathered tarmac made by a student at Rose Bruford College. 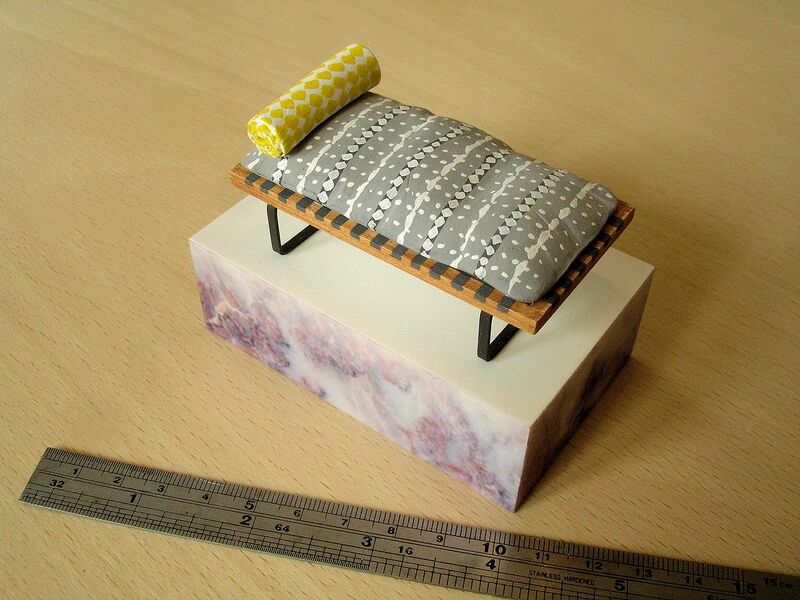 Even more specialised ‘impressing’ tools can be made quite easily out of Super Sculpey. 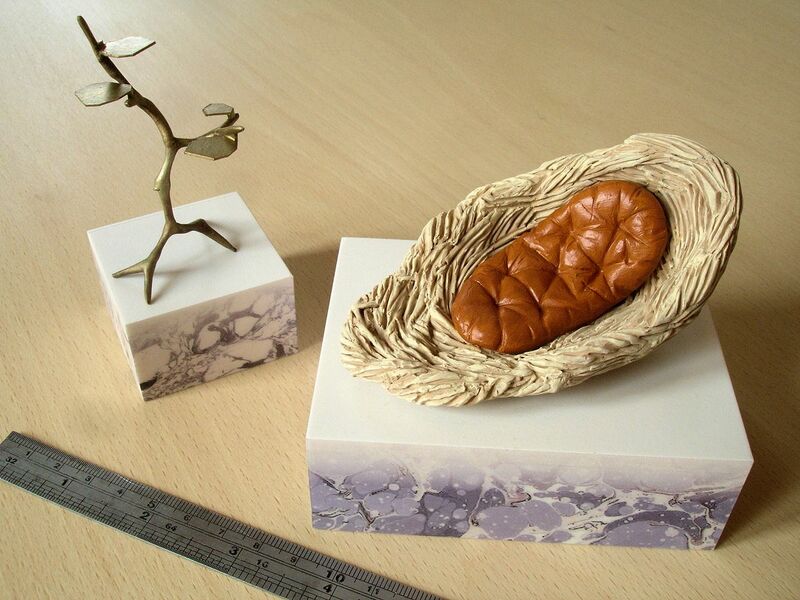 I modelled the one below to create a particular kind of cobblestone and baked it for the maximum time in the oven (rather than using a hot-air gun) to ensure that it was as hard as possible. For more on this and the best ways to do it see the post Making relief patterning tools using Sculpey from January 2013. 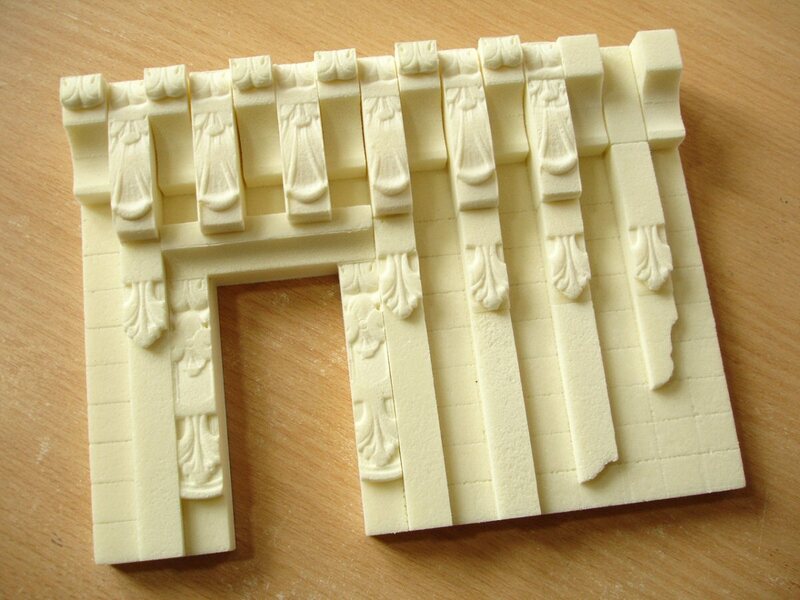 Armelle Ramage, while a 1st yr student of Design for Screen at Wimbledon College of Art, made good use of this technique to create the distinctive wall symbols for this model of an Egyptian tomb, although my quick work-in-progress photo doesn’t do it full justice. Kapa-line foam compresses very well i.e. it stays put and doesn’t fill out again when it’s painted. 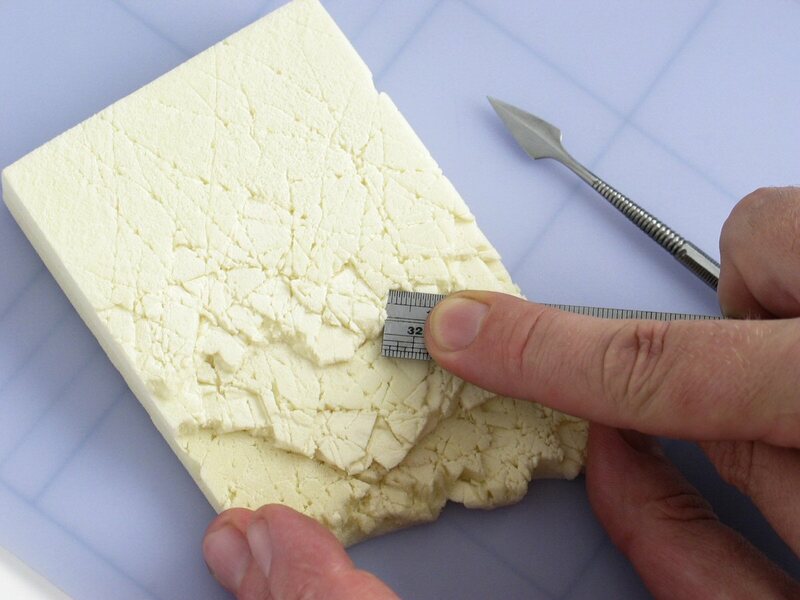 Below, I’m using this to create the suggestion of layers of rock in this piece of foam, mainly by pressing down with a small ruler. I’ve used a sharp dental tool to slash the surface beforehand. Another specialised use for Kapa-line foam is the creation of curtains because, as below, it can be sanded to represent the folds of fabric. If a pattern is needed the easiest way is to print this on tissue-paper and paste it onto the surface. Printing on tissue paper is possible if this is fed through the printer attached to a regular sheet of paper (there will be more about this later). 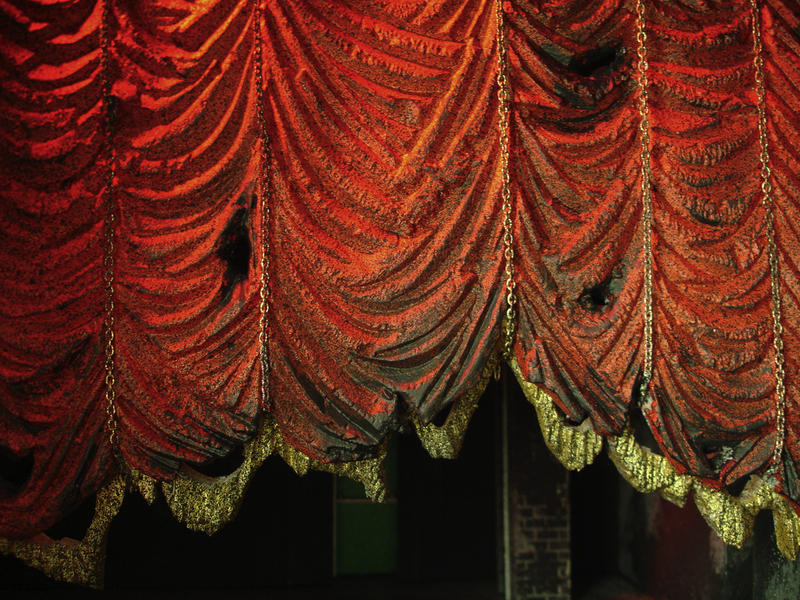 In his model for Paradise Lost the designer Ben Stones carved this theatre curtain in styrofoam rather than trying to make real fabric behave in a scale-friendly way. 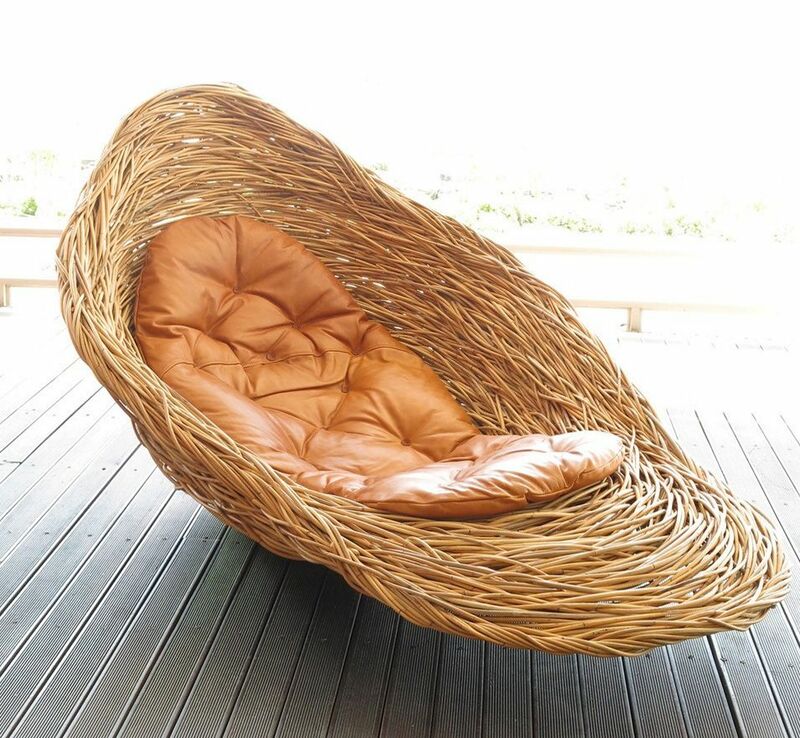 It would be difficult to arrange such purposeful folds even using a very thin fabric. The advantages of being able to create the surfaces you want in black foamboard (as opposed to the special Kapa-line) are that it’s cheaper and obtainable almost everywhere. Another advantage is that there may be less painting involved (at least less base-coating perhaps) because the foam is dark grey to begin with. Not all black foamboard brands enable easy peeling of the paper though, so one needs to test if one can before buying. The polystyrene foam is not as fine and impressionable as the polyurethane foam in Kapa-line foamboard but it’s good for things like the brickwork below, using the same tools and paints used on the Kapa-line foam. However, being polystyrene the foam in black foamboard will be dissolved by spraypaints and solvent glues (such as UHU and superglue) so I wouldn’t advise spraying a brickwork surface you’ve spent some time on. 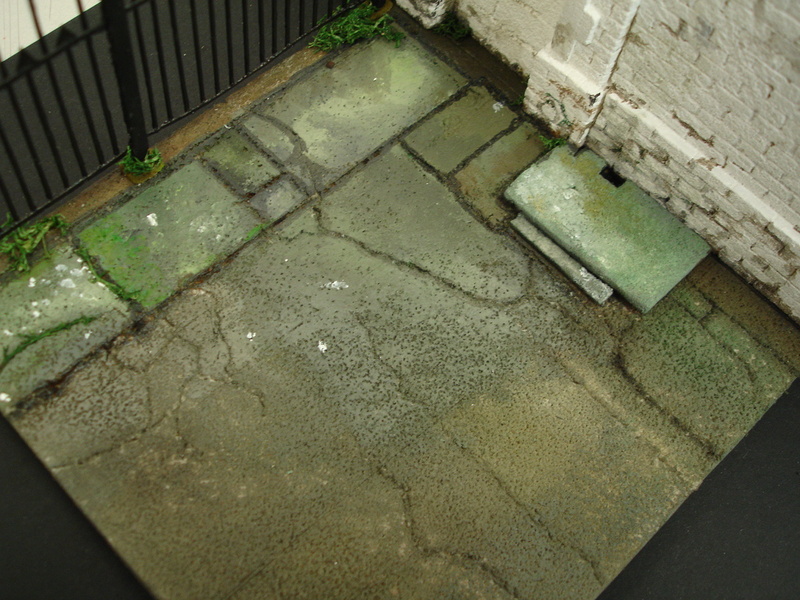 Spraypaint doesn’t dissolve it completely though and for some things you may find it an interesting surface in itself! 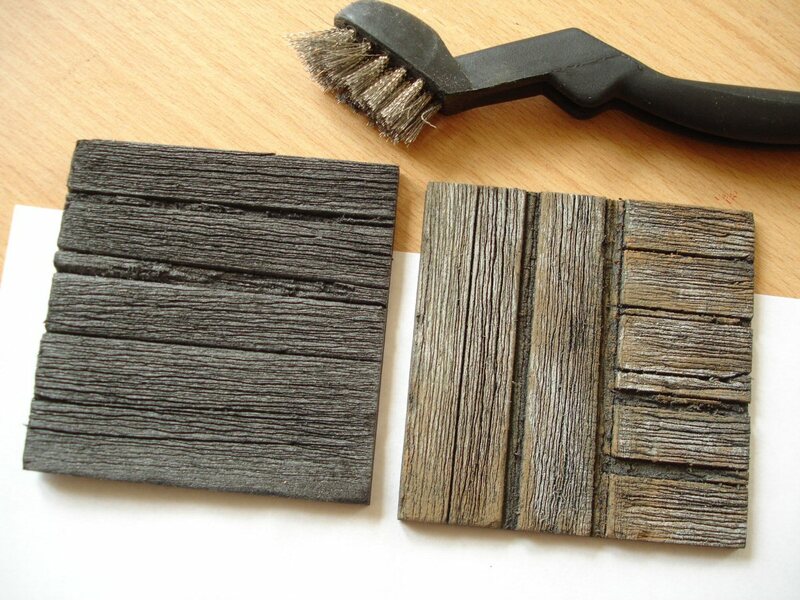 In one respect the black foam gives a better result than Kapa-line foam, when a wire brush is pressed/dragged along it to suggest heavily weathered wood! I’ve written a short article Using standard black foamboard and this can be found in the Materials /- surfacing section. As indicated in the previous post, styrofoam can also be broken down to create a texture, though it is not quite as yielding when making impressions. 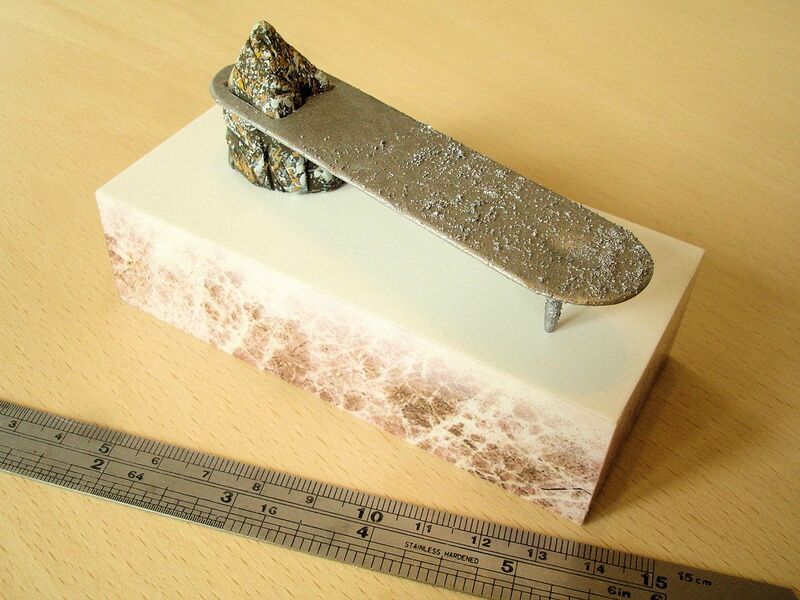 The rocky surface below was made by first slashing with the back of a scalpel blade, beating with a wire brush and then scratching away with the scalpel. I’ve used thin, matt acrylic to paint this. Although foams like the ones featured are the most yielding materials in this context, there are some others that can be ‘broken down’ in a similar way. ‘Palight’ foamed Pvc is soft enough to make quite an impression when scraping sandpaper along the surface. 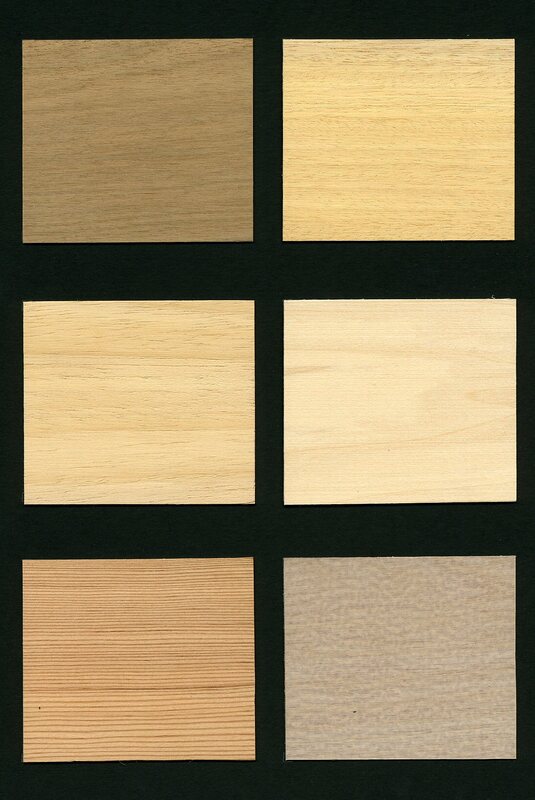 For the samples below I used a coarse (60 grit) sandpaper mounted on a sanding block and dragged firmly but repeatedly in fairly straight lines to achieve the effect of wood grain. In some places I used the edge of the block to press in a deeper groove. It has to be practised to get an idea of the pressure needed, what movement works best and the range of what’s possible. A bonus is that because the plastic is sanded it will accept paint, even in thin washes, a lot better. After a number of experiments I found that the most convincing results came from undercoating first in a light wood colour (thinned System3 yellow ochre acrylic worked well) and once this dried washing over again with a much thinner, darker colour. This was because when I tried a darker wash first, the white of the Pvc was too visible in the highlights. To make the piece of panelled wall here I prepared an A4 size sheet of Palight first with the wood grain effect so that this could then be cut up into pieces and applied. 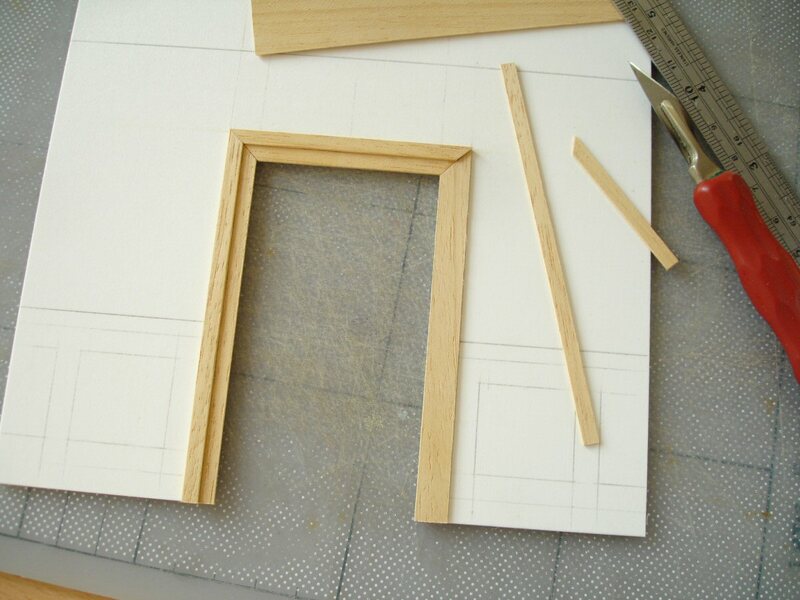 I wanted rounded borders inside the panels and around the doorframe, for which I used bought strips of styrene plastic. 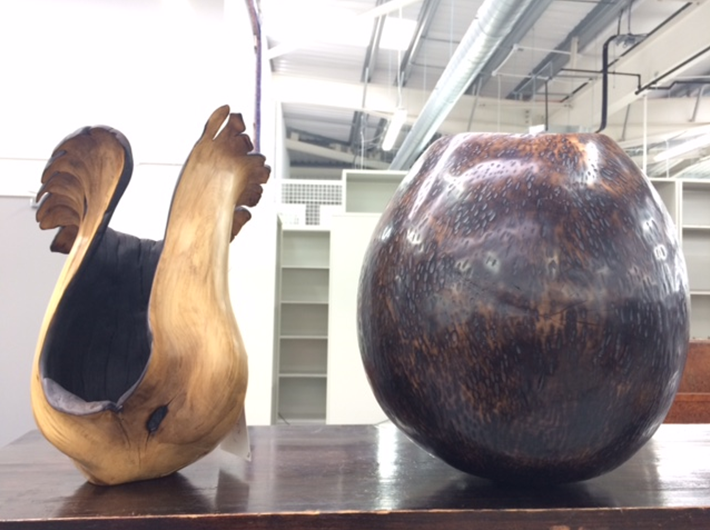 These also had to be lightly sanded otherwise the paint treatment would not take in the same way. 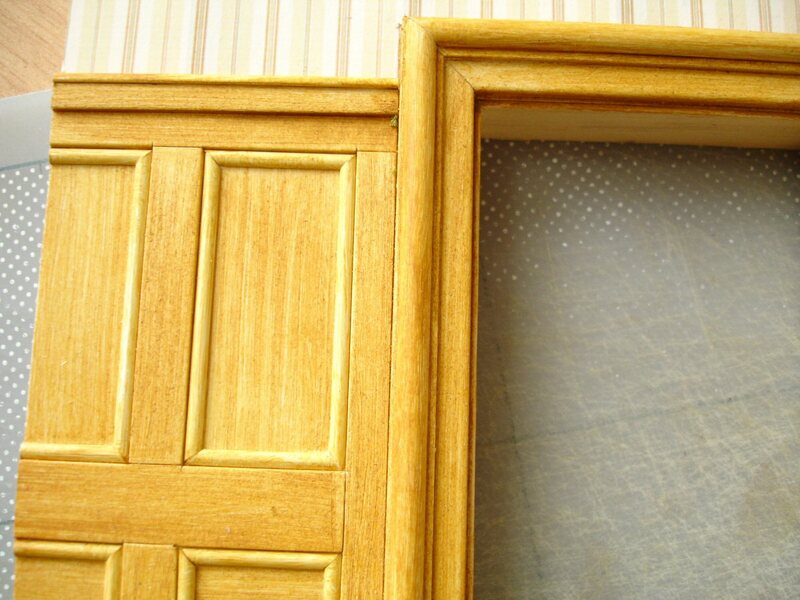 One of the most important requirements of wood panelling, in terms of the right ‘look’ and whatever material is used to create it, is that it looks ‘composited’ of separate, joined pieces even if it is not. For this example I did actually do that, piecing together lots of separate bits but for example the main framework around the inset panels could be made as just two pieces here .. as long as the surface is grained in the right directions! 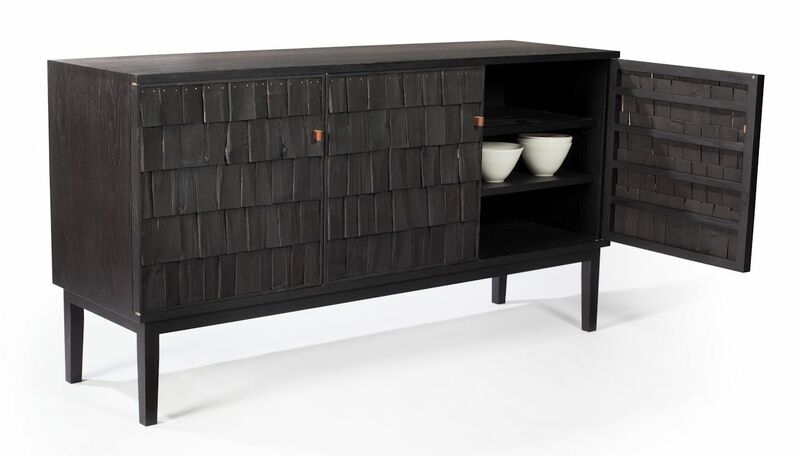 In real panelling, whether on walls or single doors, the grain of the wood will almost always go in the direction of the longest side of the rectangle. For the painting in this case I just used a light wash of System3 yellow ochre without a second colour. 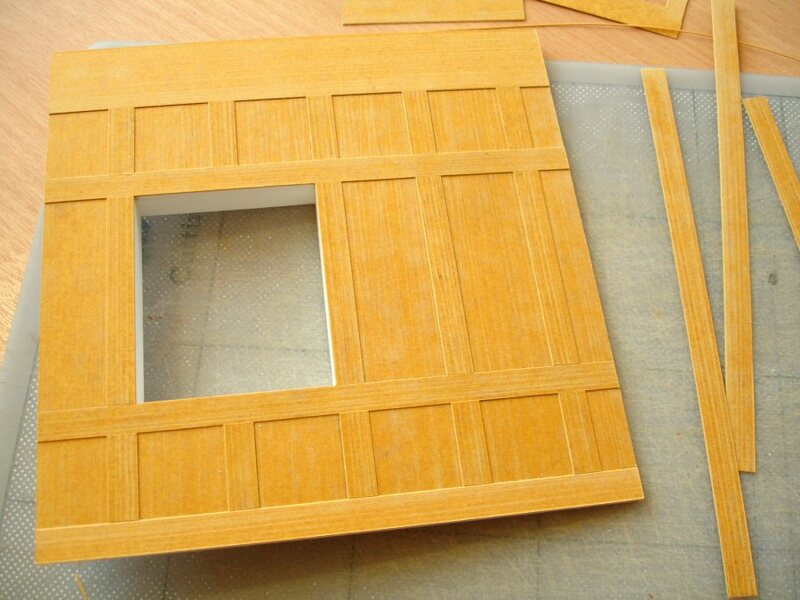 Stencil card (also known in the UK as ‘oiled manilla’) can also take on the appearance of wood if it’s scraped with sandpaper, although for a finer scale it’s better to use a less coarse sandpaper such as 120 grit. 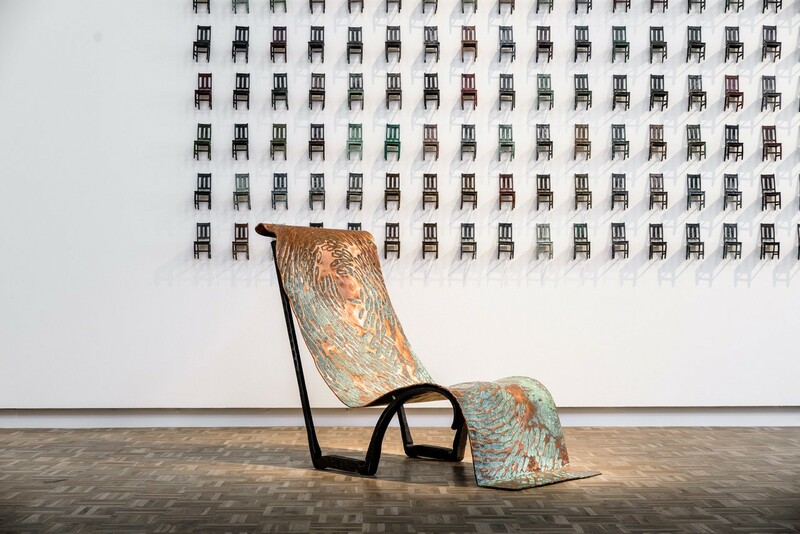 Once it is ‘grained’ in this way it will take stain, polish or washes of acrylic well, even acrylic rubbed over using a cloth, and the colour will emphasize the surface structure. If acrylic is used it should be one with some transparency. 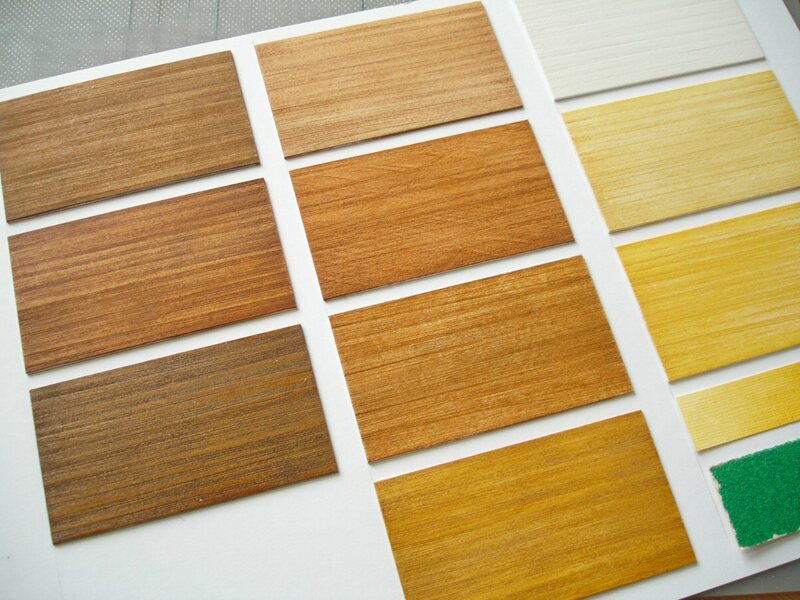 For the various samples below I tried woodstains, liquid shoe polishes and System3 acrylics. 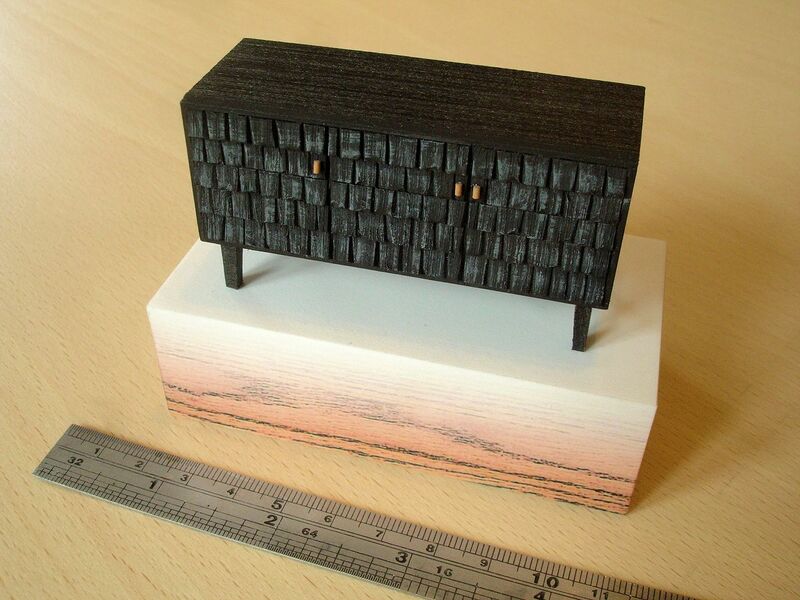 An advantage of using stencil card to simulate wood panelling is that, because it is relatively thin, layers can be built up without appearing too ‘heavy’. 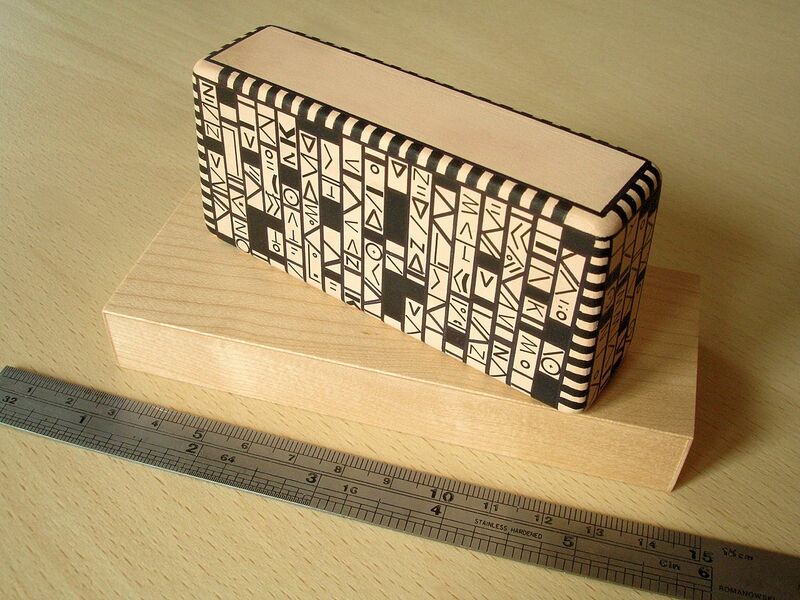 The standard thickness is 375 microns (about a 1/3 of a millimetre). 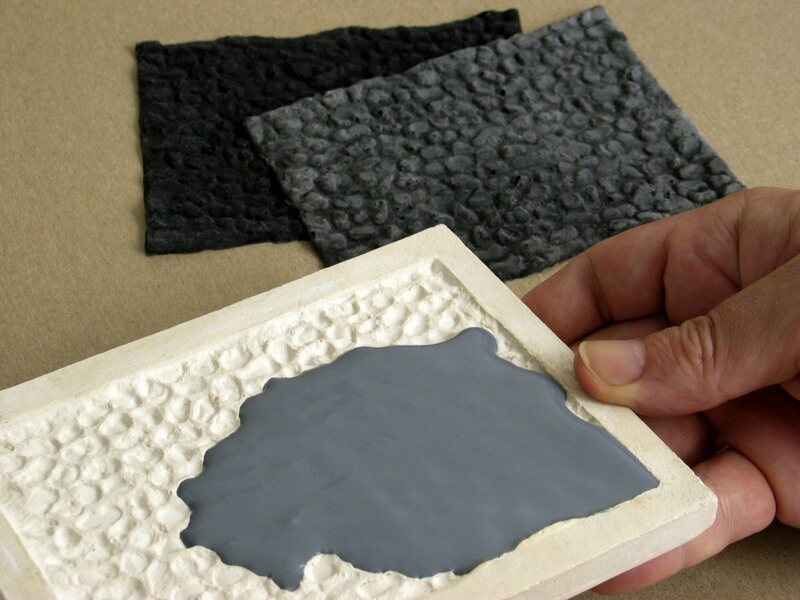 Most foam surfaces can be just painted with acrylic and they will survive if handled carefully. They can also, of course, be undercoated with normal acrylic gesso first if you want to start from a white base. But if you’re worried about durability or want to make the surface more resilient for handling, there are a number of further options. 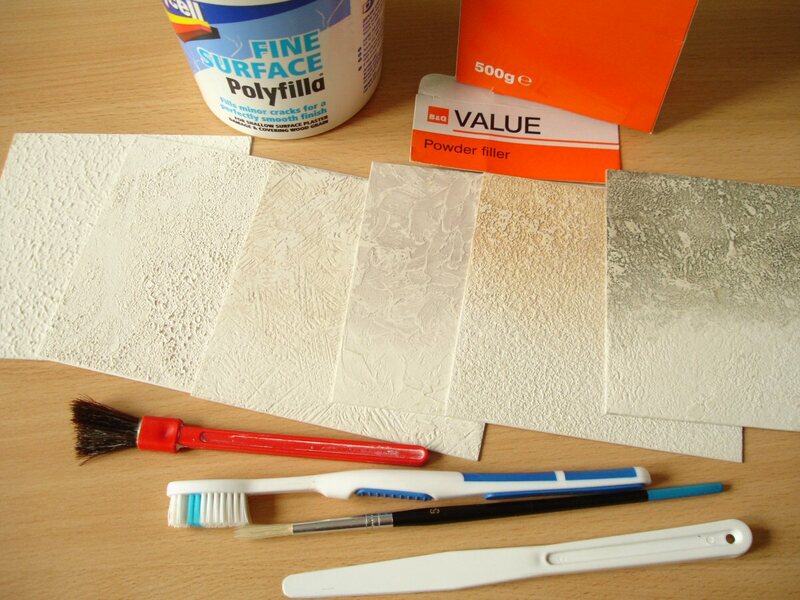 The simplest is to coat the foam before painting with one or more layers of Pva wood glue. If you’re using a type which is easily brushable, such as one of the cheaper ‘school glue’ types this can be used as it is. The more professional wood glues such as Evo Stik Wood may need just a touch of water to help brushing them on more easily. Since Pva contracts a lot when drying there’s little danger of losing the surface detail .. but you will notice a very slight difference. An even tougher surface can be achieved using a special medium called Paverpol which is made in the US but available here. It is marketed as a medium for painting on or soaking fabric to make it tough, rigid and permanent, for example to drape it on a figure sculpture. It won’t make the surface of Kapa-line foam or styrofoam as strong as that but it makes them much stronger than painting alone. 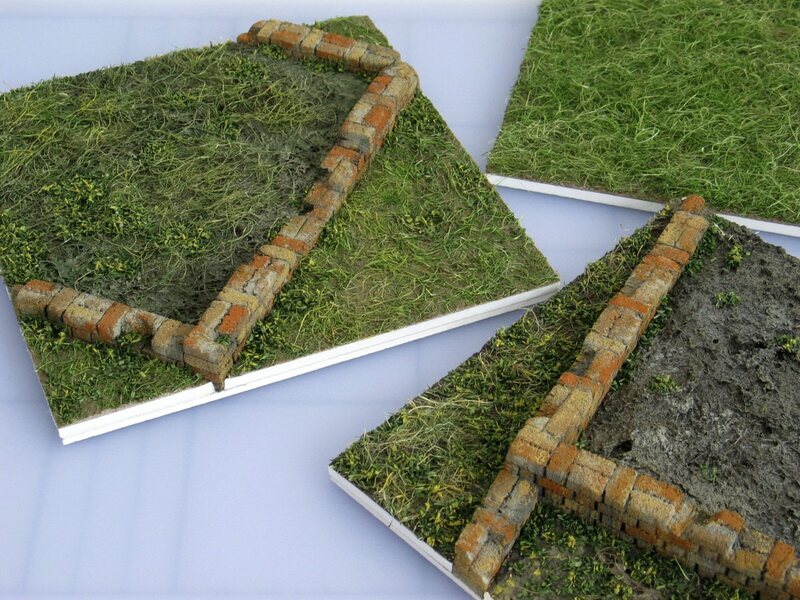 Paverpol comes in a few different base colours but includes a transparent one which accepts acrylic or powder pigment well, so one can mix up one’s own base colour. One important thing to bear in mind, as I’ve mentioned before, is that the styrene foams i.e. 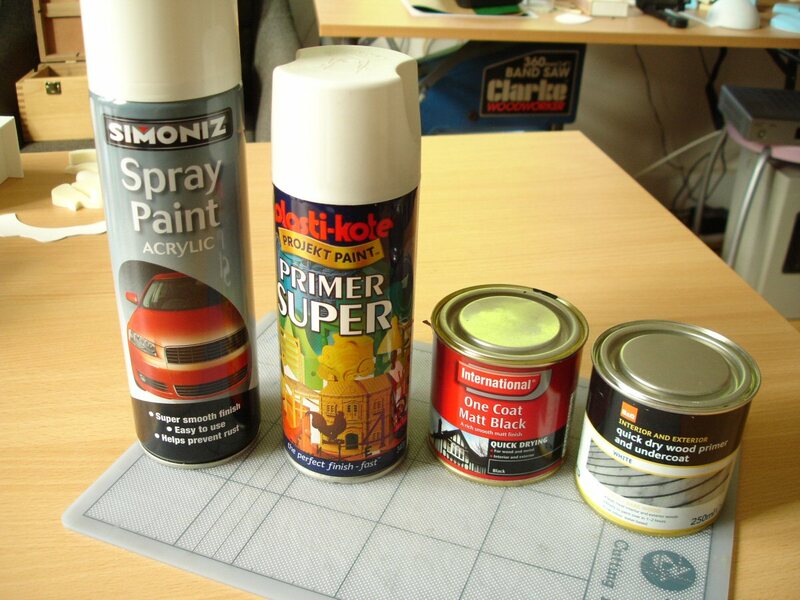 expanded polystyrene, styrofoam or Depron are attacked by solvents such as acetone, present in many spraypaints, or other spirit-based paints and glues. 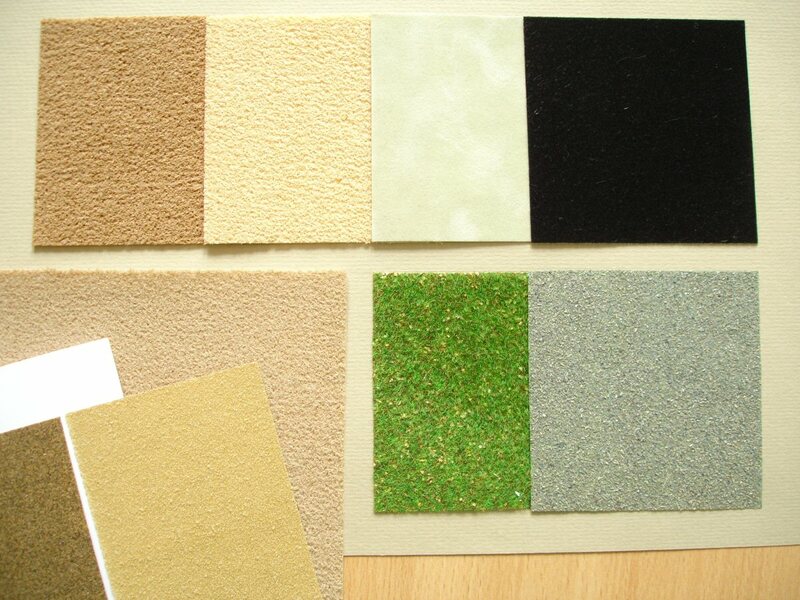 On the other hand the polyurethane foam in Kapa-line foamboard is resistant. 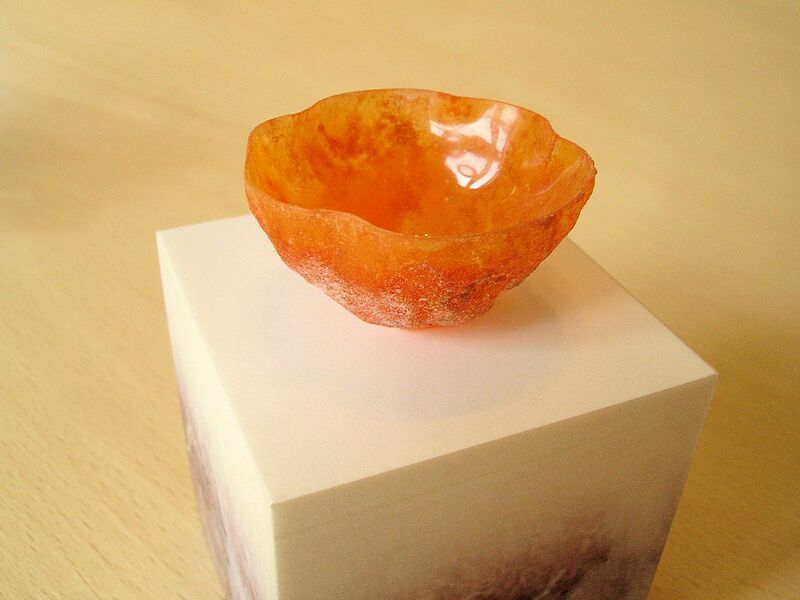 It can even be coated with polyester resin, which gives it an even more durable surface. 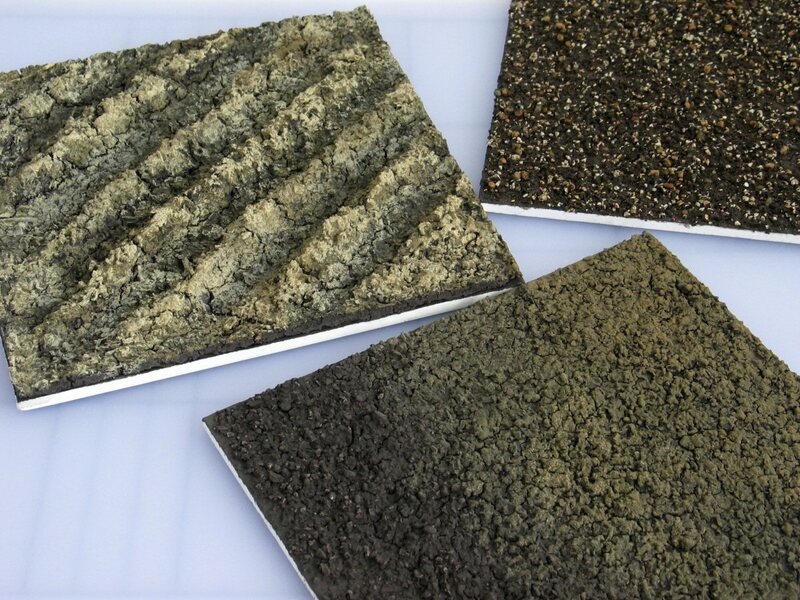 I’ve tried various options over the years but none is more reliable, versatile and durable than this specific brand .. the ‘Fine Surface’ Polyfilla from Polycell. 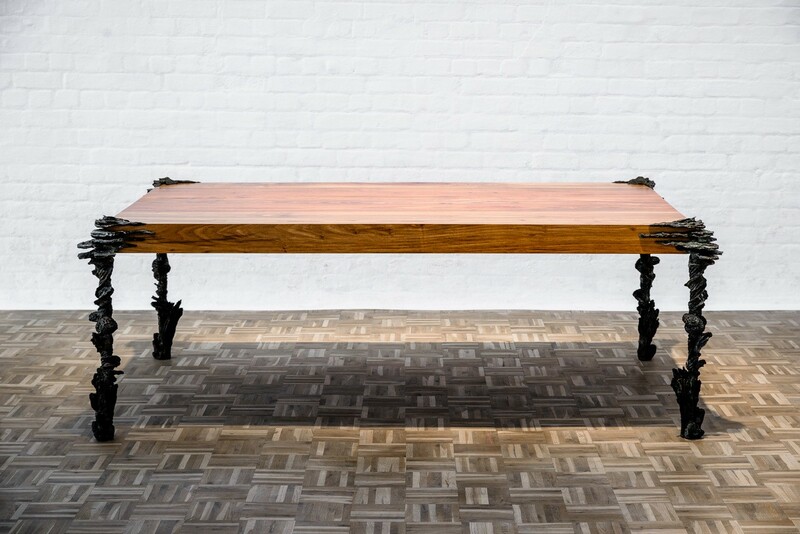 This is a standard type, found in most warehouses and DIY shops and it is not particularly more expensive but it is far superior to any others for this type of work because of certain special properties. It comes ready-mixed in tubs and has an almost solid, gel-like consistency but this will turn to a smooth ‘cream’ once you stir it thoroughly. I’d recommend you don’t try to do this with the whole tub but transfer a smaller portion to a mixing pot first. It is very sticky ..much stickier than others I’ve tried .. meaning that this polyfilla will stay on plastic and even metal if the surfaces are properly clean. 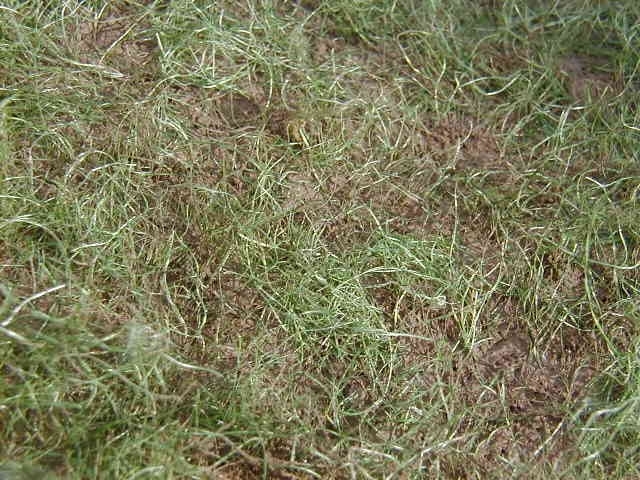 It will keep much of its adhesive property even if thinned down with water. 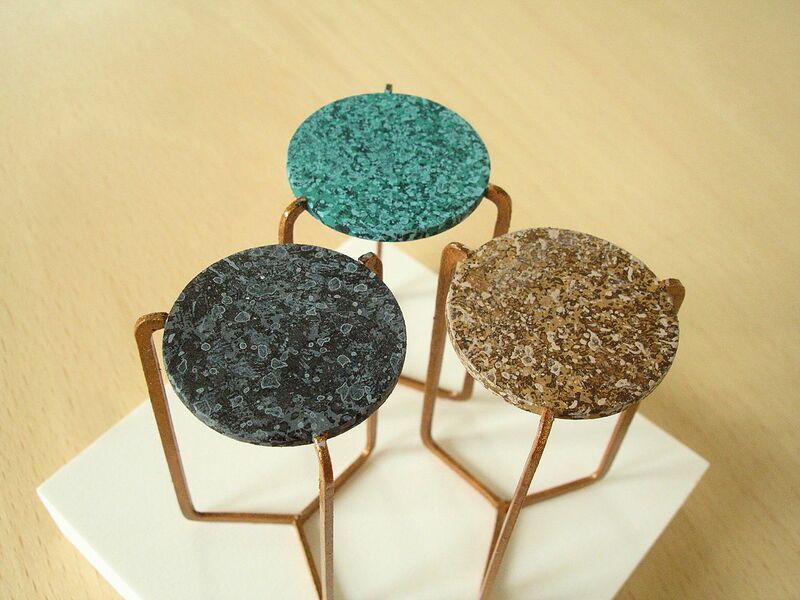 It is very fine-grained, almost like thick acrylic paint, meaning that it can be spread very smoothly without breaking up and can be sanded if need be to a glass-like smoothness. It hardly shrinks at all unless applied very thickly and this means it doesn’t usually crack. Added to this, it dries fairly quickly and remains slightly flexible. 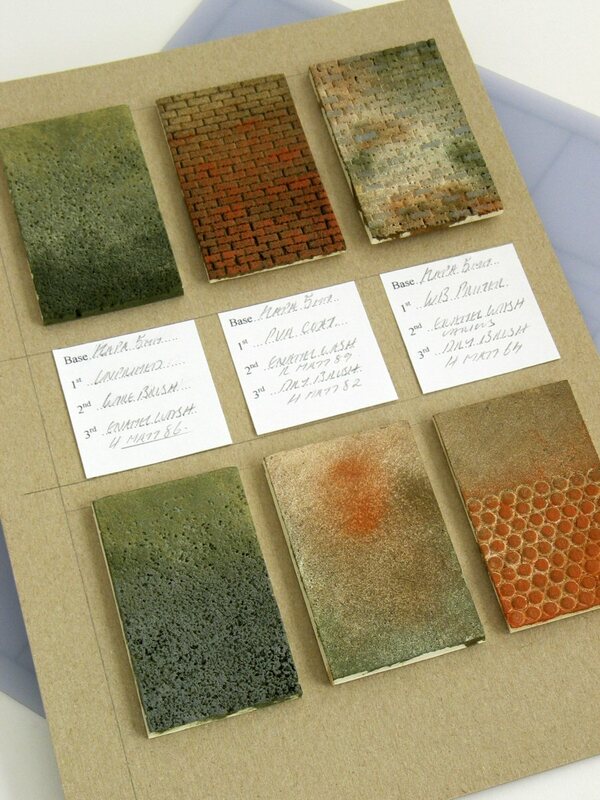 Here are some samples showing the effects of applying the polyfilla in different ways i.e. stippling with a brush, spreading with a palette-knife or wooden fork, pressing with a rag etc. 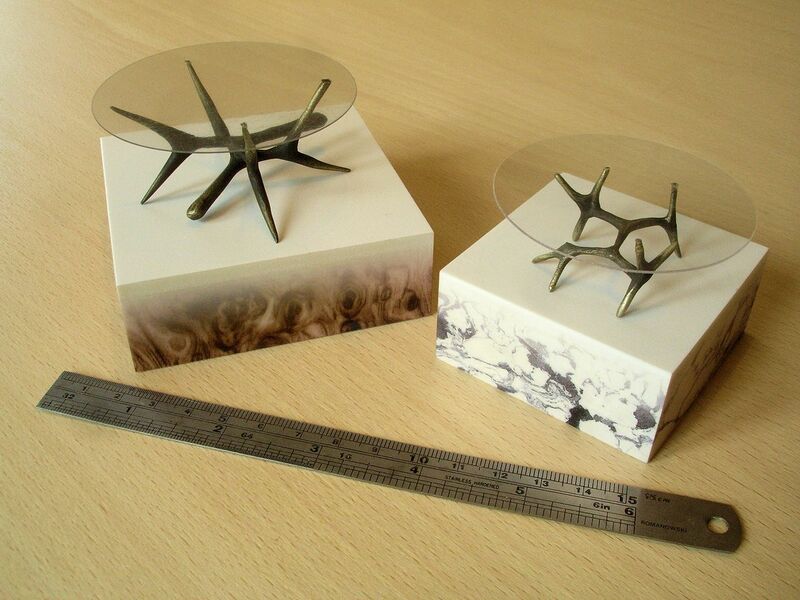 I’ve given these a wash of thin acrylic and then sanded down a little to make the structure more visible. Below, polyfilla can also be used in combination with Kapa-line foam, to sharpen the surface detail or give even more depth. 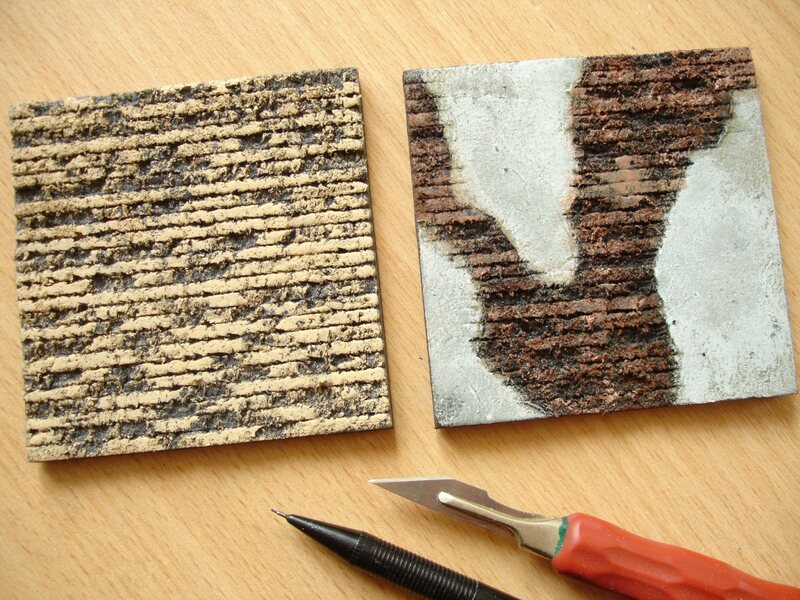 The distinctive, stone-like texture below was made by spreading on a thin layer then pressing in a sponge while still wet to imprint the pattern. The sponge needs to be damp to prevent the polyfilla from sticking too much. One of my favourites is vinyl-textured wallpaper, which I’m concentrating on here, but there are so many others including marbled writing-paper, sandpaper sheets, or special decorative papers. First, a few general words about spraymounting since this is the most convenient method of gluing down any piece of paper over a certain size. The most reliable brand to use is 3M (this seems to be the most commonly available anyway) but there are different types from 3M. I use the word ‘spraymount’ like most people do as a blanket term for all of them but strictly speaking ‘Spraymount’ is the name 3M gives to its lower-tack, repositionable spray-glue and this is not the best for sticking securely down straight away. Better for this purpose are either ‘Photomount’ which is stronger and permanent; ‘Displaymount’, even stronger for heavier materials, or lastly ‘Craftmount’ which is the strongest of all. With all of these a fairly light spray will suffice. The surface needs to feel tacky to the touch, but if so much is sprayed on that the paper slides around a little when sticking it down you can be sure that it’s too much. It will stick firmly eventually, but it’s more a question of economy since these sprays are expensive! 3M’s lower-tack ‘Spraymount’ can be used though if you want the option of repositioning. If sprayed on one surface it will remain temporary for about 12 hours whereas if both surfaces are sprayed this will be reduced to 2 hours. 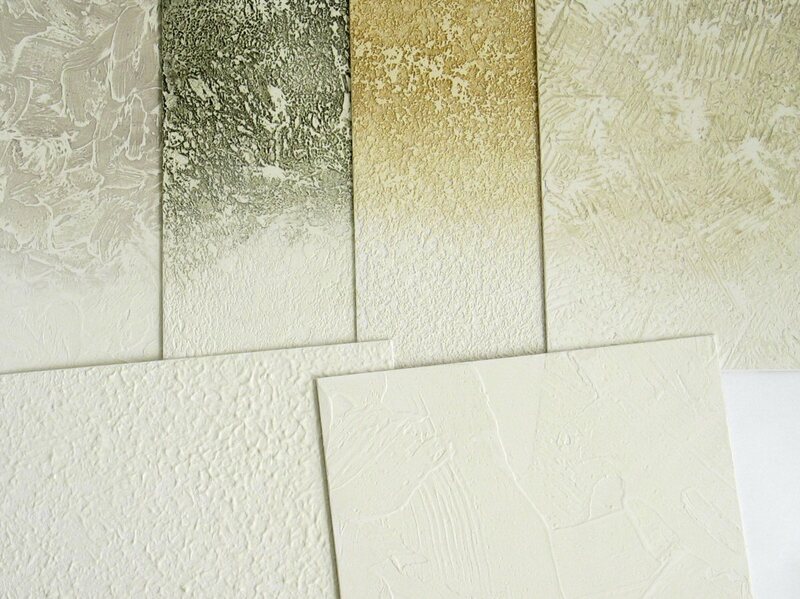 One of the perks of using vinyl-textured wallpaper is that small amounts can be had for free! For example B&Q usually includes an opened roll of each type on their shelves for people to take samples home. ‘Vinyl’ doesn’t sound like the kind of material which will welcome paint, but it paints up very well with acrylic. More interestingly, because the vinyl relief pattern doesn’t cover the whole surface but leaves much of the soft backing paper exposed, washing with very thin acrylic will create a varied pattern as shown below. 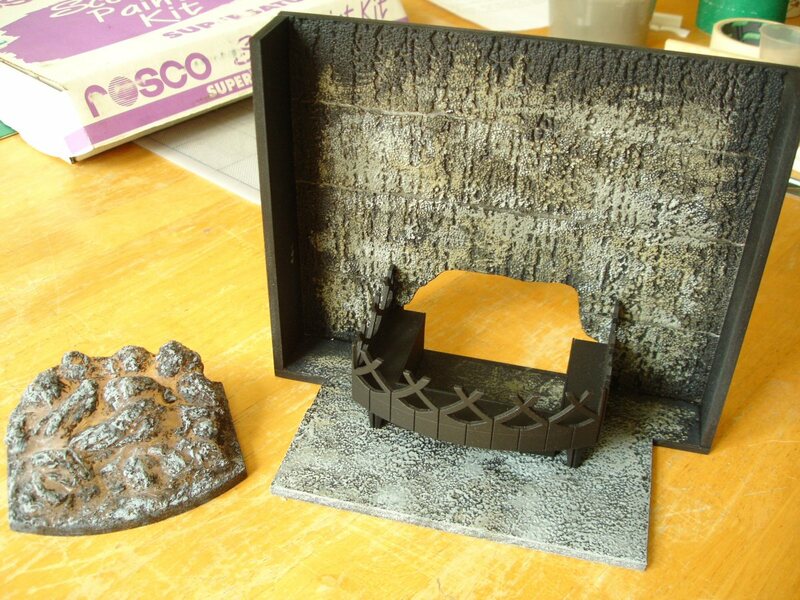 Here below, I have used strips of vinyl wallpaper to create a rough stone effect for the 1:6 scale fireplace model mentioned in the previous post. 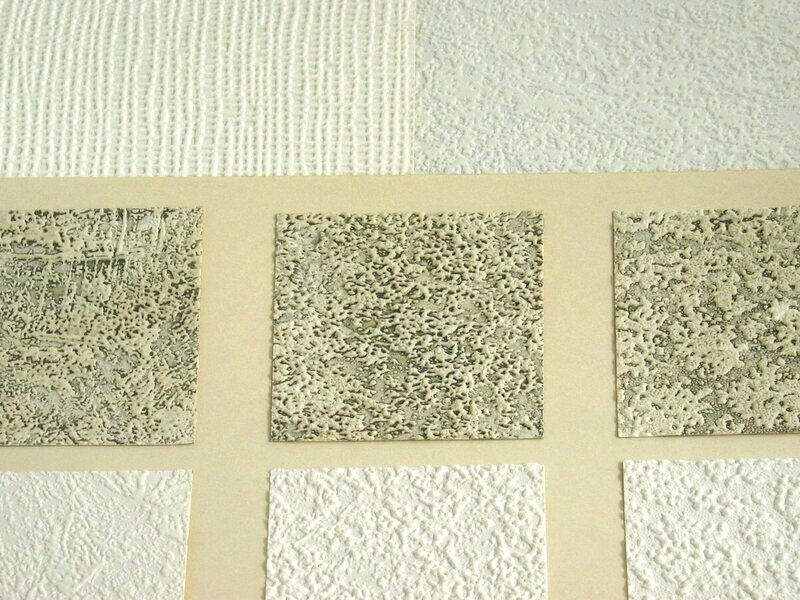 There are many interesting relief patterns or textures to choose from in paintable white .. but there are usually just as many coloured ones and these often have a finer-scale surface. 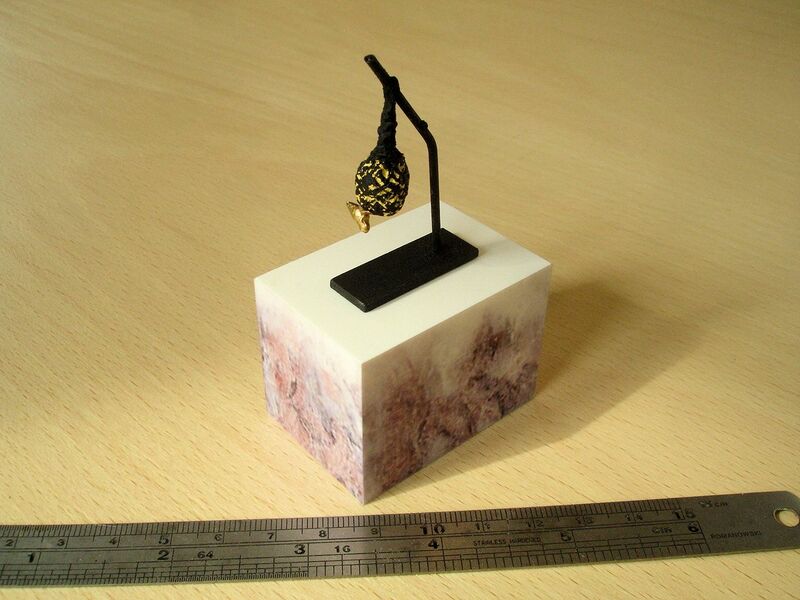 Other options for ‘ready-made’ papers include using the marbled writing paper shown below to simulate marble. Covering with transparent film is often the easiest way to achieve a polished look. 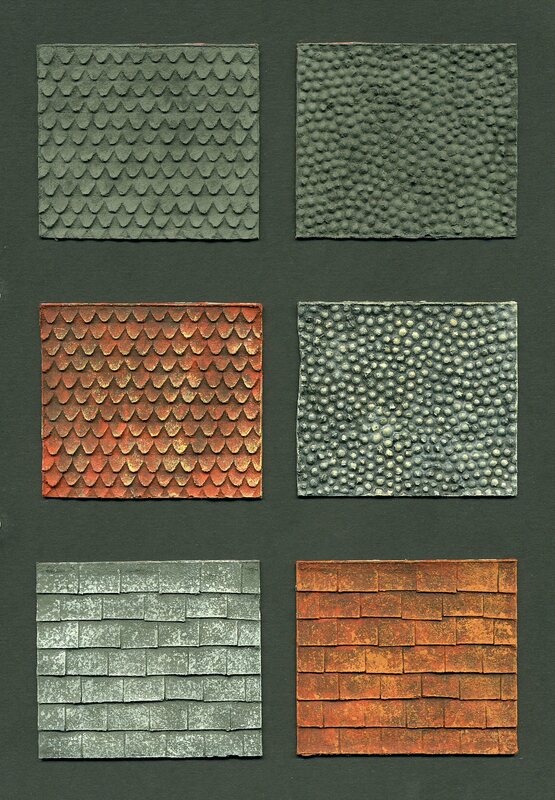 The other papers below are a selection from the firm E. Becker who make decorative papers used in packaging or bookbinding. Paperchase and Shepherds in London (see Suppliers) stock a number of these. 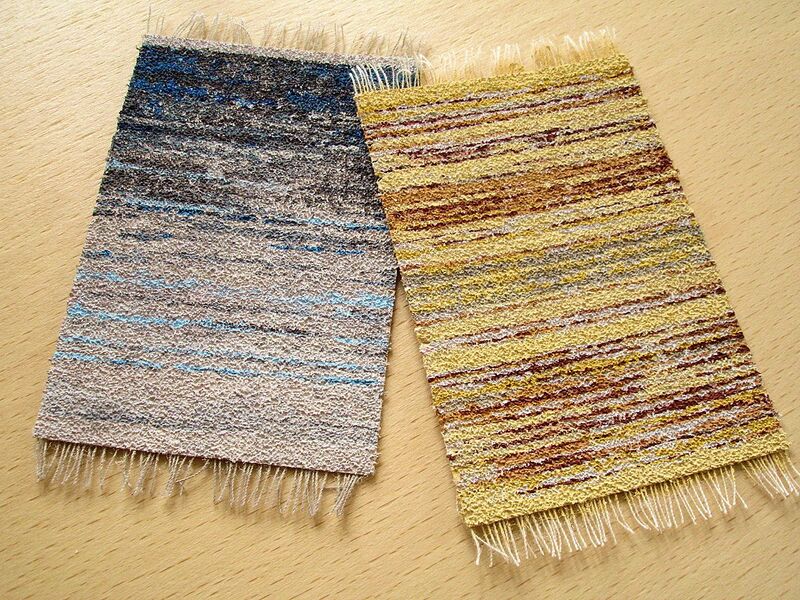 Hobby or craft shops often sell sheets of ‘velour’ paper, especially in their card-making section, and these can serve well as carpet. Almost equally convincing as carpet is painted sandpaper. Circumstances have changed a great deal since I was a student of theatre design in the mid 1980s! 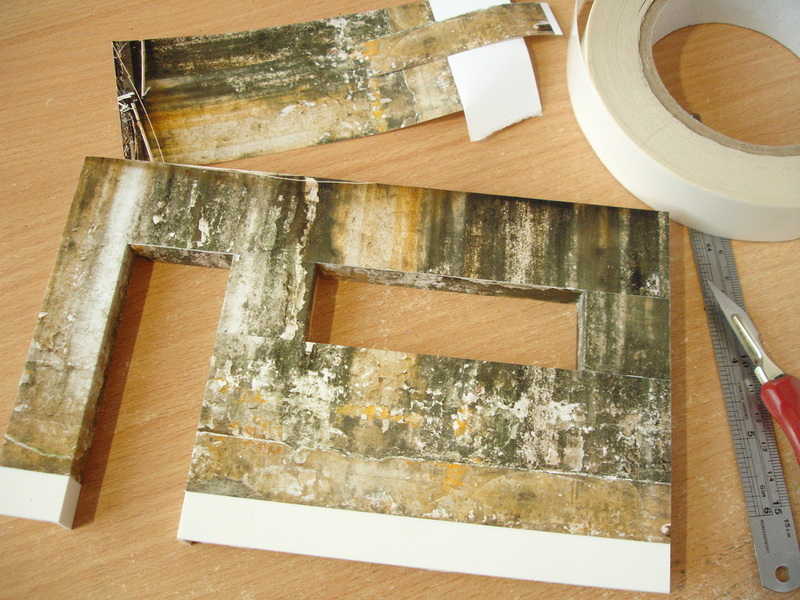 If we wanted to create something like scaled wallpaper in a theatre design model we would normally seek out a pattern in a book and, if we managed to find a suitable one which had been reproduced flat-on, it needed to be reduced on the photocopier and carefully pieced together on the model. Because colour copies had a shiny surface and were often unreliable in terms of colour anyway, it was often necessary to photocopy in black&white and hand-colour afterwards! Now the method of printing out as much as one wants, in exactly the right scale and in perfect colour on suitably matt paper, couldn’t be much simpler .. and all at home! 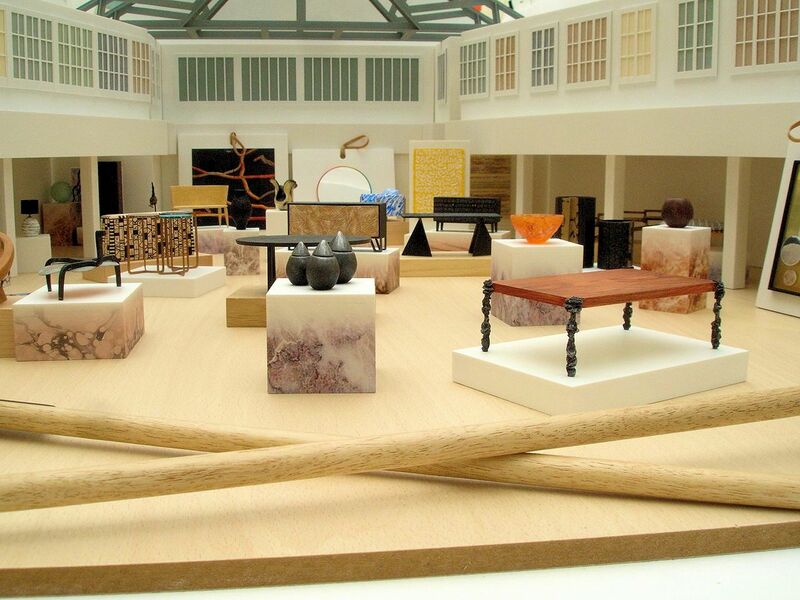 I have described the whole process of creating scaled wallpaper using digital images in my post Using digital images in ‘realspace’ models – Part 1 from January 2013. Part 2 was going to look at whether photos of surfaces could be used in the model in place of texture medium and paint, but as this hasn’t appeared yet I’ll preview it here. I was always schooled in the idea that texture intended for the set design needs to be at least approximated with a real texture in the model for at least two reasons .. firstly so that light will behave in a similar way in the model and secondly to make it clear to the scenic artists that a real texture is intended. Both are good reasons but I also feel that as even the way that full-size theatre sets are created is changing through new technologies it should open up new methods of representation in the model .. at least that’s part of my argument for it. For the first example I’m showing here I used a digital representation of a carpet pattern, scaled to size and printed on matt-coated inkjet paper. 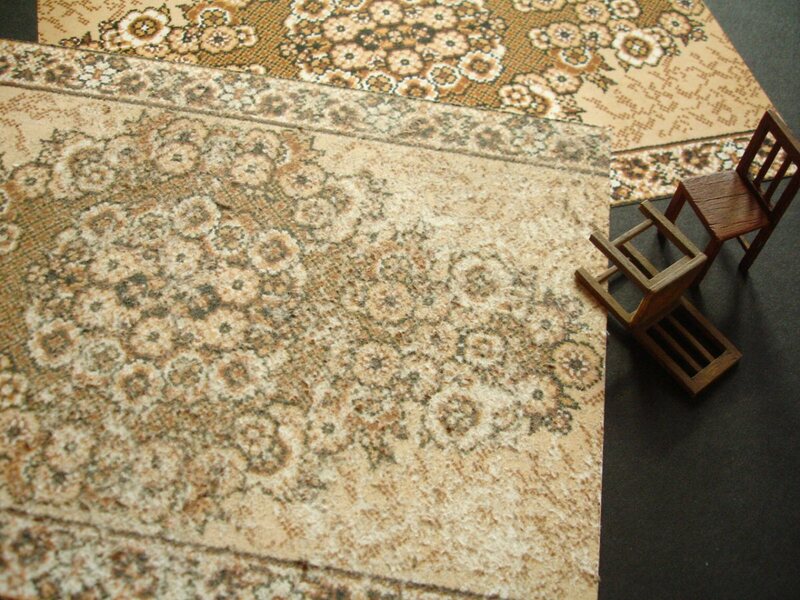 I chose a patterned carpet as a subject because it’s one of the most difficult things to reproduce in a scale model. I spraymounted the print onto thin plastic to give it some strength and keep it flat .. then attacked it with a wire brush. Careful ‘scumbling’ (pressing down and rocking around) with the brush gradually makes the paper surface fuzzy .. not as much as velour but it definitely gives it a texture. 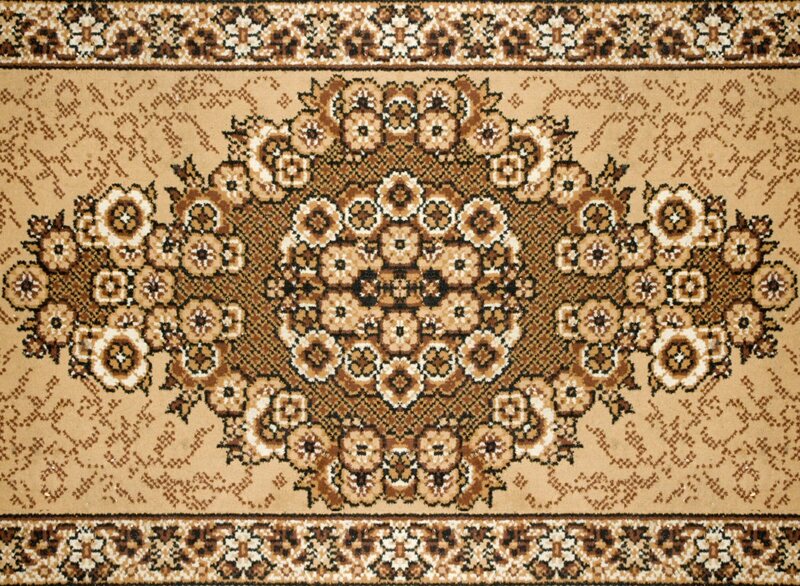 Some of the definition of the pattern is lost, but not much if careful .. it’s probably more suited for conveying the look of an old, worn carpet though. 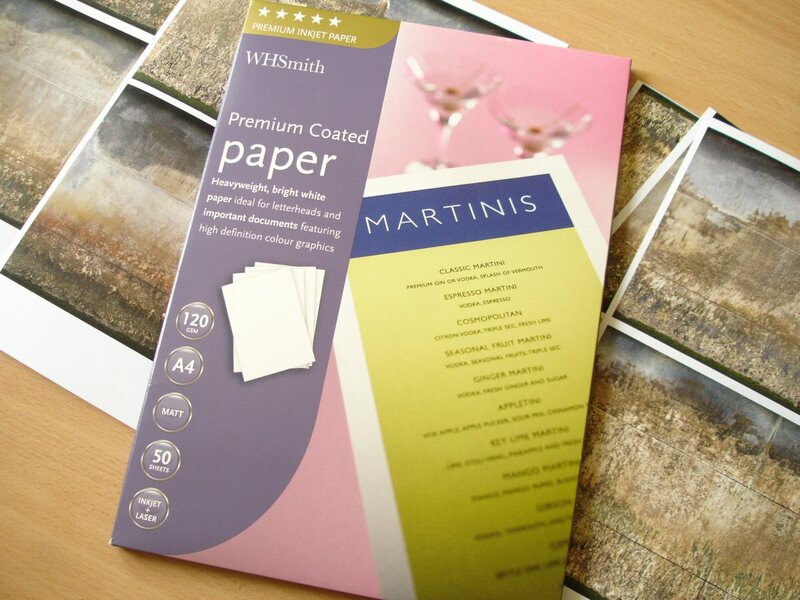 I’ve only tested the technique using one type of matt paper, shown below, and there may be even better ones but I’d recommend this from WHSmith because it’s also fairly cheap at around £7 for 50 sheets. For the second example here I’ve used the high-resolution photo of ‘leaking plaster’ shown earlier .. which, whatever the specific source, is such a rich surface! 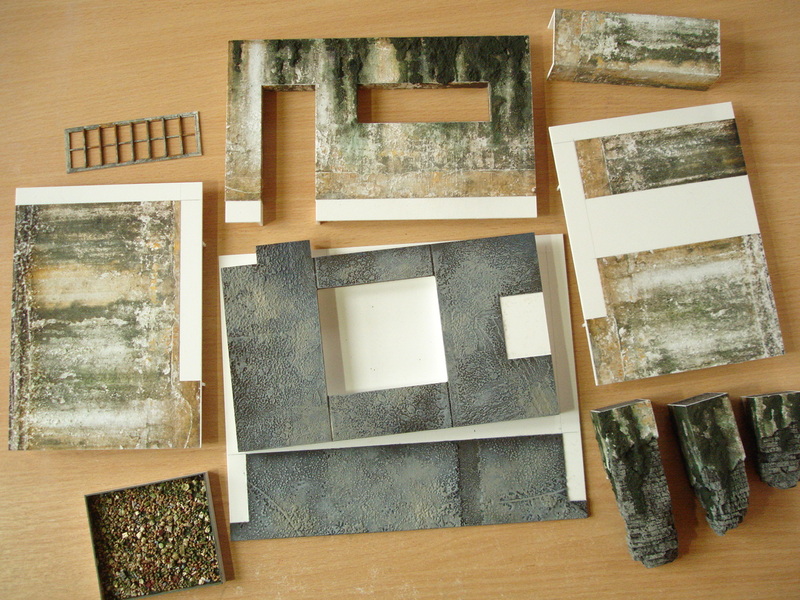 I’ve used it as a general source of pattern and colour and collaged it on the wall construction shown below (the pieces of this model are also shown at the beginning of this article). 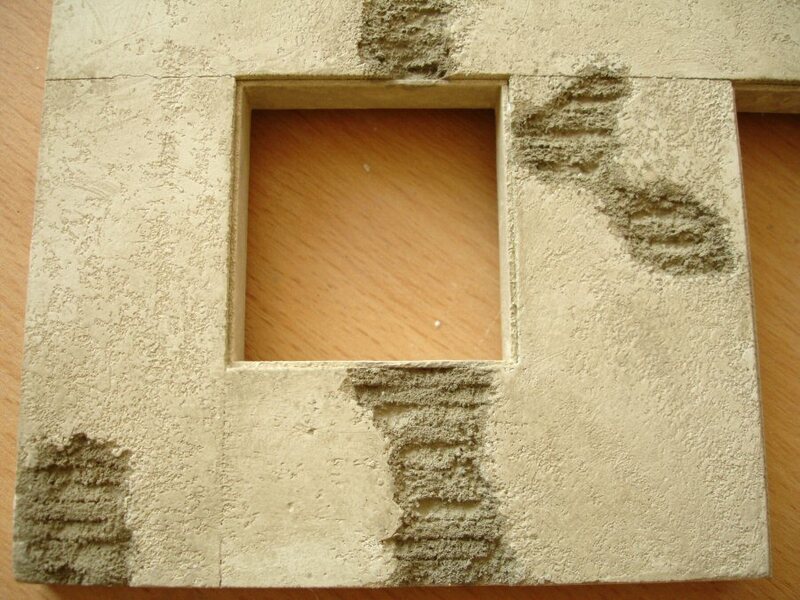 The technique of roughening the photo is very effective for simulating these peeling walls! The wire brush will break up the surface just enough to catch the light in places, taking us away from just the sense of a flat photo but keeping all the photorealistic nuances that would be difficult to achieve with a brush. 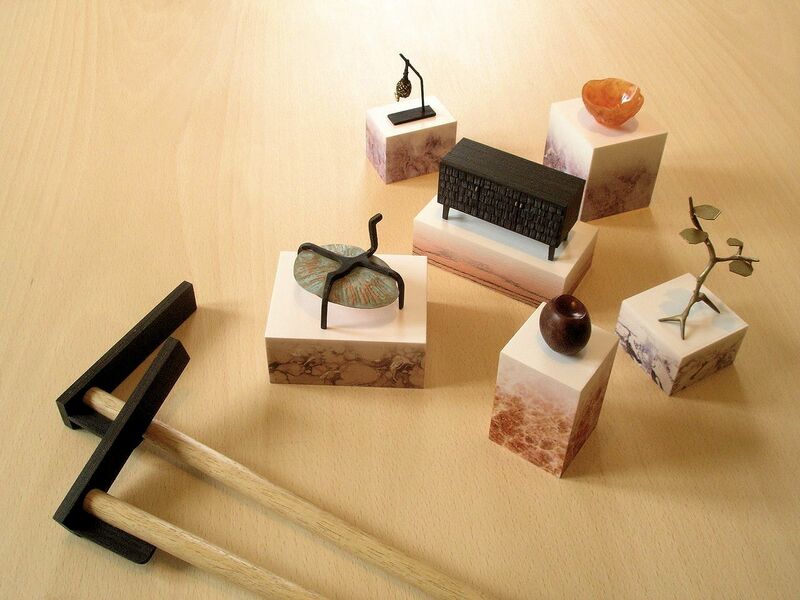 Textures can also be applied on top, reasserting the three-dimensionality. 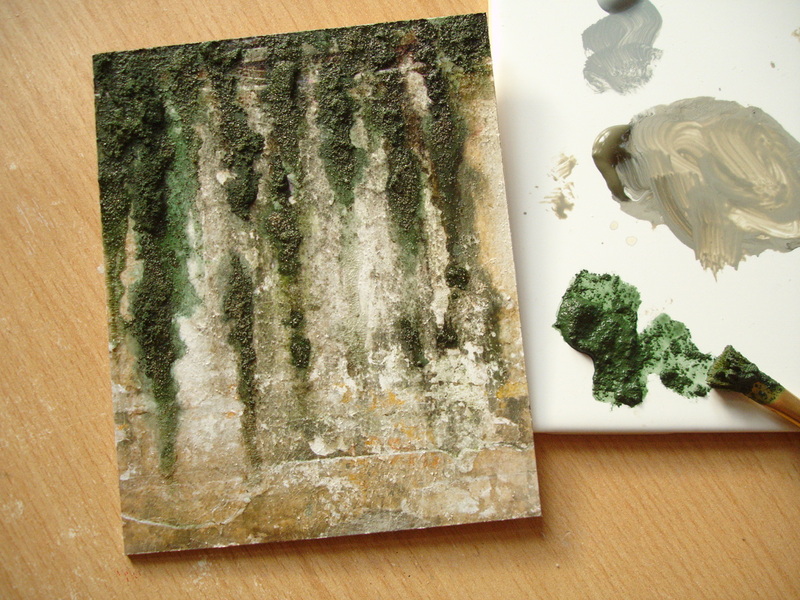 Here I’m building up fungus or moss with a mix of acrylic paint, Pva and sand. I feel it’s worth showing the following examples of printing on very thin tissue paper even though I’ve only ‘dabbled’ with the method so far and am not sure about its usefulness. It’s certainly effective for applying a pattern to curtain folds created in Kapa-line foam shown earlier. 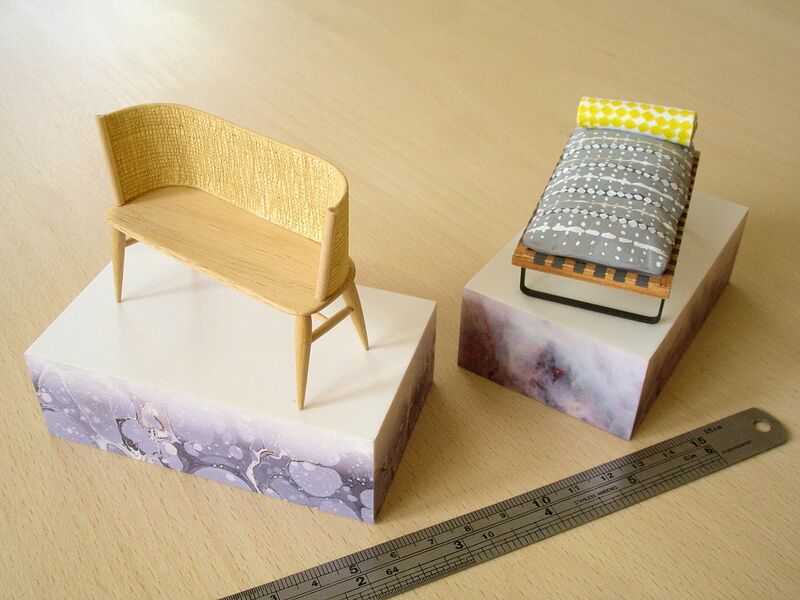 There’s more about this, and how to print on tissue paper, at the end of Using digital images on ‘realspace’ models – Part1 from January 2013. I haven’t been able to find a cleaner phrase yet for the technique of brushing on a layer of glue and scattering something granular into it to create a surface. I tend to use it a great deal for representing plant foliage, but otherwise only very occasionally when the right ‘look’ can’t be achieved by any other means. 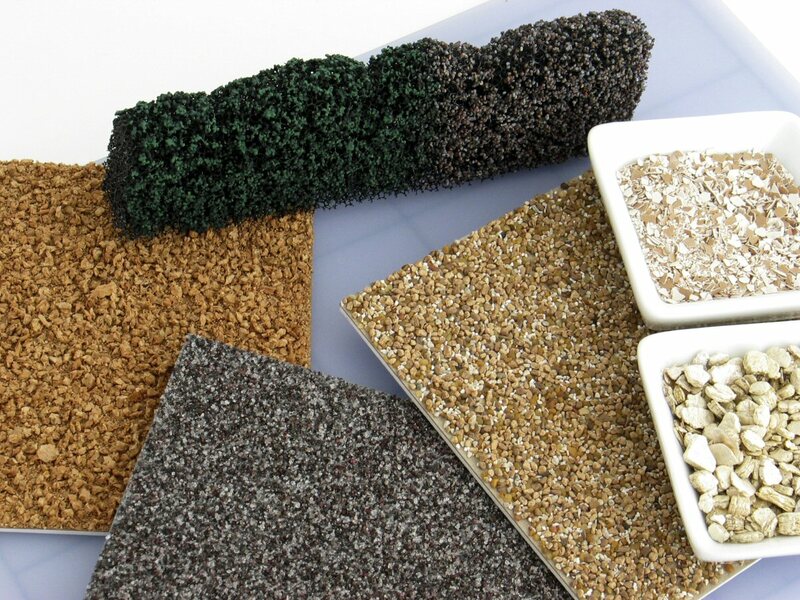 For example, I can’t imagine there’s a more effective way of achieving the surface of a sloping pebble beach than hunting down the right colour and size of mini-gravel (from a shop selling scenic model materials or a pet shop selling aquarium supplies) and using that to cover a surface you’ve carefully shaped. Those are the challenges .. the terrain shape has to be created first by another means, one can’t mound this stuff into shape and expect it to stay there; secondly success in achieving the look that you want is so dependant on managing to find the ‘right stuff’. 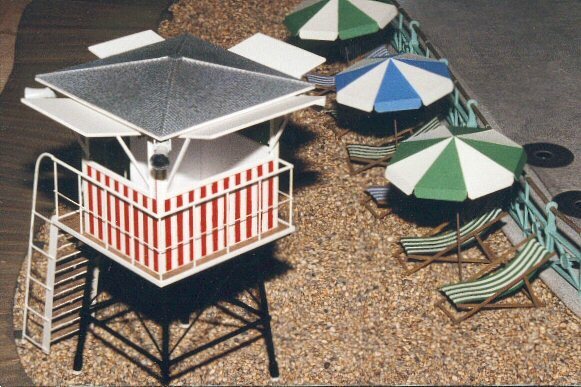 For example, back in 1999 when I was working on part of the presentation model for one of the Millennium Dome exhibition spaces I managed, after days of looking, to find an aquarium gravel that was so perfect in every way to recreate the shingle of Brighton beach in 1:25 scale .. shortly afterwards the shop closed down and I’ve never found anything remotely like it again! 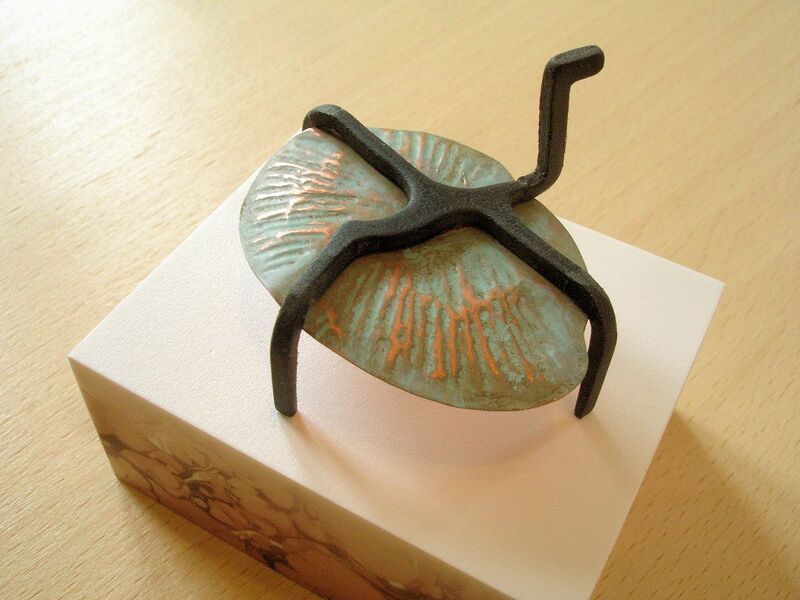 Below is the only photo I have of that part of the ‘Living Island’ model. 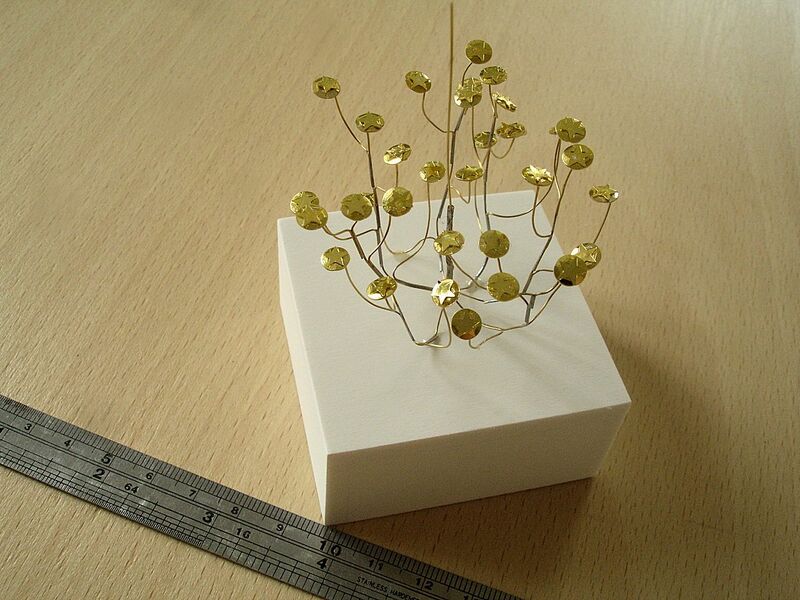 Below is a piece of hedge, shaped from a piece of open-celled foam, covered with poppy seeds to create the effect of small leaves. 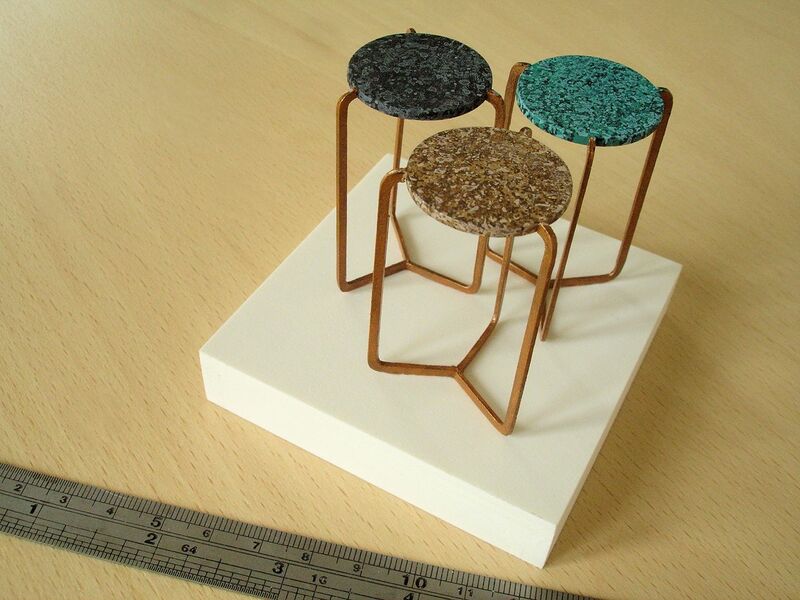 The other materials featured include granulated cork, railway modeller’s ‘ballast’ and crushed eggshell. Textures can be created by ‘gluing and scattering’ and then painted to give a different appearance. 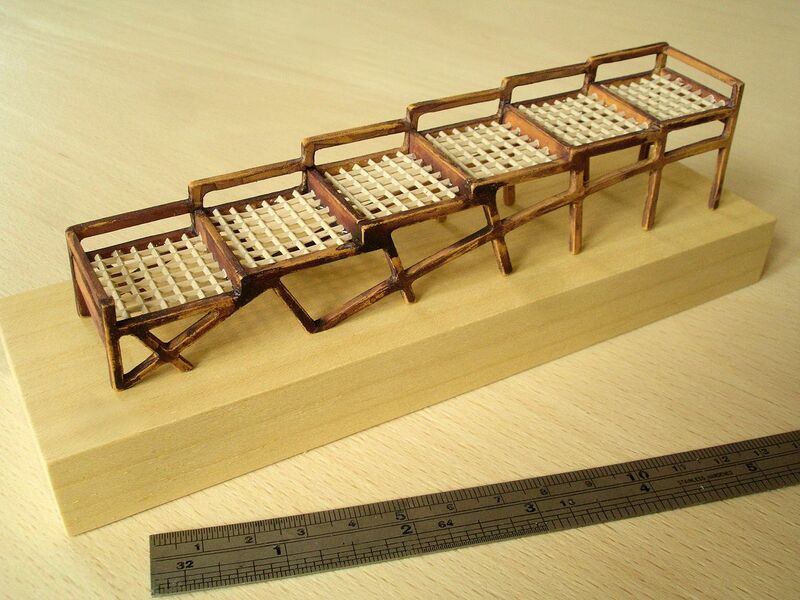 Below are fine sand, sugar and ‘ballast’ compared to their painted versions underneath. Sugar can be sprinkled onto a thin layer of glue without dissolving too much but I’ve painted it with a spirit-based undercoat. 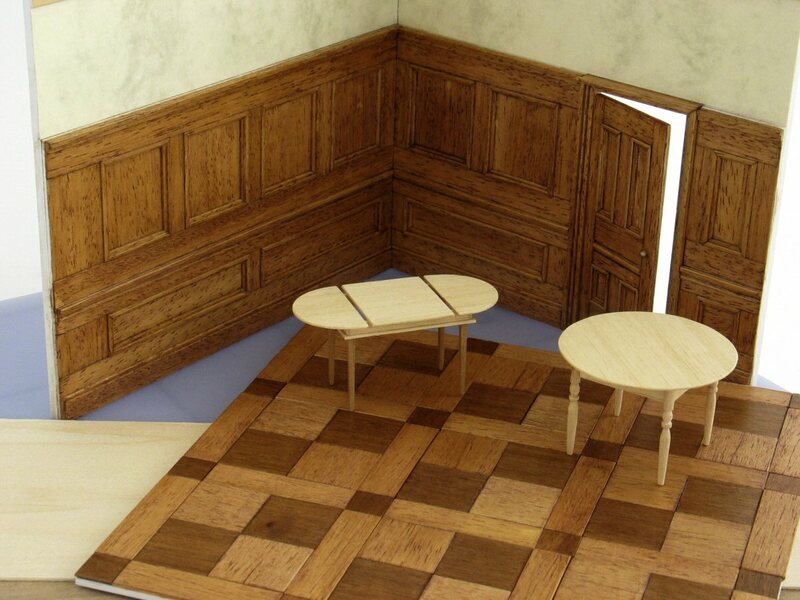 If wood is an important part of the setting you are designing, more often the case at least with the floor and the doors, it’s natural to think of using real wood in the model to convey this, although as I’ve shown the effect can be simulated with other materials. 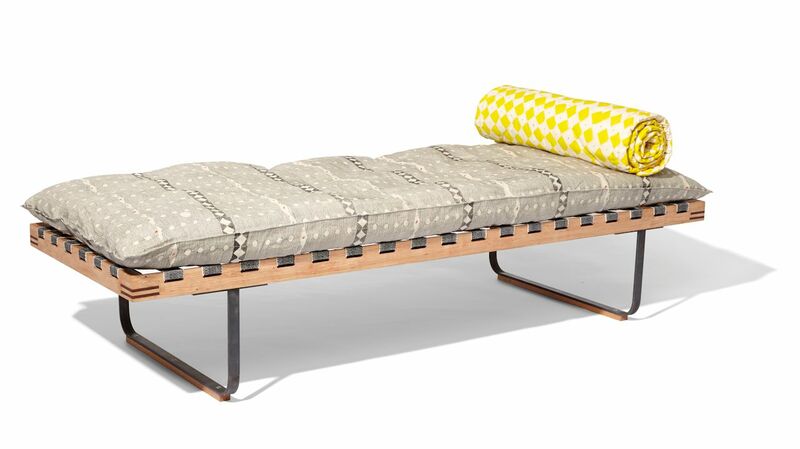 If a tight-grained, evenly coloured wood such as obeche, bass or balsa is used it just looks so right, in spite of the fact these are strictly speaking out of scale. 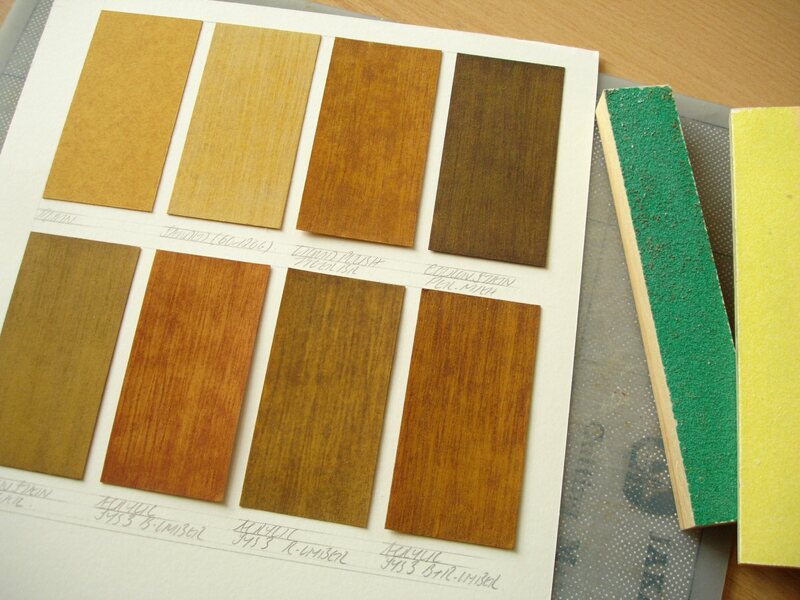 These woods will also accept staining or varnishing in a ‘true to life’ way. 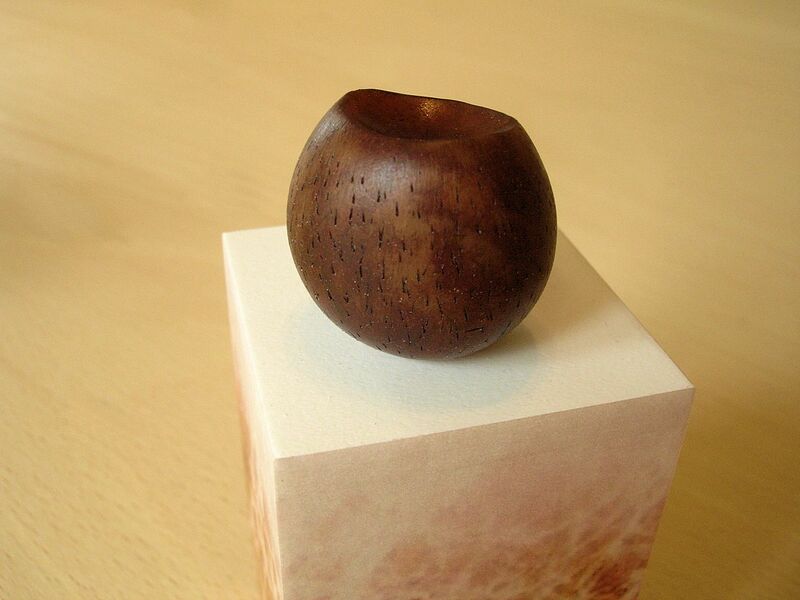 As a material wood evokes a lot of sympathy .. we’re all very familiar with it, it’s sustained and supported us for many thousands of years, we’re grateful towards it .. hopefully! 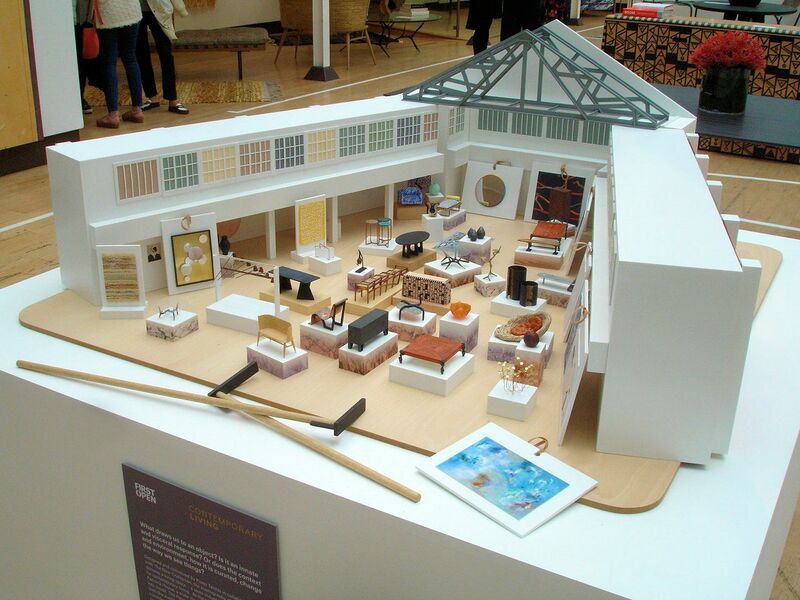 .. and I do think that plays a part when people say that they just like using wood in the model for whatever purpose. However, even if the wood is thin so that we don’t have to use saws to cut it, it is not as easy to work with as cardboard or plastic. 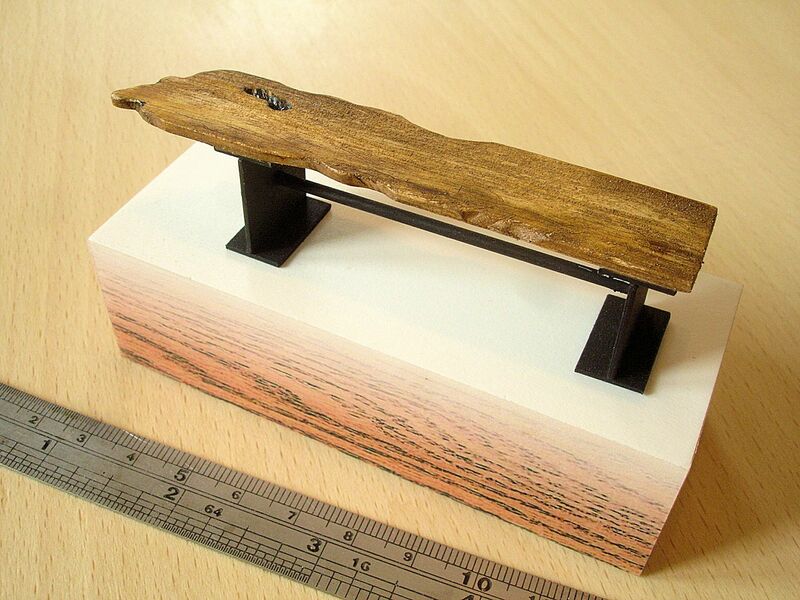 When I say ‘thin wood’ I’m referring to the small sheets most commonly found in model shops measuring 100x915mm, the thinnest (and best choice) being 0.8mm thick. 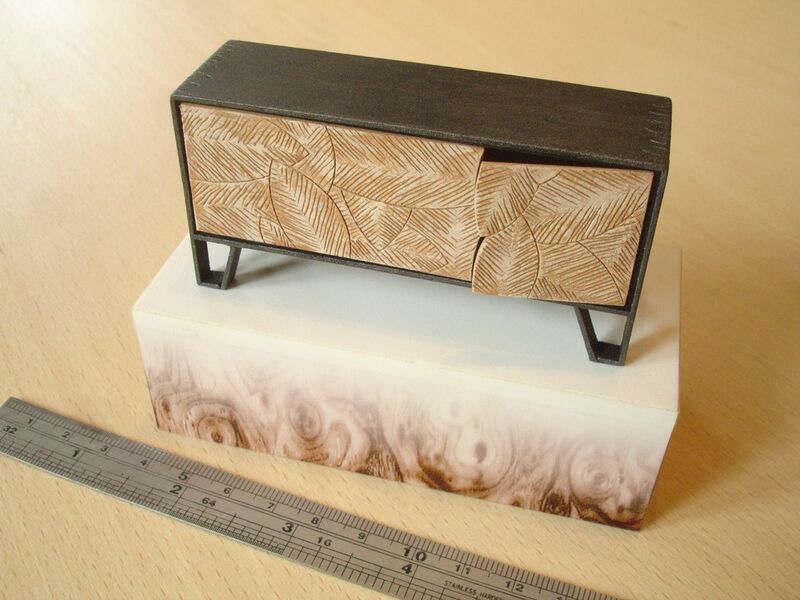 I’m not speaking about either wood veneer, which is most often thinner, or fine-scale modeller’s plywood. 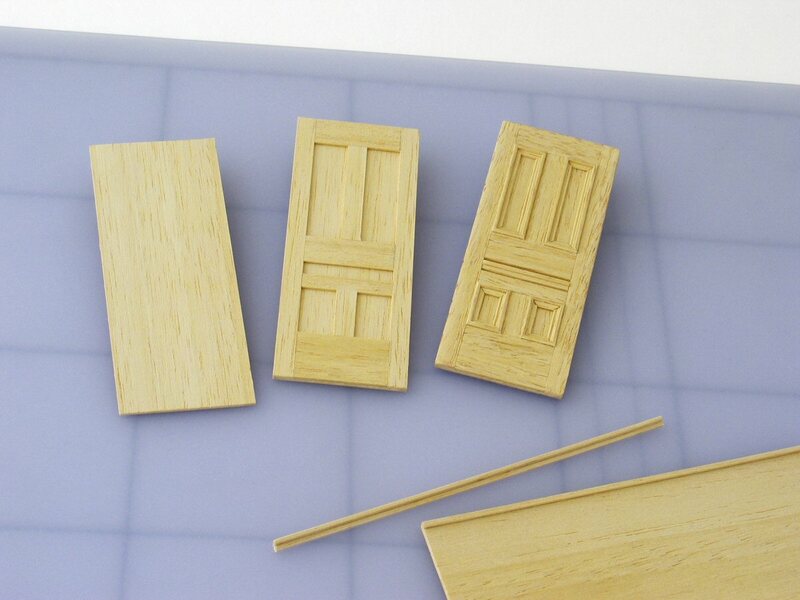 As for veneer, I found the ones I tried in the past expensive, difficult to flatten and brittle while even the thinnest modeller’s plywood was tougher to cut with a scalpel. friendly’ appearance but spruce is different and it would be a mistake to use this for fine panelling in a 1:25 scale model. 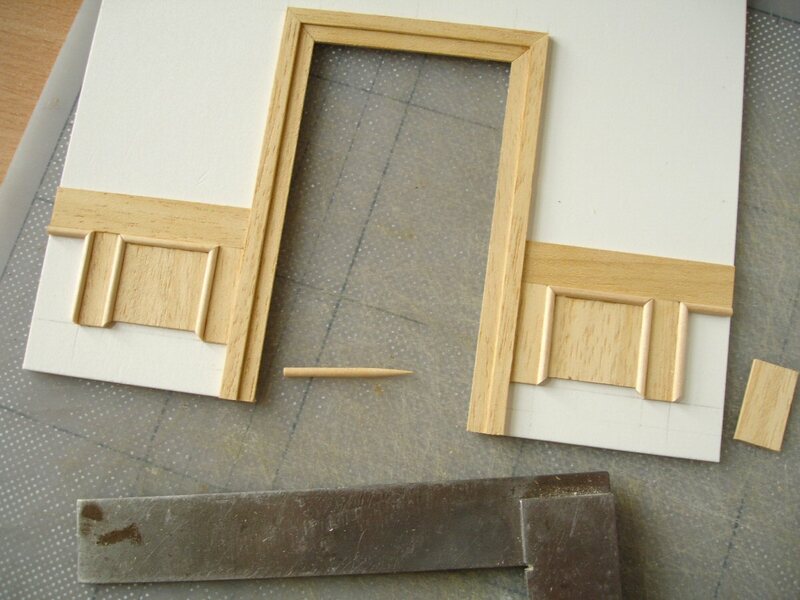 I set up the photo below to illustrate the main stages of building up panelling, whether for doors or walls .. the base-layer, the framework and then the edging details. 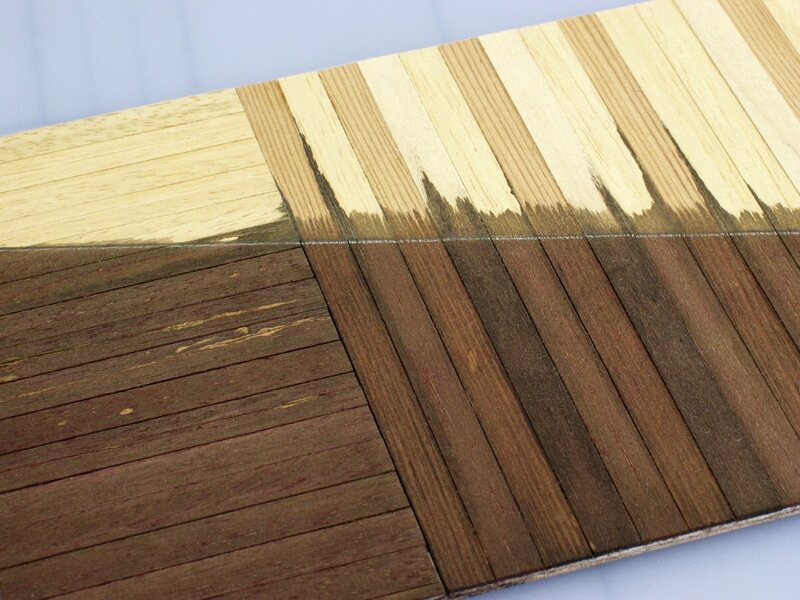 Since the base layer is mainly there to show what’s in the panels it’s important that the grain of the wood should run in the right direction. 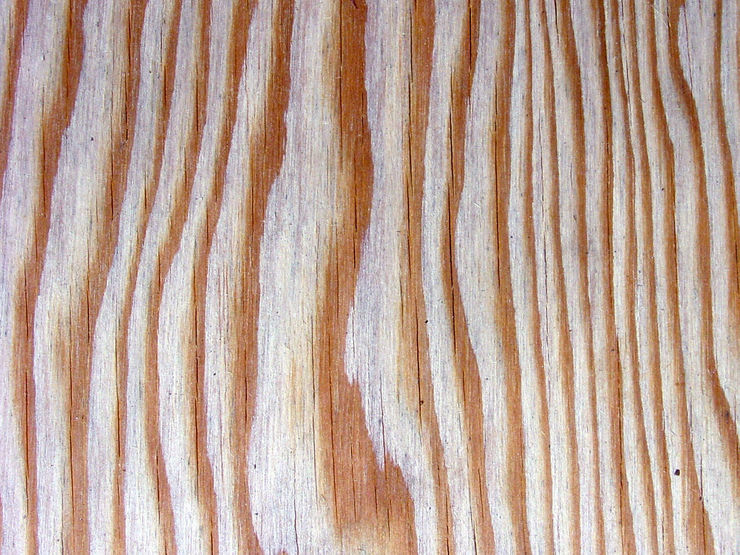 It’s a characteristic of almost every panelled surface that the grain of the wood follows whichever is the longer side of the rectangle. It’s also structurally ‘unsound’ (speaking of the real-life construction) if the grain of the wood goes in any other direction than the length. So the framework which I have shown on the middle example below has to be pieced together from separate strips. Unfortunately there’s no shortcut (i.e. cutting windows out of a continuous piece) because this just wouldn’t look right! 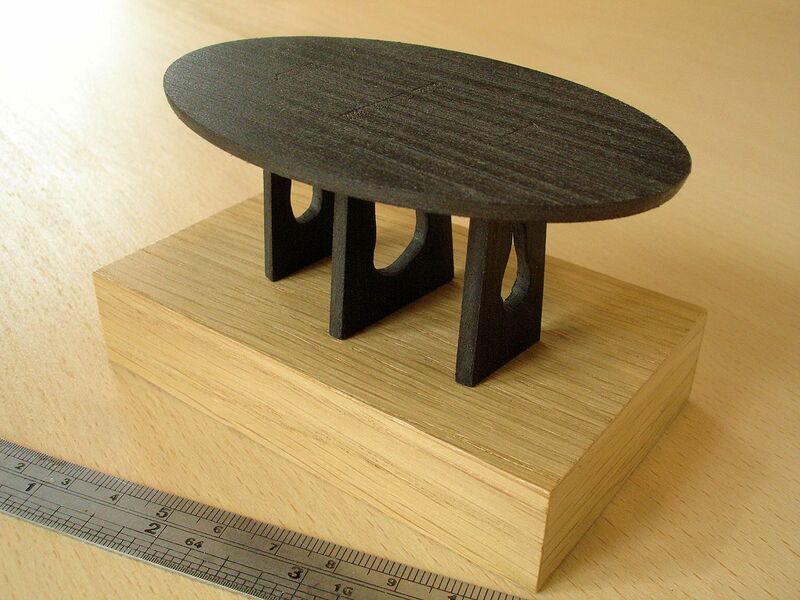 Another feature of real-life construction which the model has to copy if it is to look convincing is the mitred join, that is, when two pieces connect at a 45degree angle as shown below. 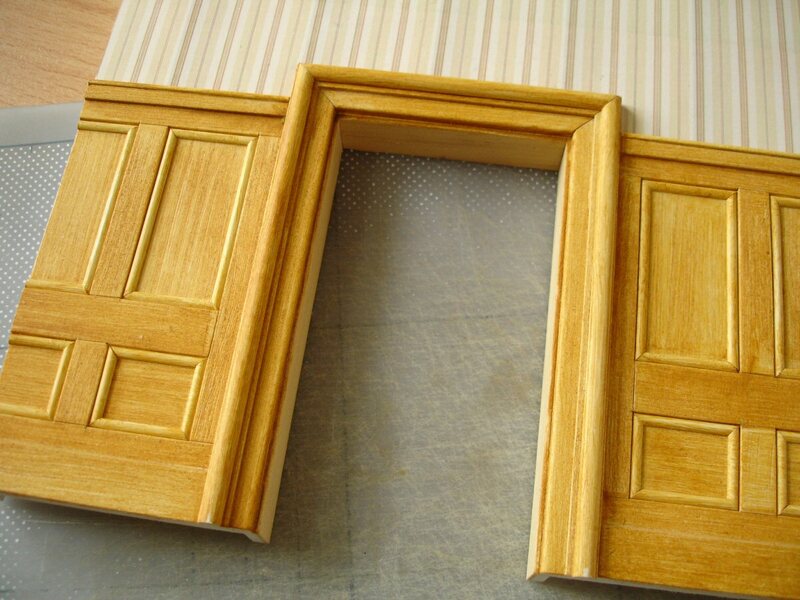 This is especially common on door or window frames, often because the profiled strips (i.e. having a particular, stepped shape) can only be joined this way. I describe the best methods for doing this in the post Making walls – Part 3 from February 2013 and this applies to working in wood even though there I’m using plastic. In the example shown here I’m gluing thin obeche wood onto Pvc plastic. Superglue has to be used for this, and it’s important to realize how little is necessary! 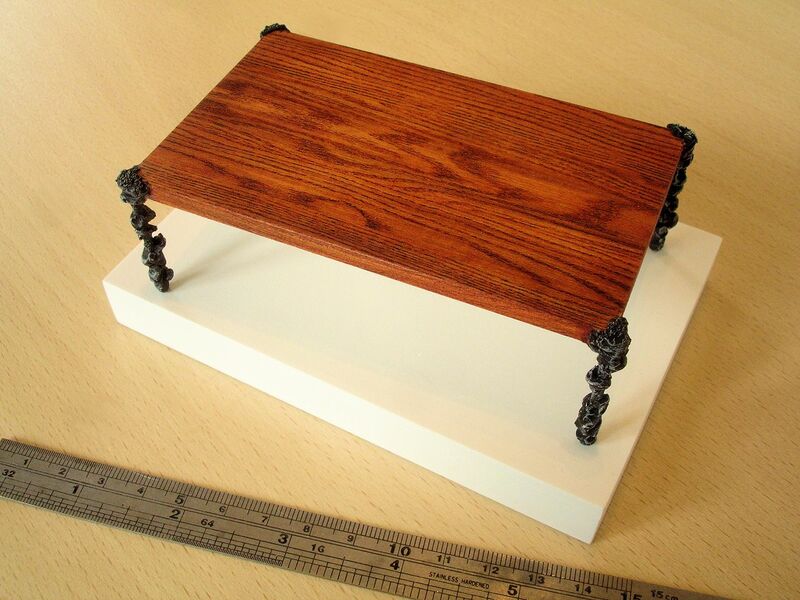 In the first place it’s best to put the superglue on the plastic rather than the wood because it will soak in too quickly and may even infiltrate to the other side. Secondly only miniscule spots of glue are needed to secure the wood pieces to the plastic firmly .. certainly the opposite of smearing glue all over! Think of it more like using tiny nails .. only a few are needed, at the ends or corners and perhaps in the middle. 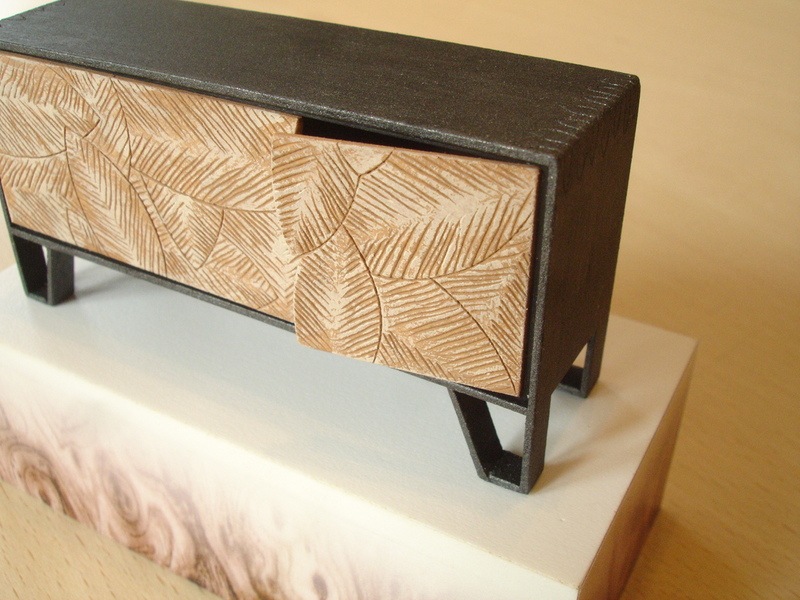 For this piece I’m using small portions of cocktail stick inserted between the pieces of sheet wood to create rounded profiles. An important final touch, before staining or varnishing, is to take a piece of very fine sandpaper and ‘clean’ the hard edges a bit. 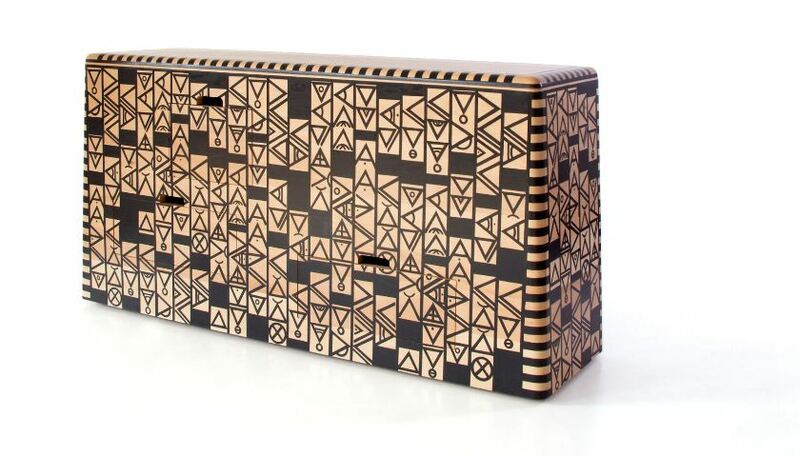 It wipes away any loose fibres or splinters and generally softens the look a little, making it look more ‘in scale’. If for any reason you prefer to make up lengths of profiled strips separately, rather than building them up bit-by-bit as above, it makes more sense to assemble these together using the edge of a sheet. Below I’m making a profile strip composed of three separate pieces but gluing the top two on the edge of the sheet first before I cut the larger bottom one. This just makes the strips easier to handle. I’m also using the clean side of a sanding block as a guide to glue up against. 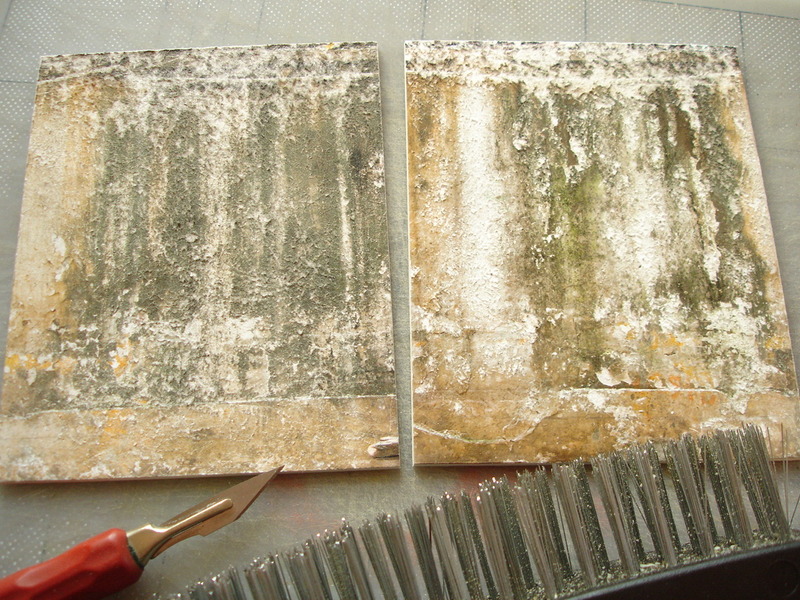 More about stains and varnishes will be included in the next post on Painting. It’s important however to be aware beforehand how certain woods will react to staining and it may affect the choice of wood you use. 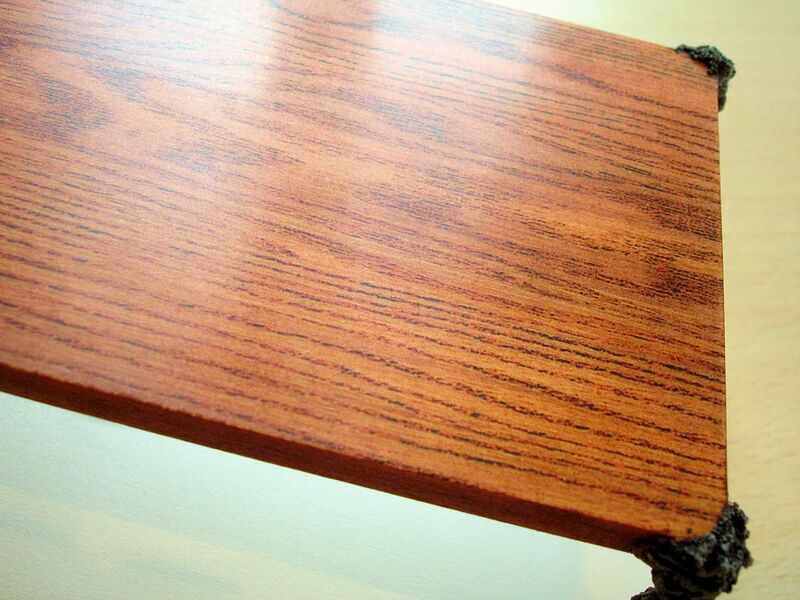 As an example, the lighter strips of bass wood included below have become much darker than the others when stained. 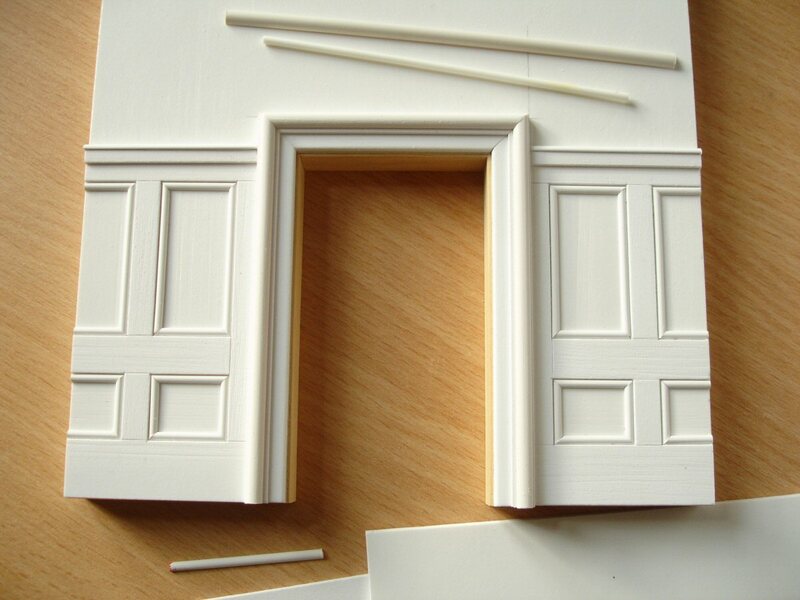 Below is a different method of creating the look of elegant wood panelling using plastic or thin card and adding thin, round brass rod. Normally it’s difficult to glue metal securely in place but it works if the rod is rubbed with fine sandpaper or Emery paper, fixed in place with Pva glue and, once this has set, given another coat of Pva glue on top to seal it in. This is why the article has become so long! 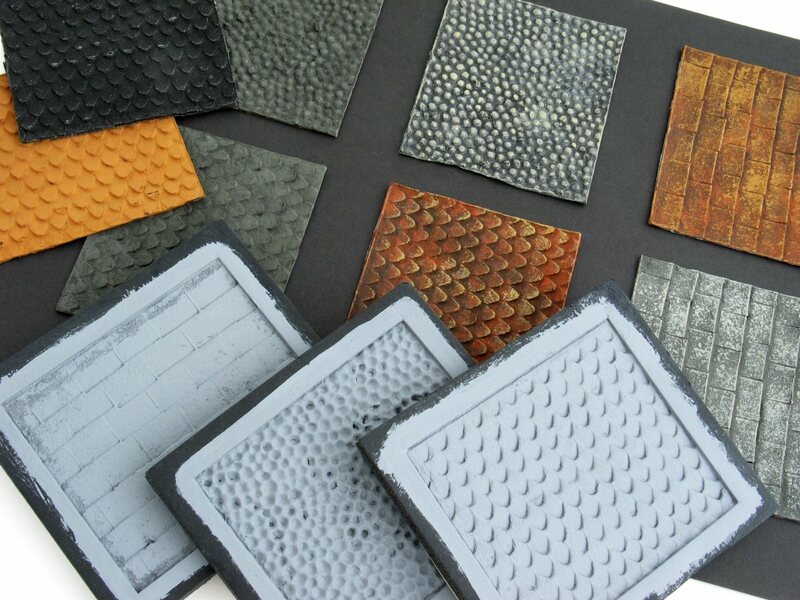 .. there are so many different surfaces to be catered for, let alone the variety of materials and methods that can be utilized to represent them! For example, earth alone takes so many different forms .. dry, cracked, dusty, loose, moist, chunky, caked, muddy .. and research is important because it is likely to have a special appearance according to each geographical region. Moreover, whatever physical form it takes it is rarely one material of one colour, but composed of a number of things like the sample to the right below for which I added finely crushed eggshell, crushed brick and coarse sand to the mixture. In other words earth is predominantly granular, so just mixing a lot of colour into polyfilla and spreading it onto a baseboard will just look like Nutella! I usually have to create a mixture of Polycell ‘Fine Surface’ Polyfilla, with a little water to thin it; something granular such as sand, used t-bag tea, granulated cork, coarse sawdust or those mentioned above; and enough paint .. either strong acrylic, water-based paint toner, tempera or wetted powder pigment .. to turn it the right colour. 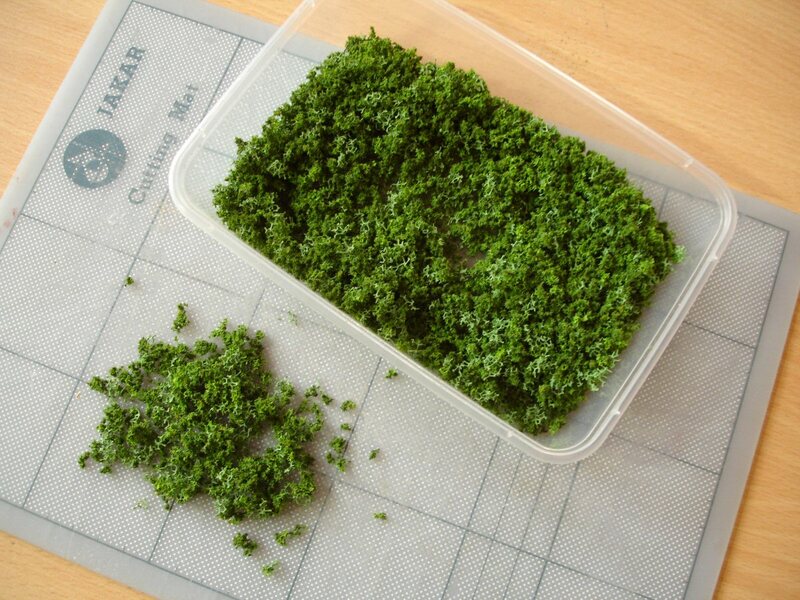 This can then be spread onto the surface and left to dry. The addition of the granular fillers also means that the mixture can be applied, even shaped, quite thickly, and it will still dry within a reasonable amount of time. 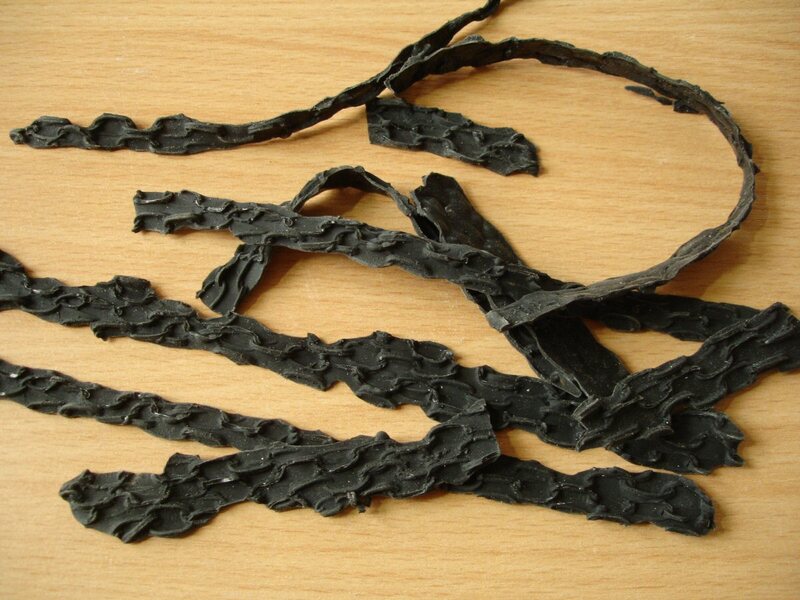 Moreover if the fillers used are partly absorbent, such as t-bag tea, cork or sawdust, they will speed up the drying time more and cause a similar pattern of cracks to real earth when it dries. If I’ve used coloured fillers such as the crushed brick and want to expose the colour of these more I brush the surface carefully with water to remove some of the acrylic before the mixture has fully dried. 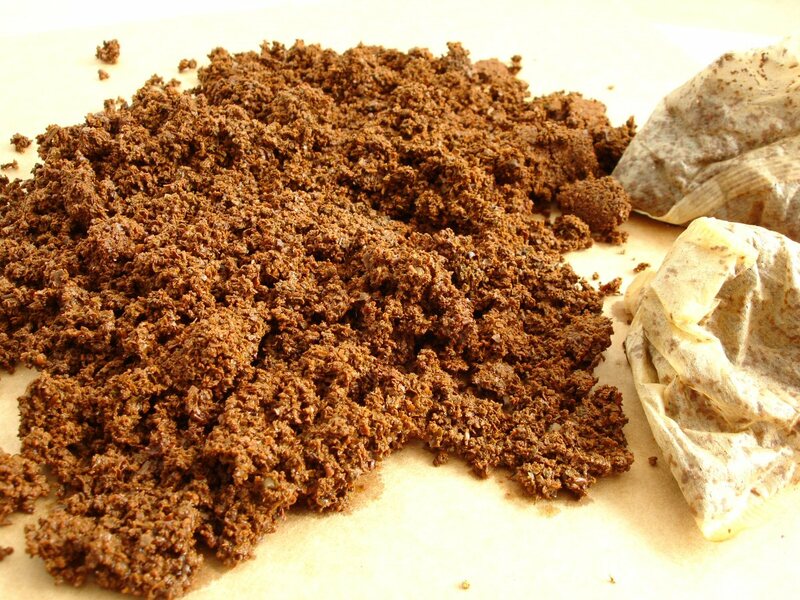 Above, the contents of used t-bags can make a fairly convincing soil on its own, if Pva glue is added as a binder and with some water-based stain or colourant if it needs to be darker. 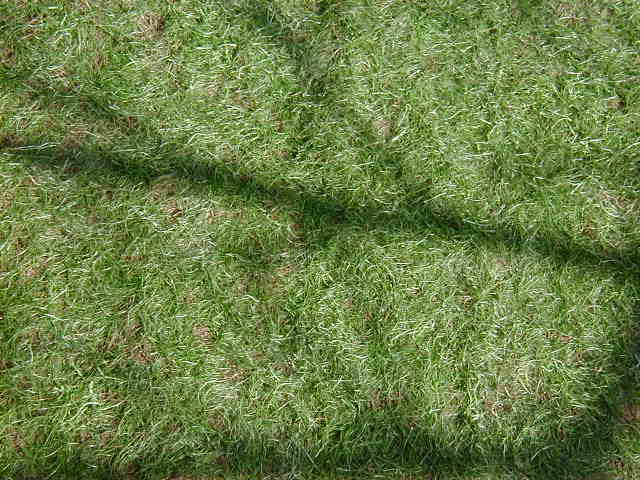 There are almost as many different ways of simulating grass in the model, though it’s much more difficult to achieve a convincing appearance or a particular type of grass than earth. 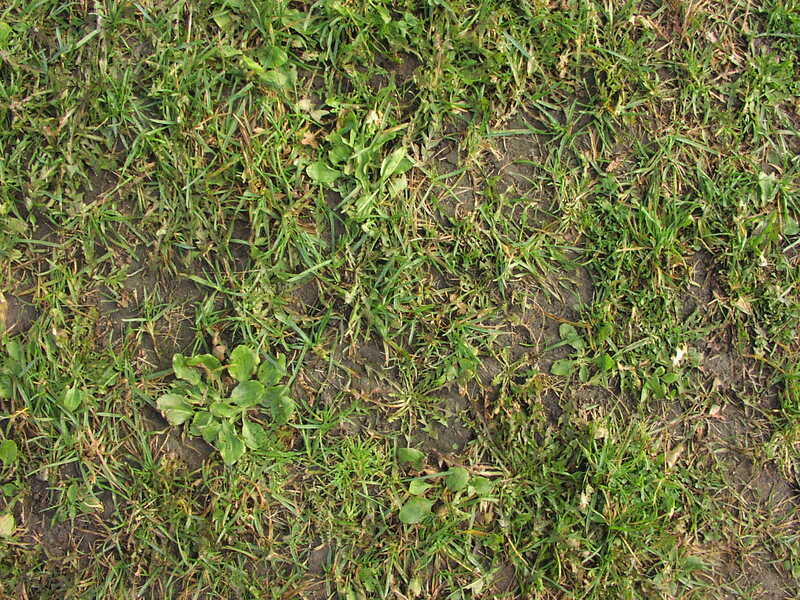 Below is a photo of real grass. You’ll see that it’s really very different from a Wimbledon lawn or AstroTurf .. there’s much more soil visible and it often includes many other leaf shapes. 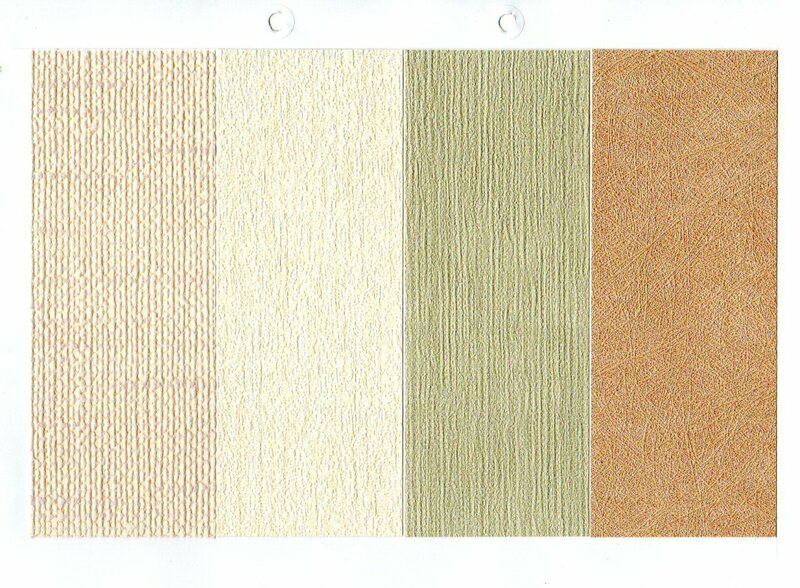 I developed a method which I felt reflected this more, principally using dyed sisal. 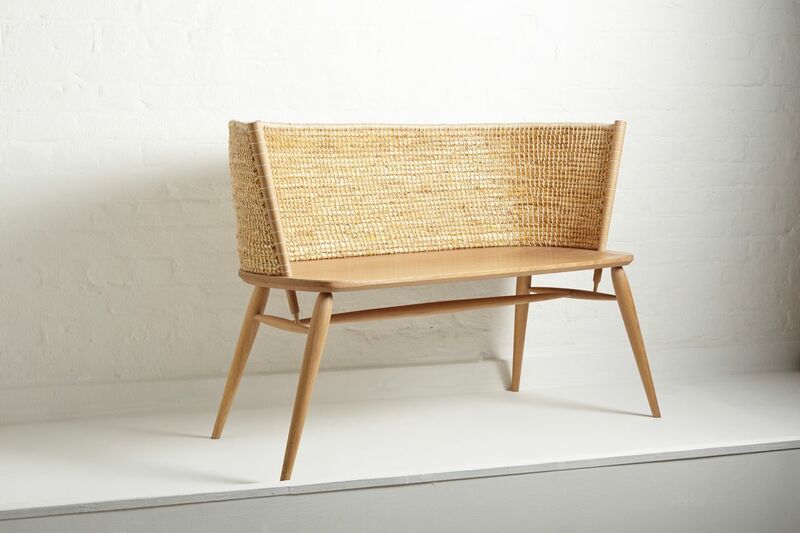 Sisal is a natural plant fibre, like hemp, and a convenient source can be found in garden stores. Loosely compacted sisal is used to make the liners for hanging plant baskets and luckily the sisal is usually dyed green already! I make up a soil mixture using polyfilla, colourant etc. 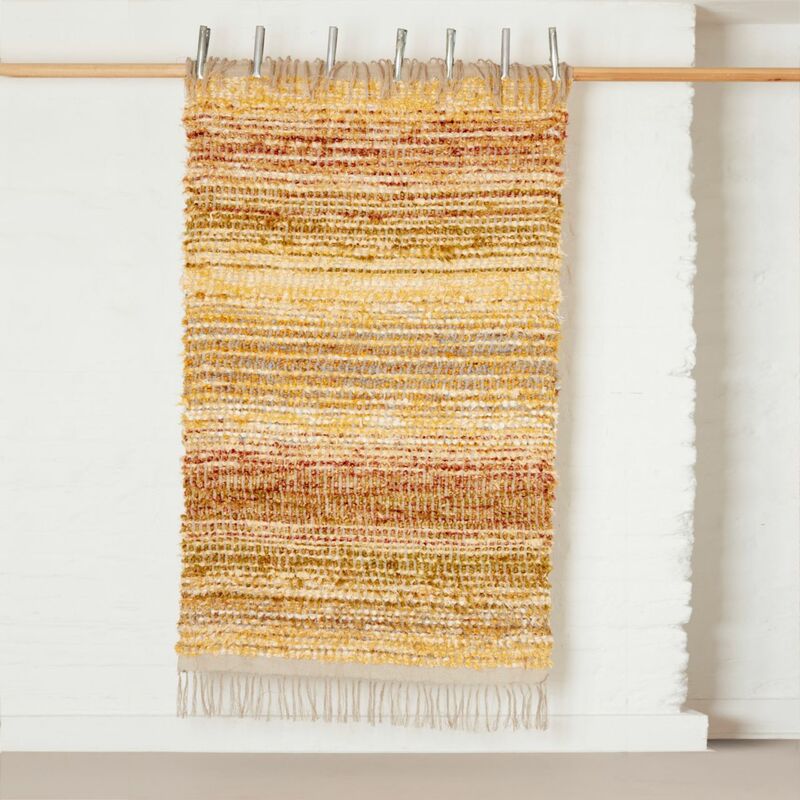 as previously described and press clumps of this sisal into it. When the polyfilla has completely set (it’s best to wait a day or so) most of the sisal has stuck firmly but can be teased up for long grass or cut down for shorter grass. I’ve added some dyed sawdust to the pieces below to give some variety. Below is a close-up, followed by a fuller looking version for which I clumped the sisal more tightly together and then enhanced the green a little using some spraypaint. 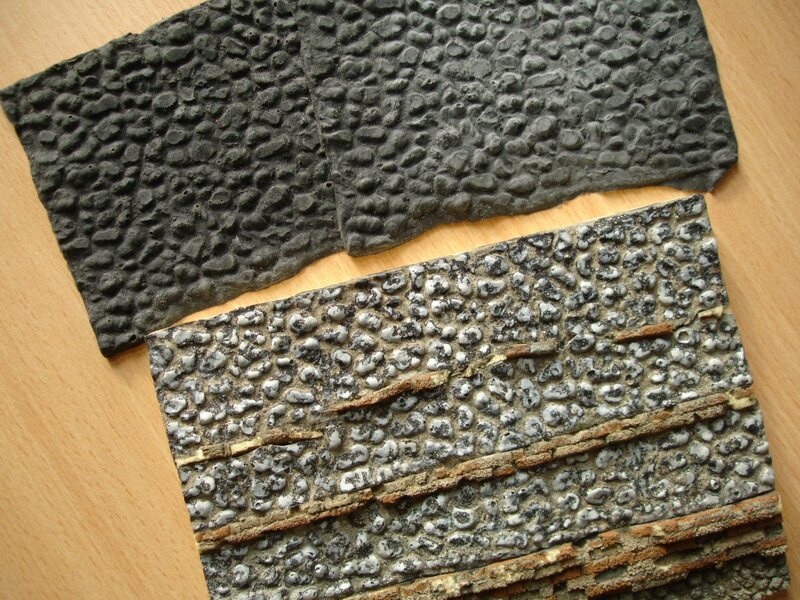 Other materials which can be used to simulate vegetation include various types of the open-celled foam already mentioned. 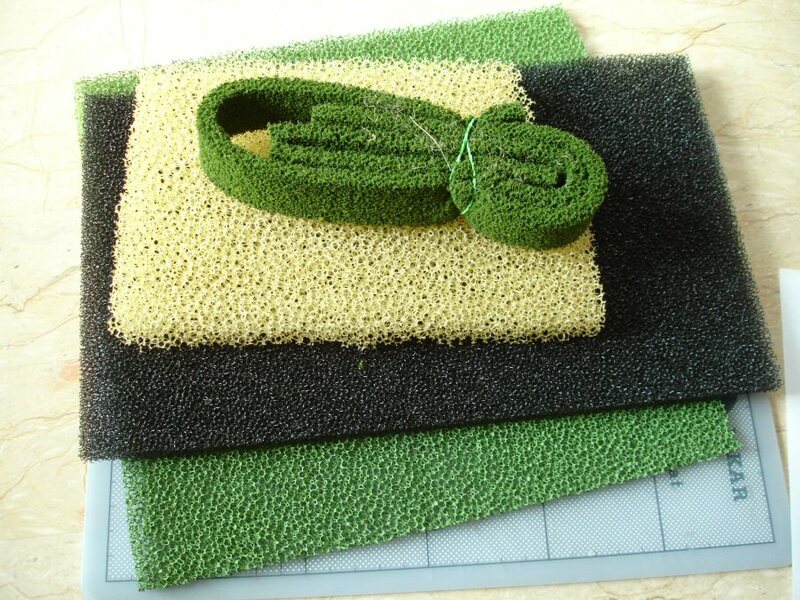 The proper name for this is reticulated foam and it is manufactured as an industrial filter material. 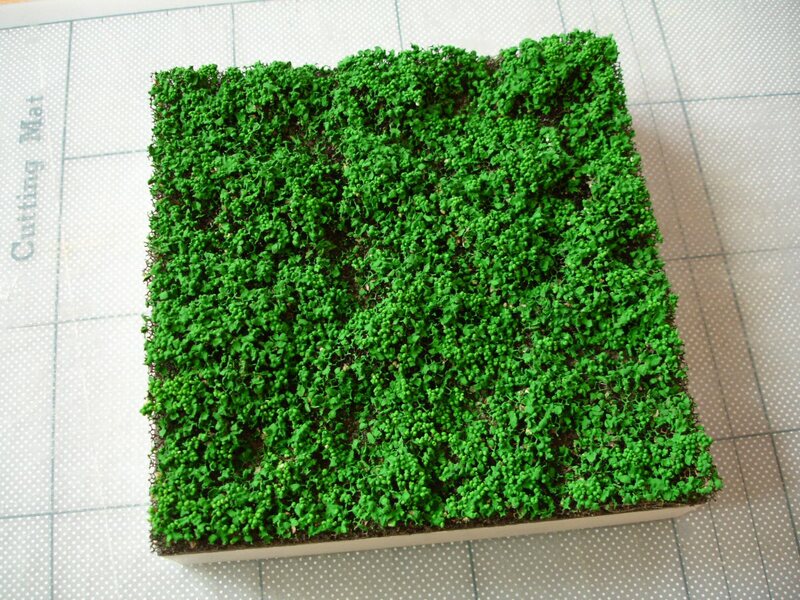 Green-coloured versions can often be found in model supply shops, such as the hedge strip on top of the pile below. This makes a very useful ‘scatter material’ when pulled apart into little bits. Below I have shaped a surface using a sheet of reticulated foam (pulling bits out or snipping with scissors), dabbed this with Pva glue, sprinkled on a mixture of poppy seeds and coarse-ground black pepper, then painted this with thinned acrylic. The advantage of using the reticulated foam as a base is that it doesn’t look too solid .. there’s some ‘see through’, some depth seen underneath .. and the mixture of granules stops the coverage from looking too regular. 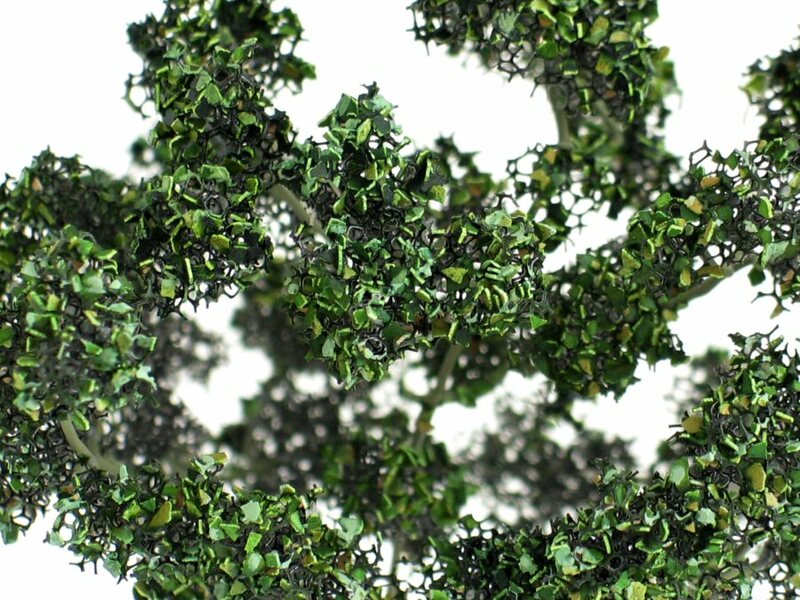 I often use reticulated foam to build up some mass on model trees (see the previous post in this series on Modelling and shaping) and another favourite for suggesting the appearance of leaves is crushed eggshell. Methods borrowed from the domain of mouldmaking&casting tend to creep in everywhere in these articles but the following one is not solely due to my special interest in it .. I was shown this a long time ago when I was studying to be a theatre designer. Liquid latex will dry as a thin and durable skin, so if it’s applied in a suitable mould, structured surfaces can easily be cast. 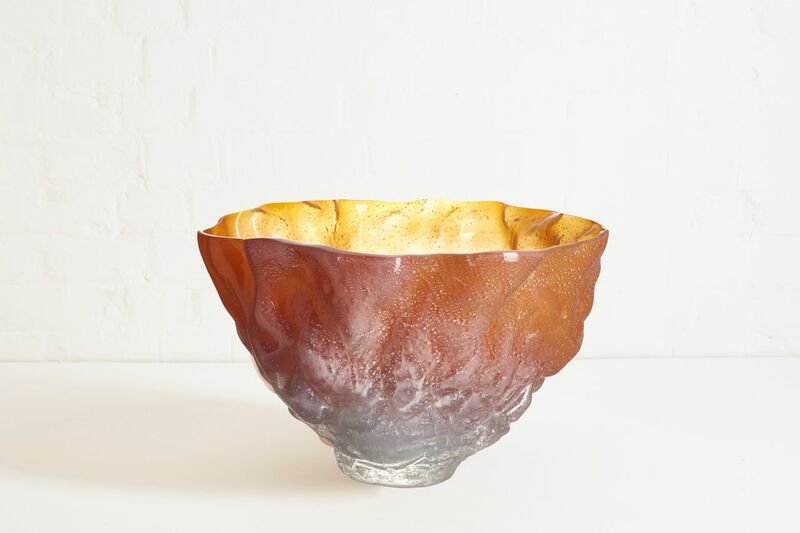 On its own latex will dry out to a translucent pale-amber colour but because it is water-based it will accept small amounts of acrylic, tempera or powder pigment mixed in to give it a base colour. 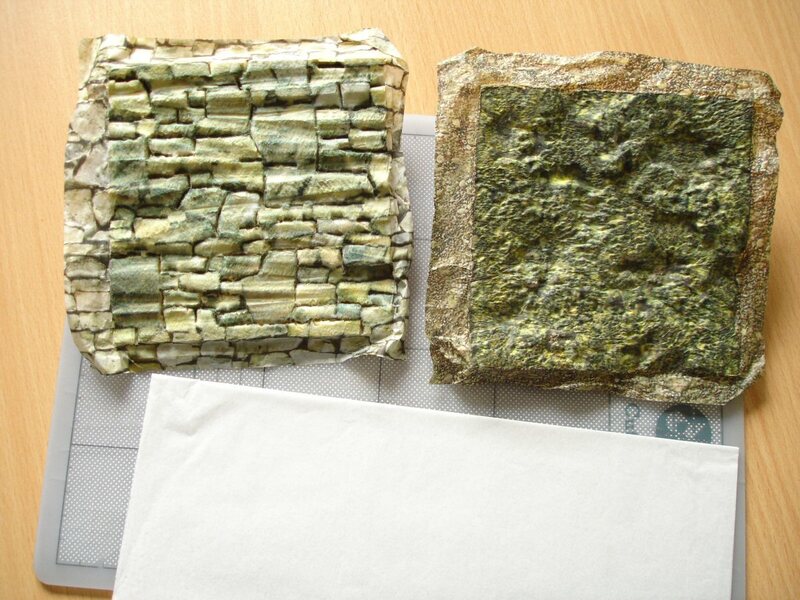 Below is the representation of a flint wall surface and the ‘skin’ casts I’ve used to piece this together. 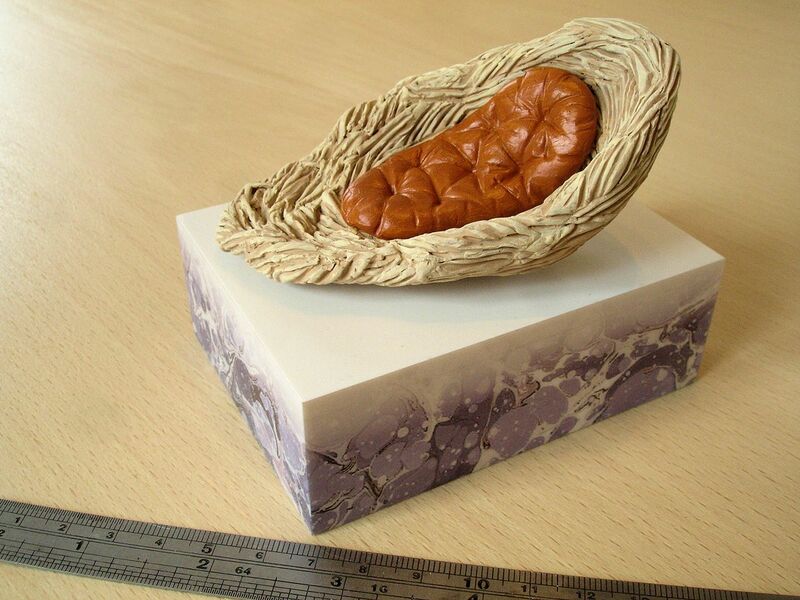 I modelled the original for this (I usually use the word ‘prototype’) as a flat rectangle in plasticine, then made the negative .. the mould .. from it using plaster. Once the plaster is dry the mould can be covered with latex but this is difficult using a brush (as the latex congeals very quickly on it) so it needs to be poured in, rocked around to cover the surface and then any excess drained away. This is important because latex must be allowed to dry out in thin layers, otherwise this can take a very long time. 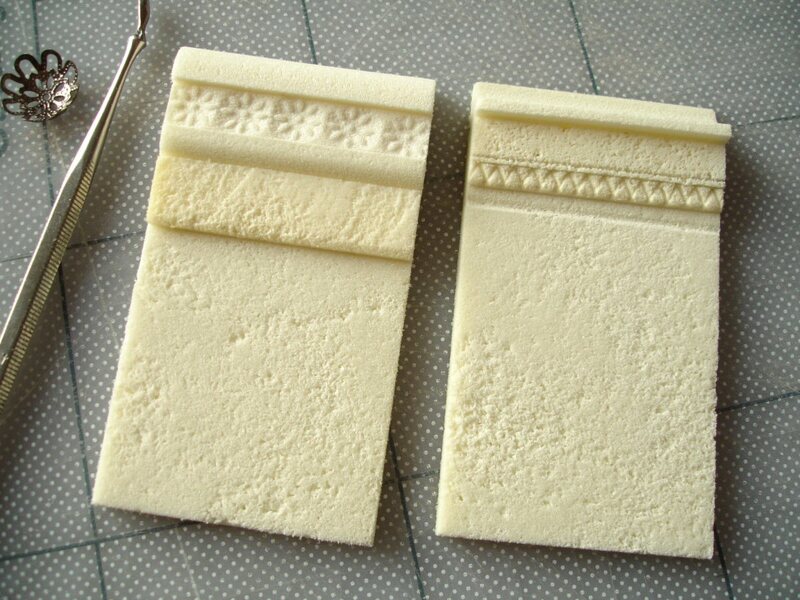 Plaster is ideal for making the mould because a good one (i.e. 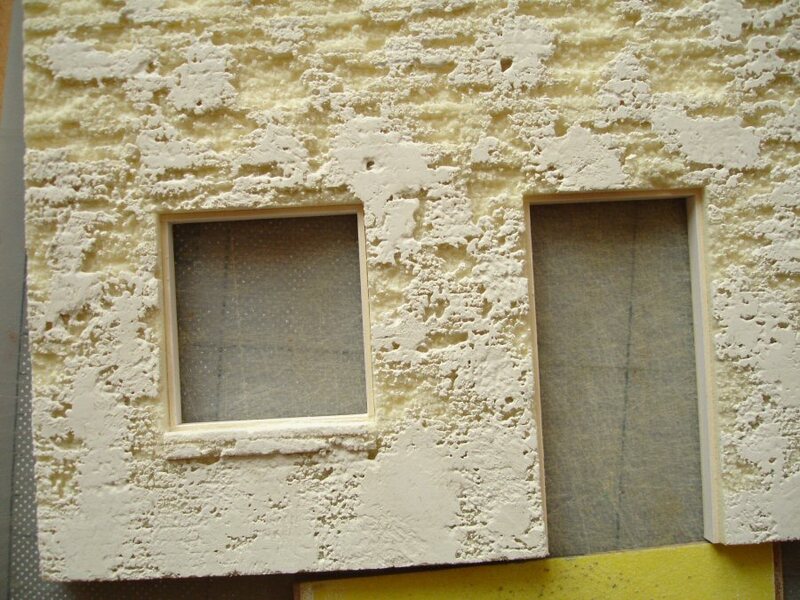 a fine, quick-setting, durable casting plaster) will reproduce every detail of the prototype and the plaster mould will quickly absorb much of the water from the latex, speeding up the drying process. As another example .. for an animation project I needed to create the effect of a large mound of coiled chain in the model, but using that amount of fine-scale chain would have cost far too much so I decided to try faking it using latex. 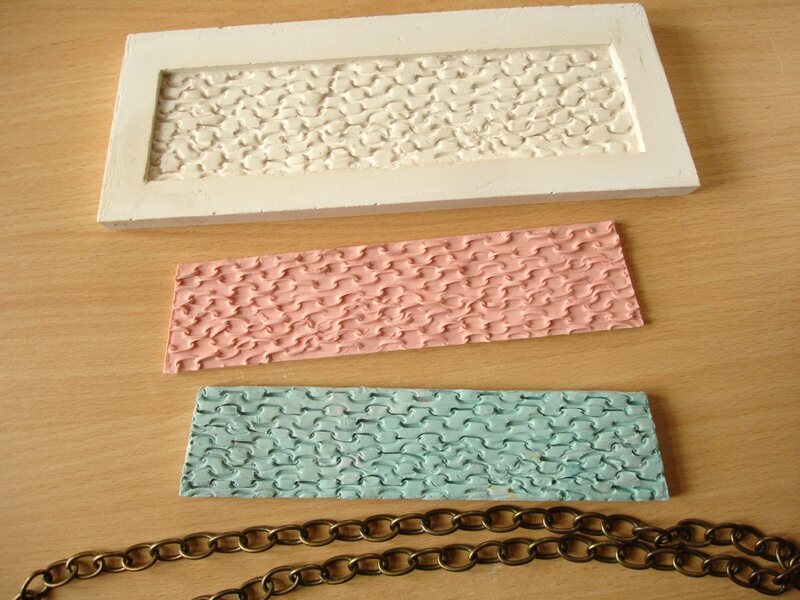 It was a little more involved than I’d anticipated because I had to start by making impressions of real chain in plasticine but making a plaster mould from this would just give me negative impressions again in the latex. So I had to make another ‘cast’ on top of this using silicone rubber .. all the stages are shown above .. which could then be covered in plaster to make the correct mould. I wouldn’t have been able to simply cover the original plasticine with latex because it doesn’t dry on it. I then cut the latex skins up into jagged strips, which was necessary to confuse the joins, and stick them onto the base I’d made for the mound form. The only type of glue which works properly for this is a rubber contact adhesive such as Evo Stik Impact or Dunlop Thixofix. Below is the finished result which I had to select just a detail from because of copyright. 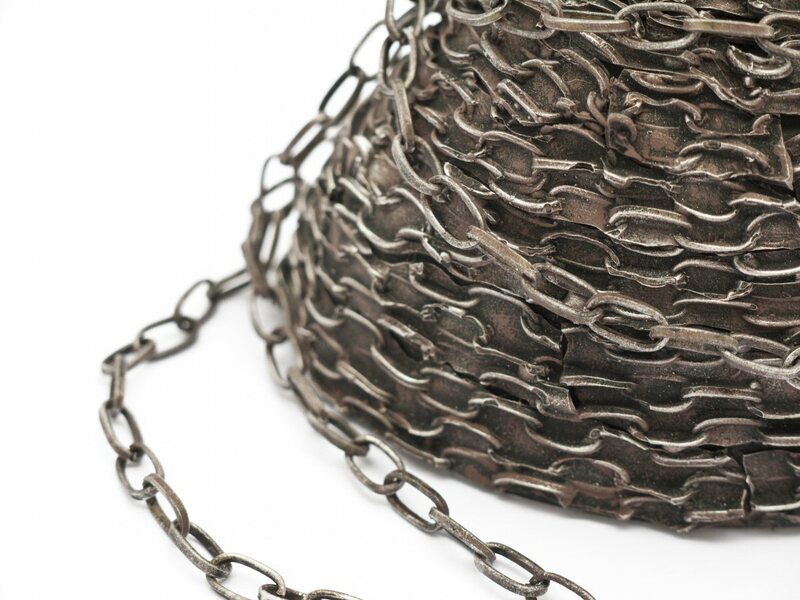 There are only a few strands of real chain used here .. the rest I’ve dry-brushed with enamel paint and ‘Treasure Silver’ which is a wax-based, metallic paste applied with the finger or a cloth. Latex is not easy to paint fully, which is why it’s always better to mix in colour first. Enamel paints (the small tins from Humbrol or Revell which I’ll say more about in the final post on Painting) grab onto latex very well, but standard acrylic may not stay. There is a special medium called Prosaide, used as a glue for sticking latex prosthetics to the skin, which can be mixed with standard acrylic to make it paintable on latex. 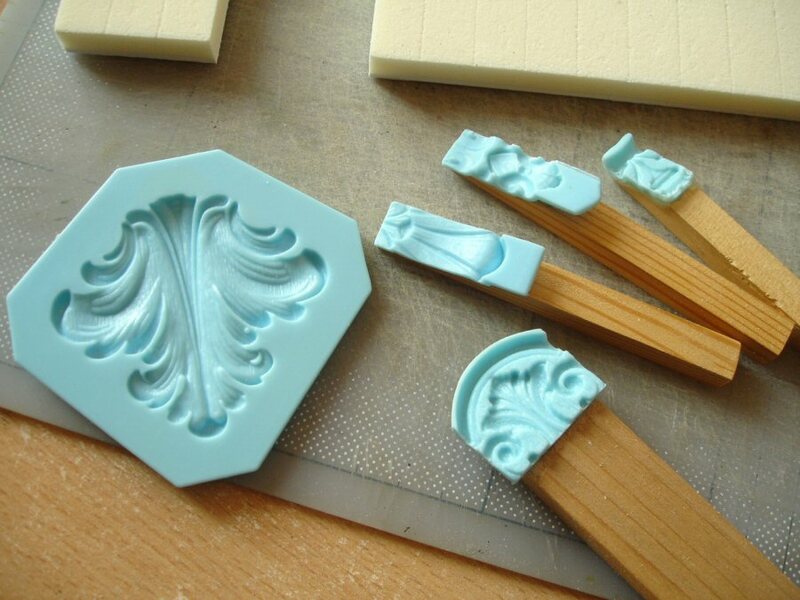 There is a much quicker and simpler method you can try if you’re not planning on using the mould a lot. 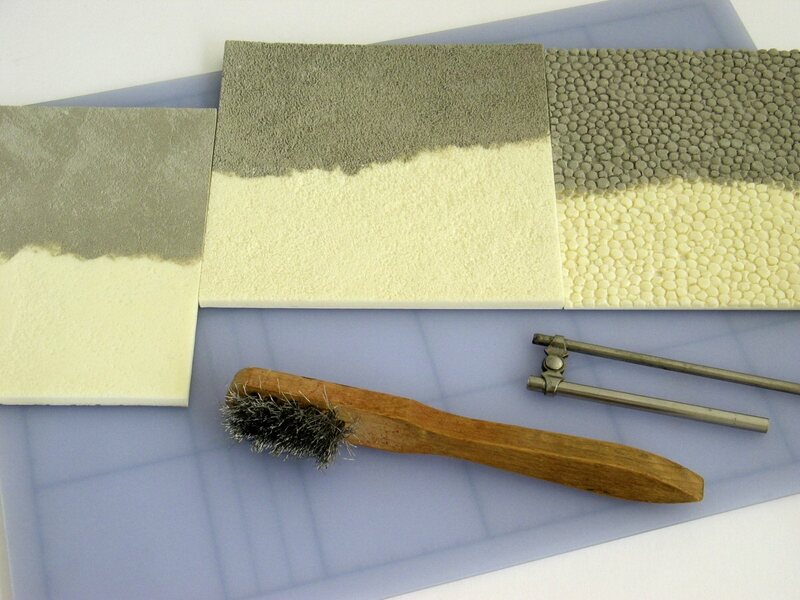 I made the sample skins below using moulds made by directly pressing tools into Kapa-line foam. 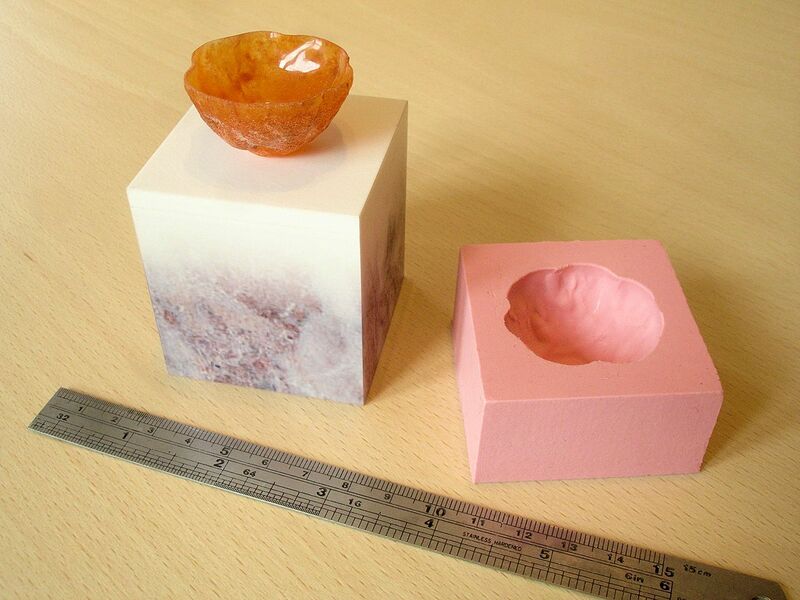 These moulds are shown below, and I’ve made impressions in the foam using the ends of paintbrushes, a small metal ruler and the rounded end of a jigsaw blade. There’s little difference between this and the foam texturing described earlier .. except that this is working ‘in negative’. It’s difficult to predict exactly how the latex ‘skin’ casts will look .. but sometimes the results are very .. positive! The most important practical part to remember is that the foam surface needs to be sealed properly before latex can be applied, otherwise it will stick. Here I’ve used a grey wall emulsion paint but cheap tempera, gesso or any water-based undercoat should work. I also dusted the moulds with talc before using them.